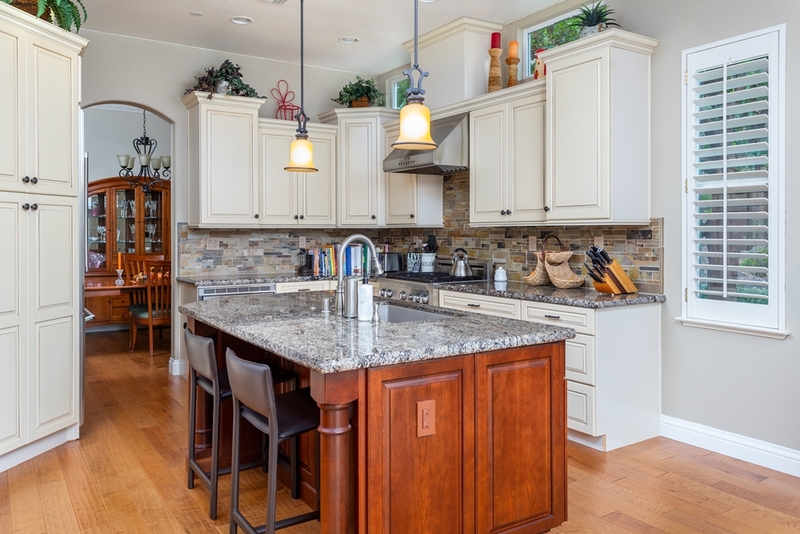 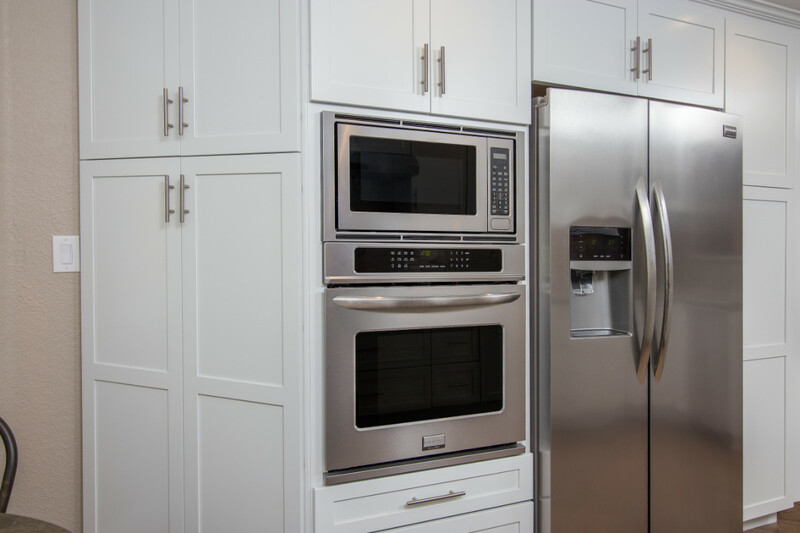 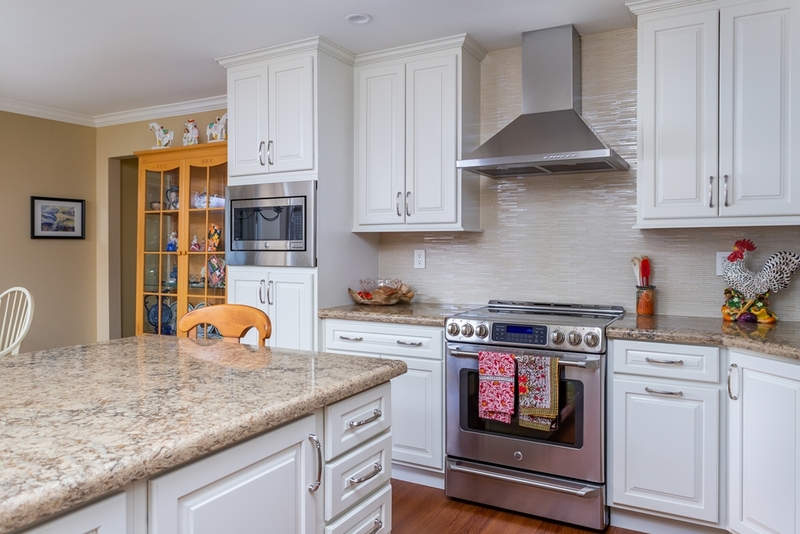 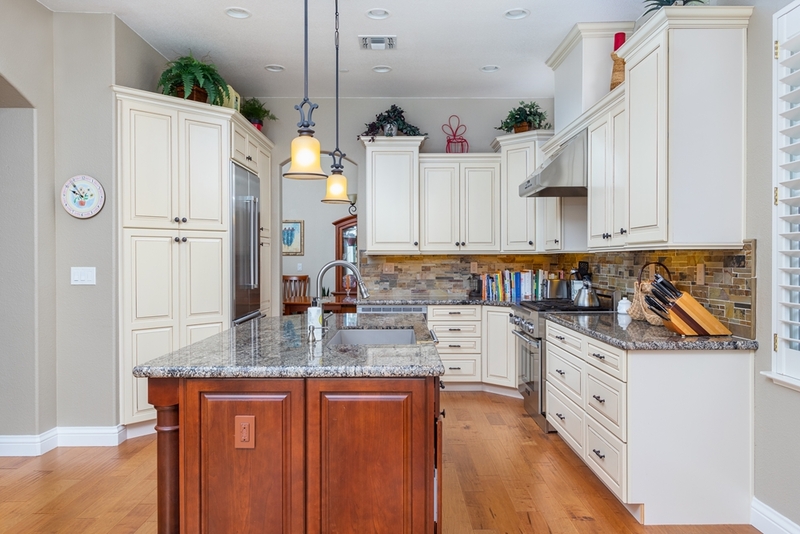 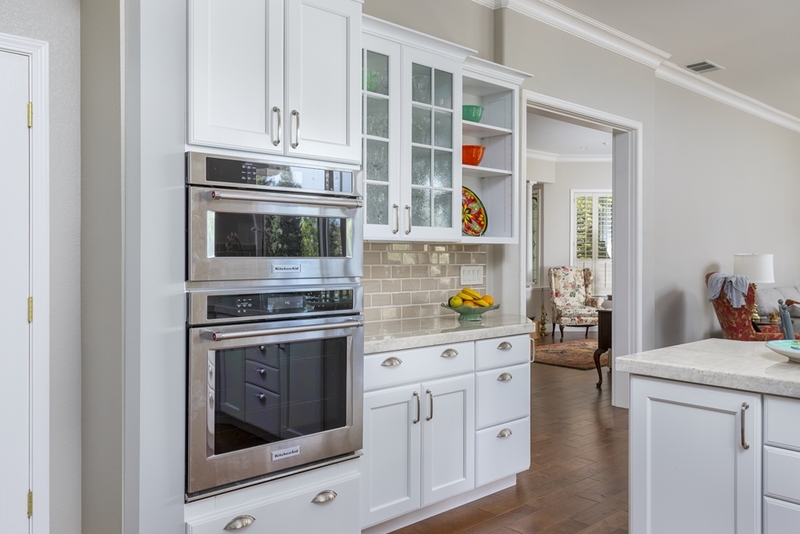 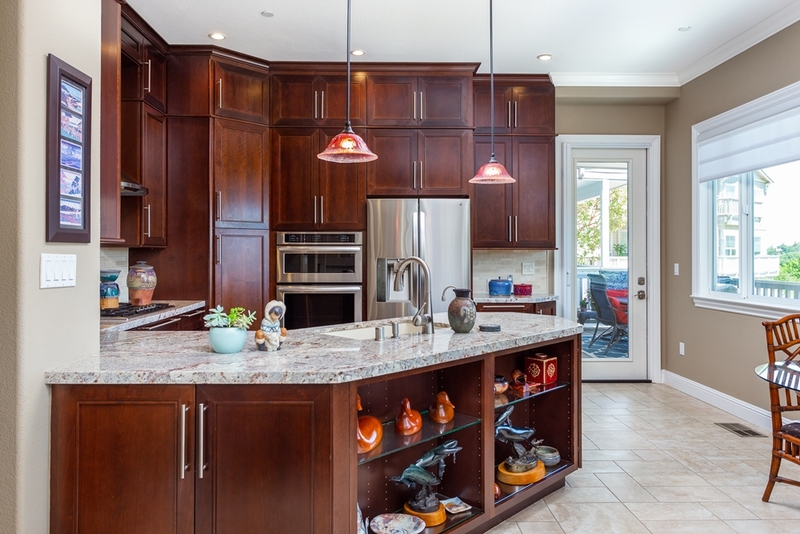 Reconfiguring this kitchen so that it worked for the client’s needs was very important. 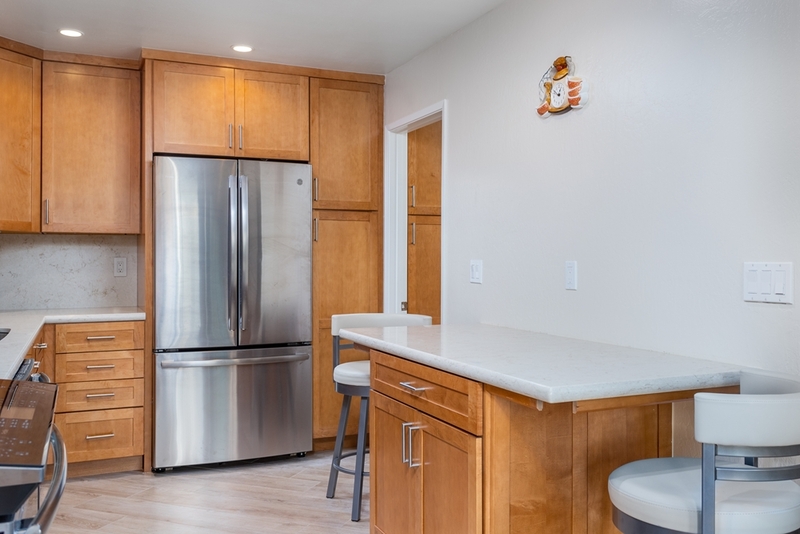 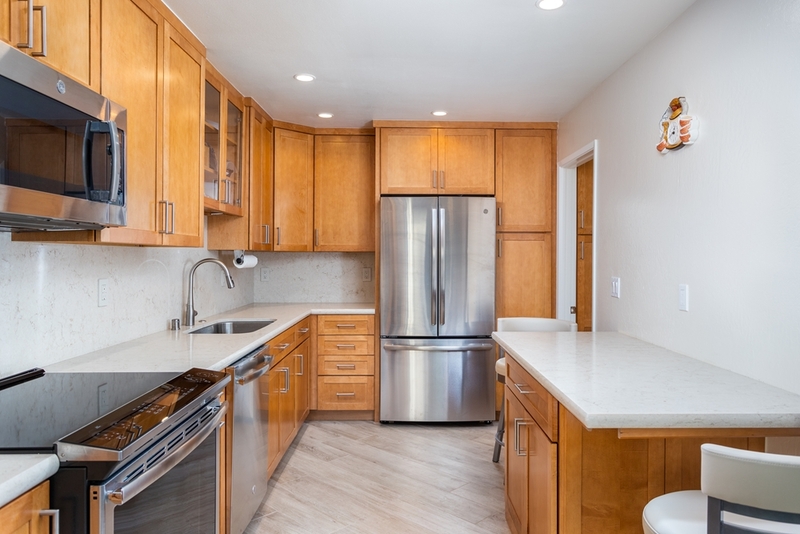 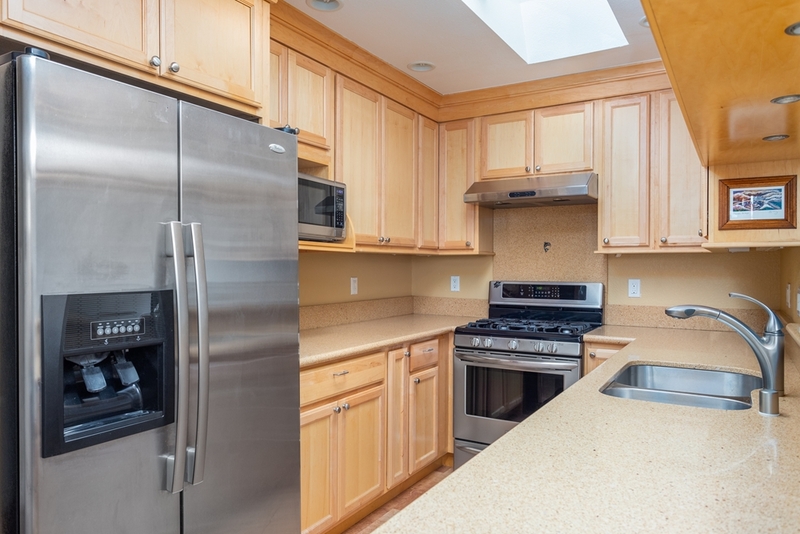 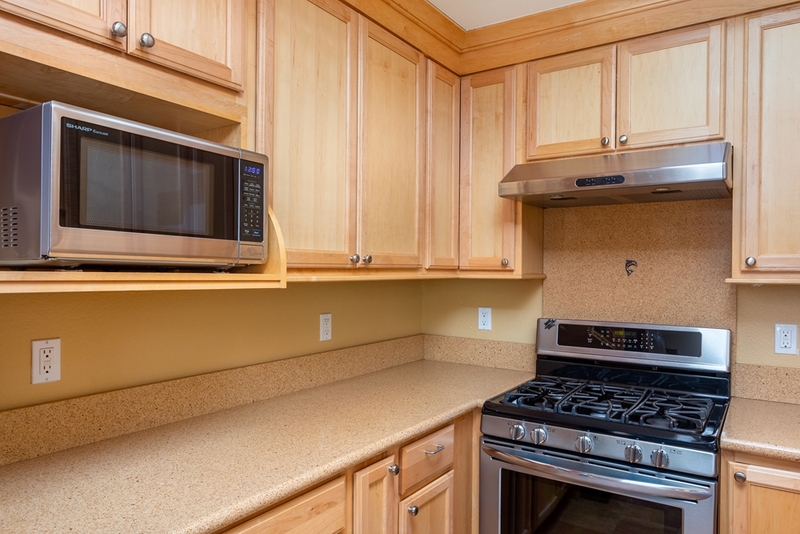 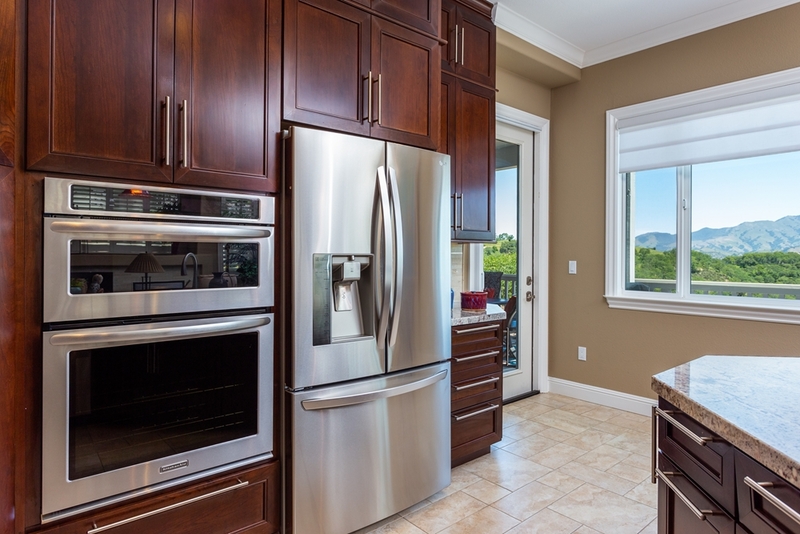 The refrigerator originally cramped the sink side of the kitchen, leaving little counter space where it was vitally needed, and the depth and bulk of the refrigerator on that side of the room really closed things off. 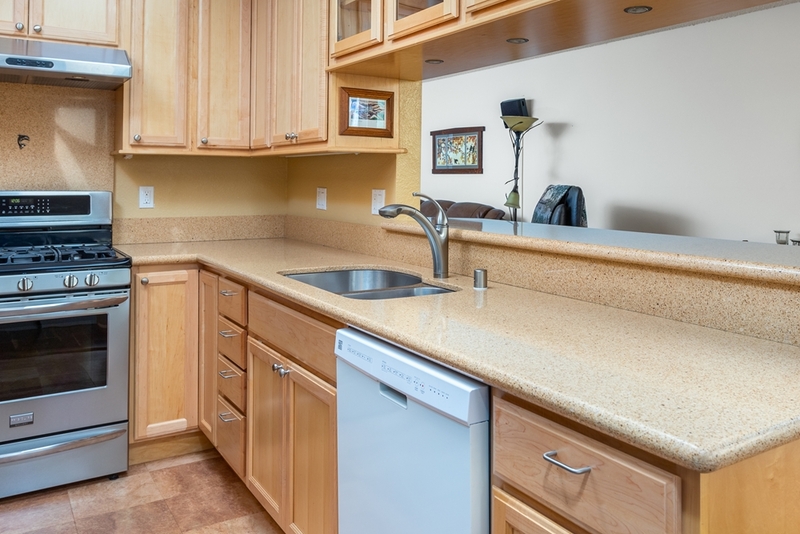 Moving it across the kitchen opened up ample prep/counter space on either side of the sink. 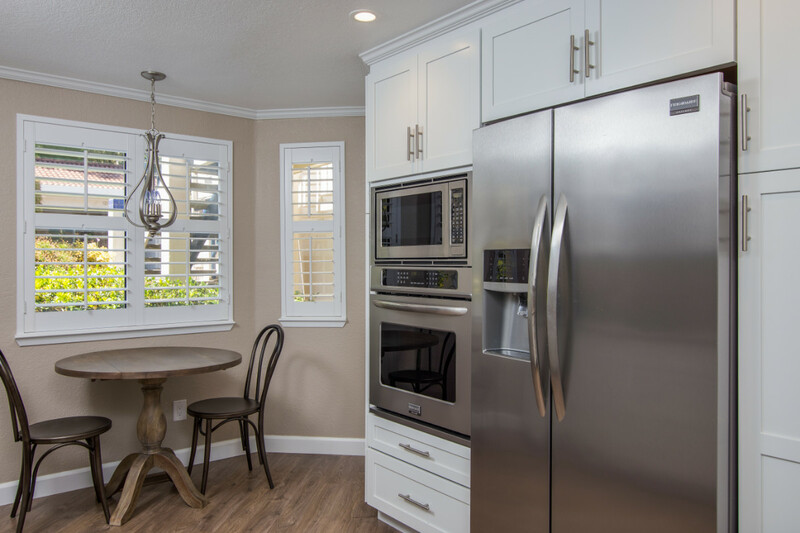 The rest of the kitchen was thoughtfully organized as well complete with a beautiful new pantry closet with glass French doors. 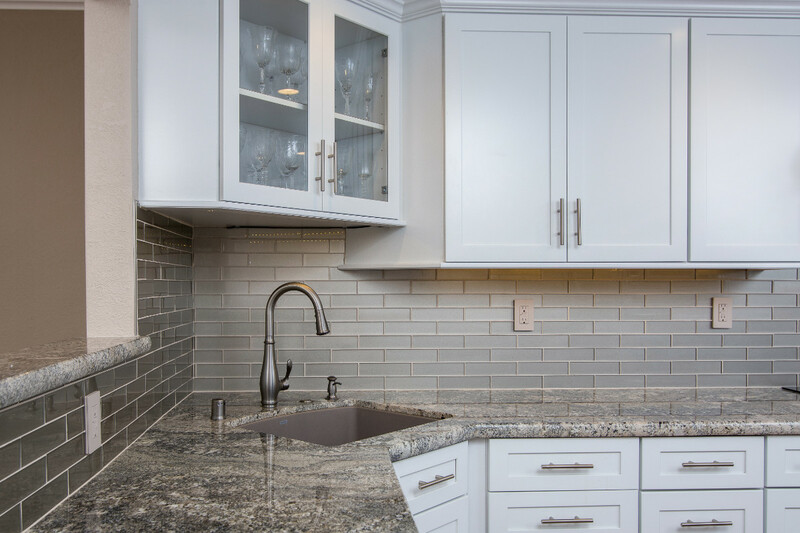 Darker gray quartz countertops and dark hardwood floors are a nice contrast to the white of the cabinets and marble backsplash tiles. 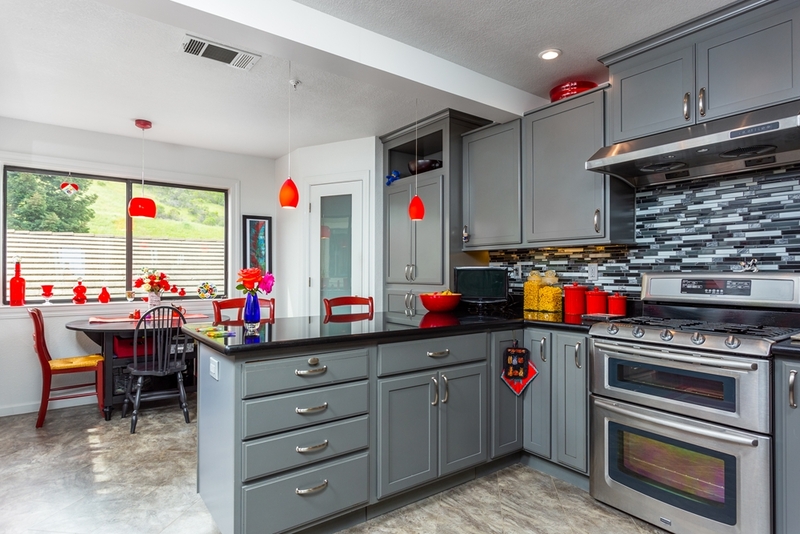 Fun pendant lights and dark painted walls bring some color and drama to the space. 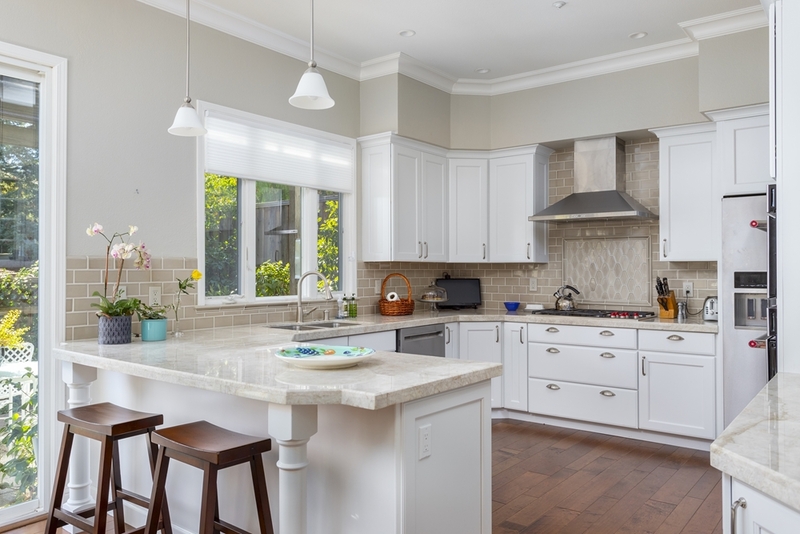 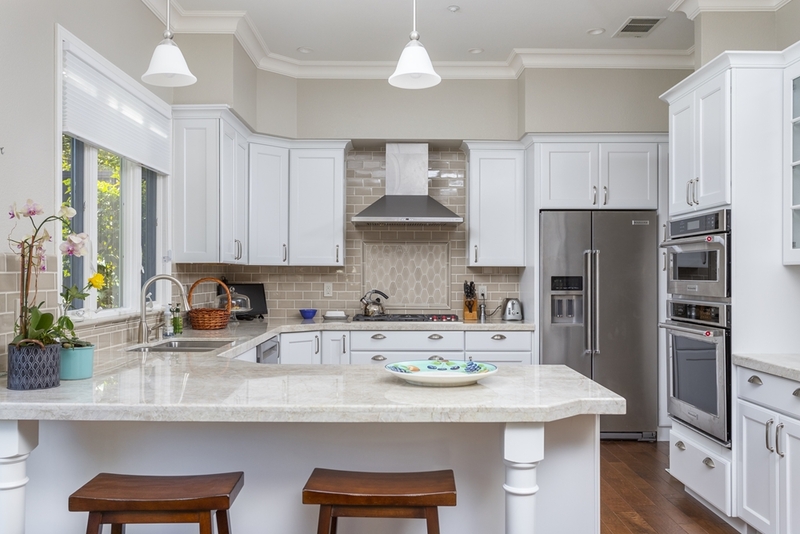 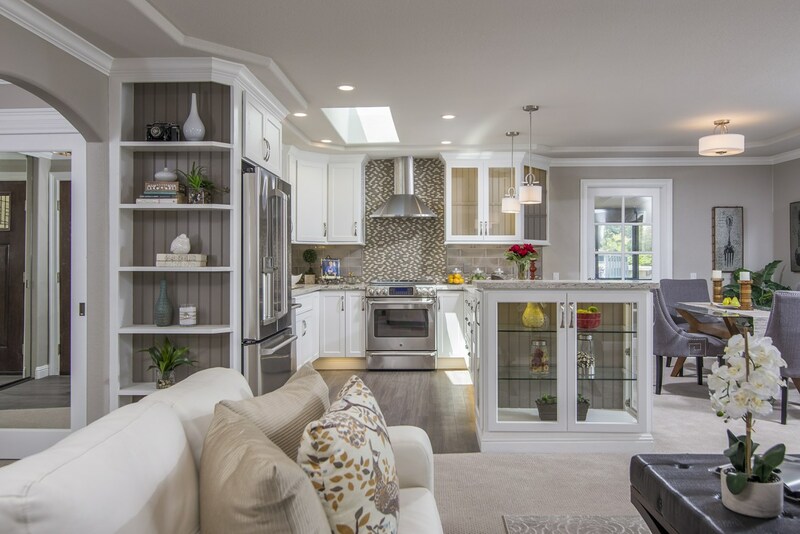 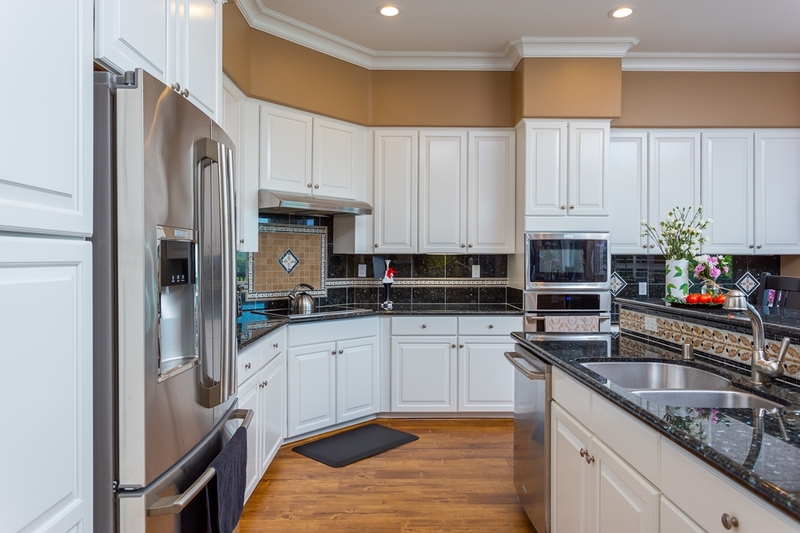 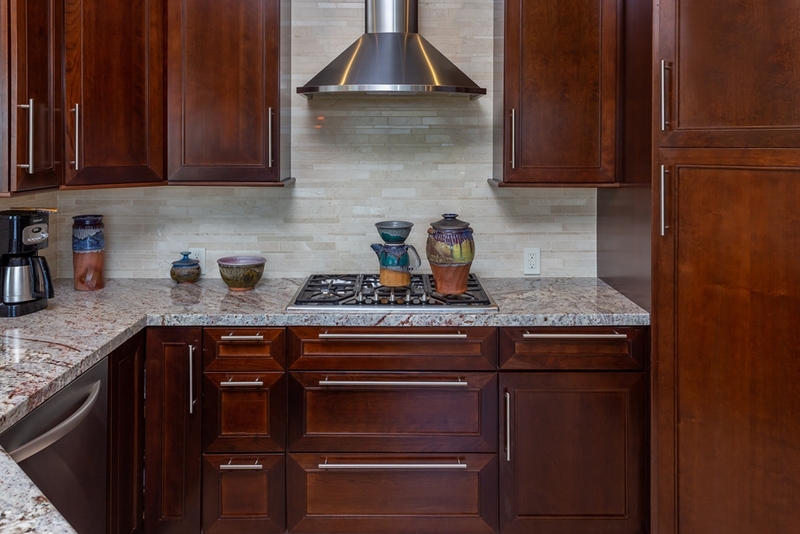 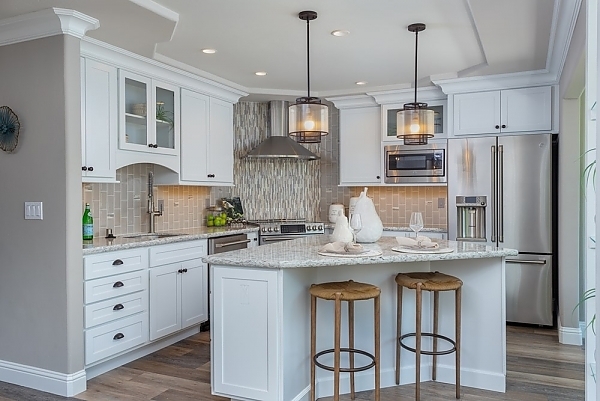 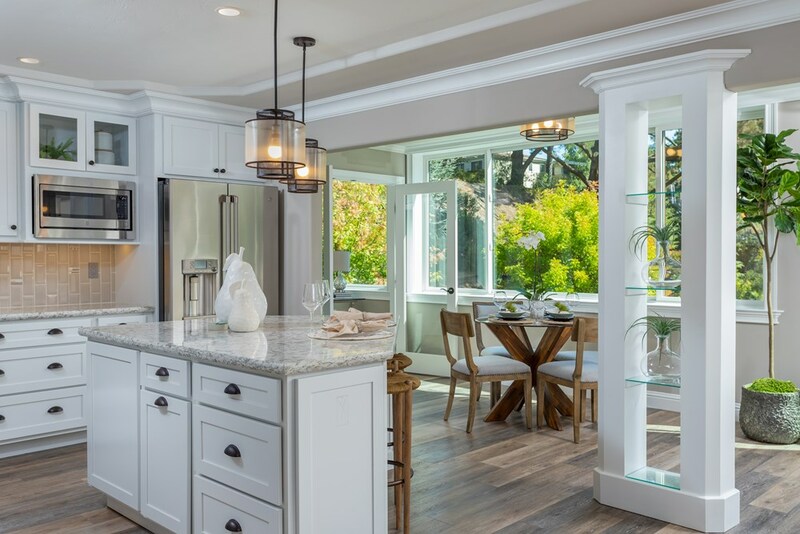 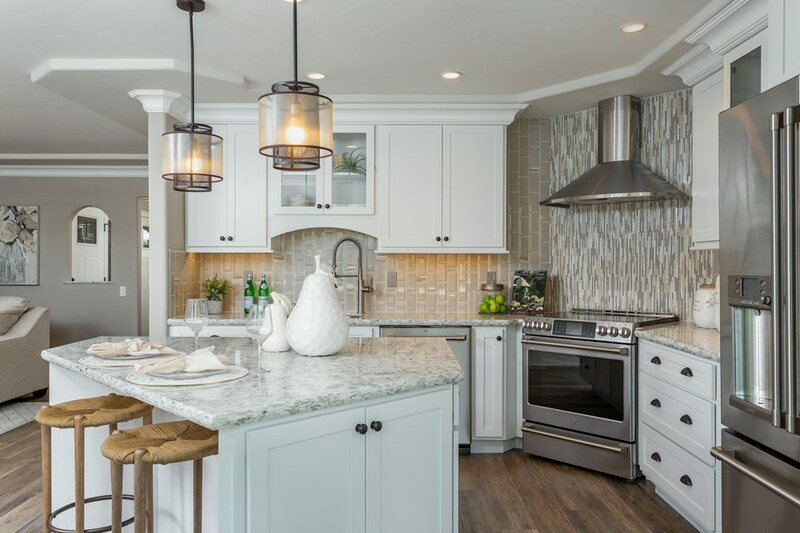 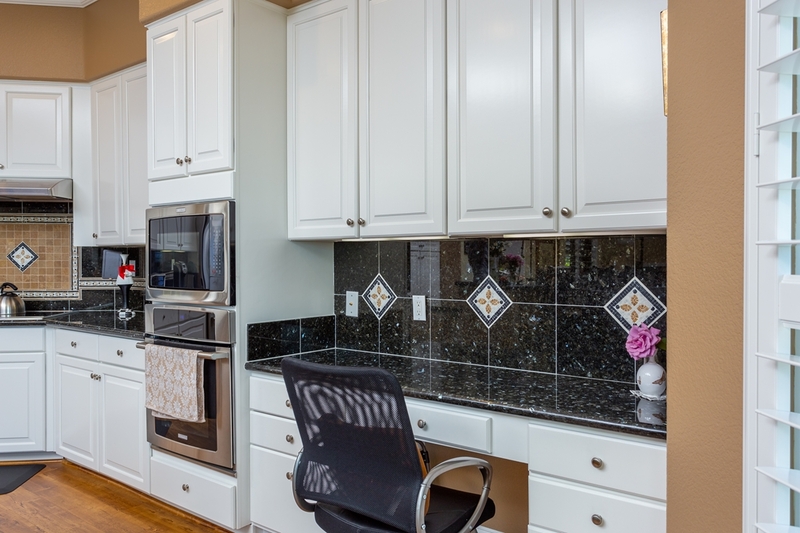 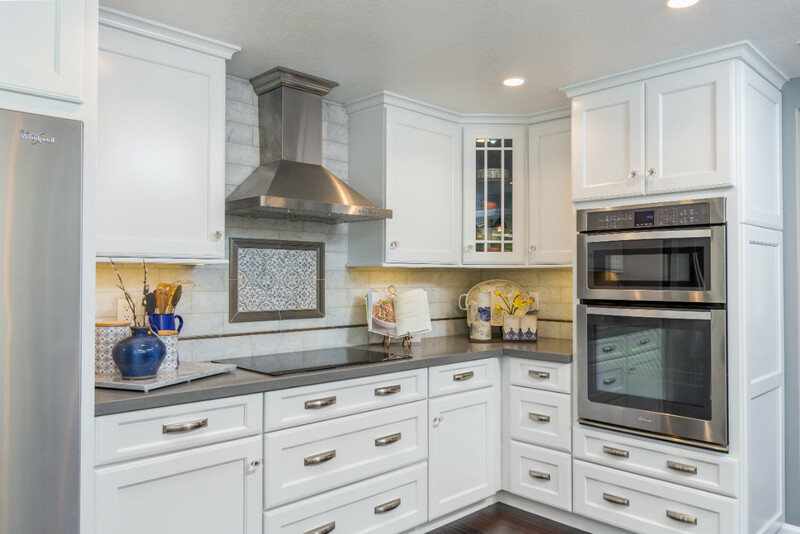 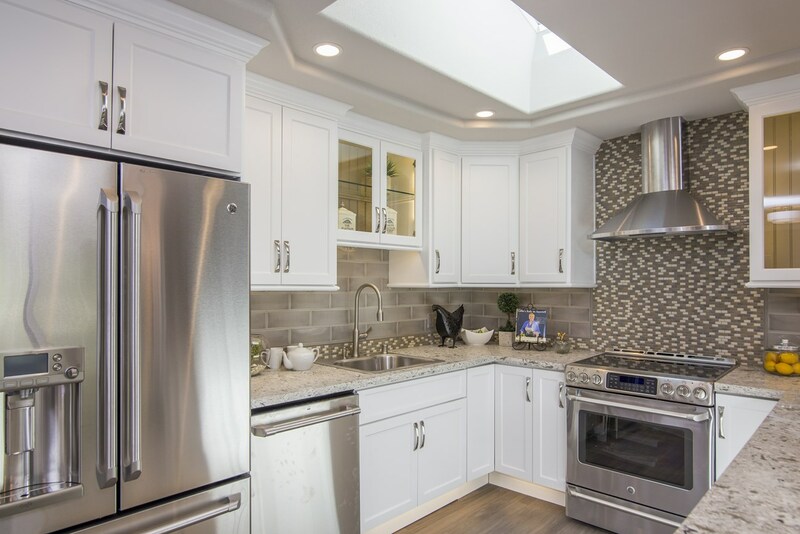 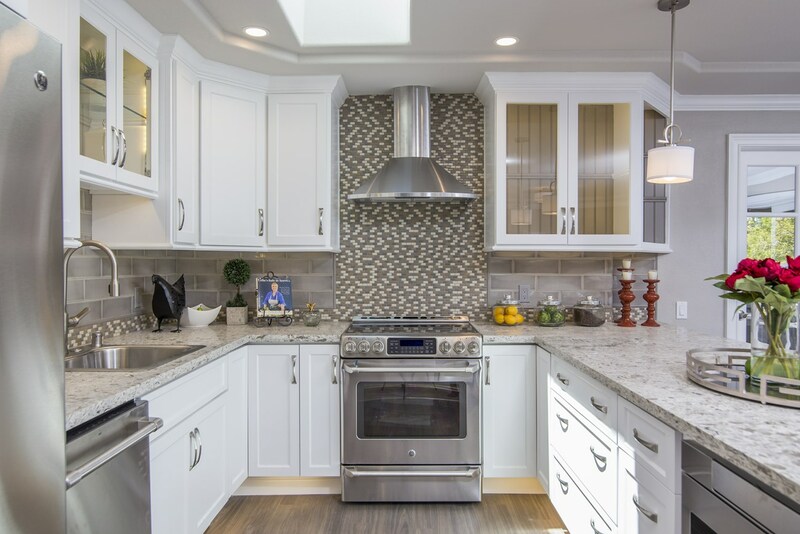 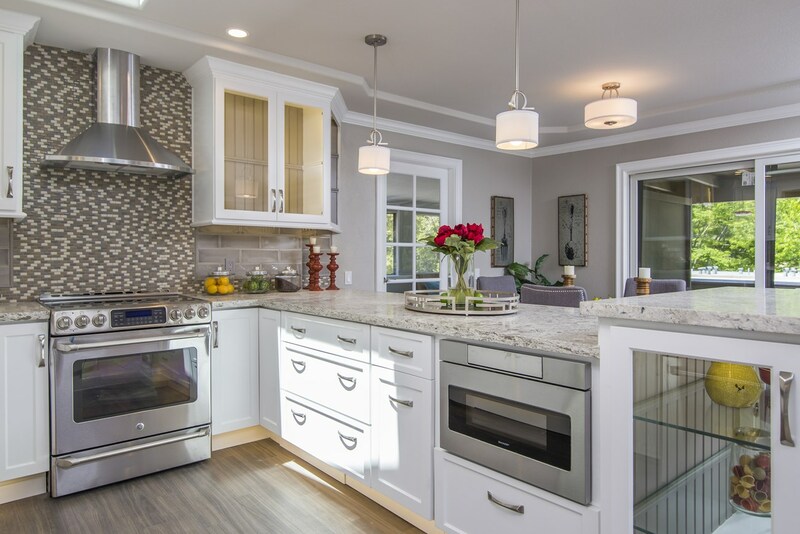 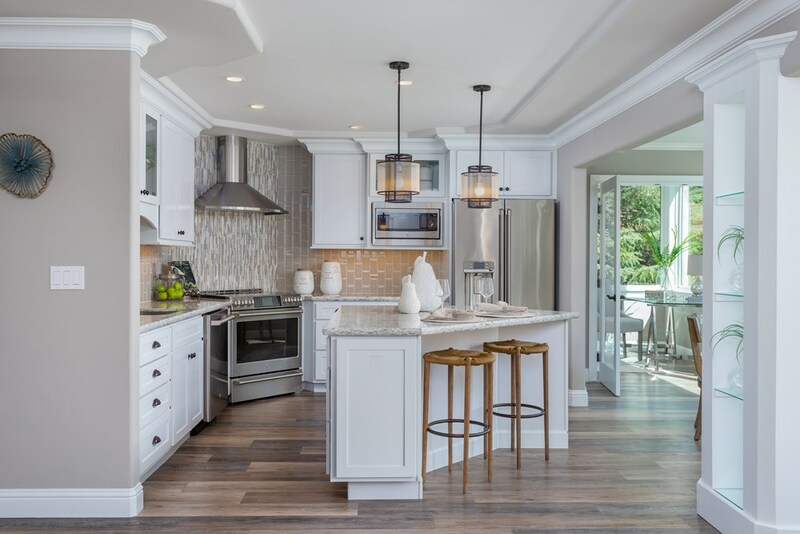 The kitchen of this home features a clean, classic contemporary feel with white shaker cabinetry, rich granite countertops and a glamorous glass tile backsplash. 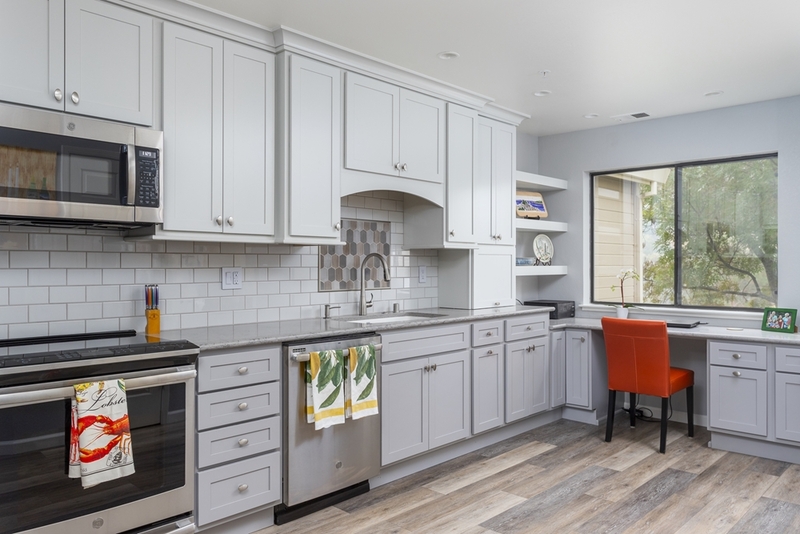 Small tweaks to the configuration of the kitchen greatly enhanced the functionality of the space as well as provided much better storage. 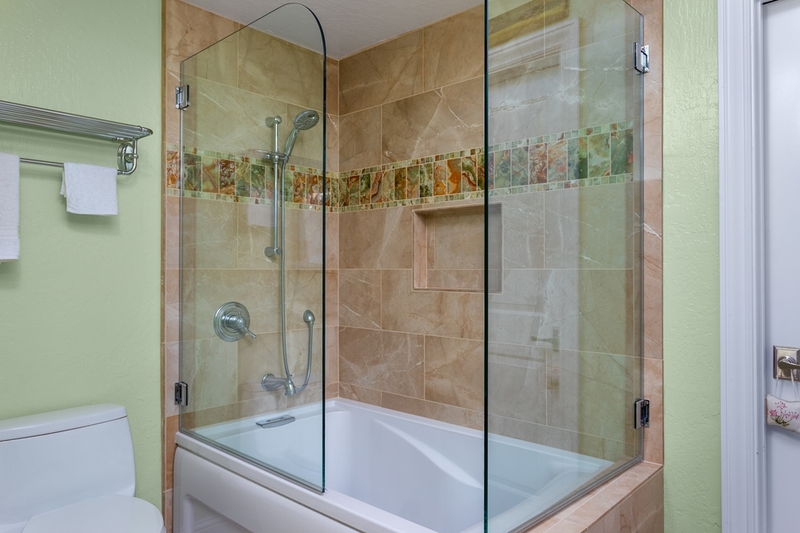 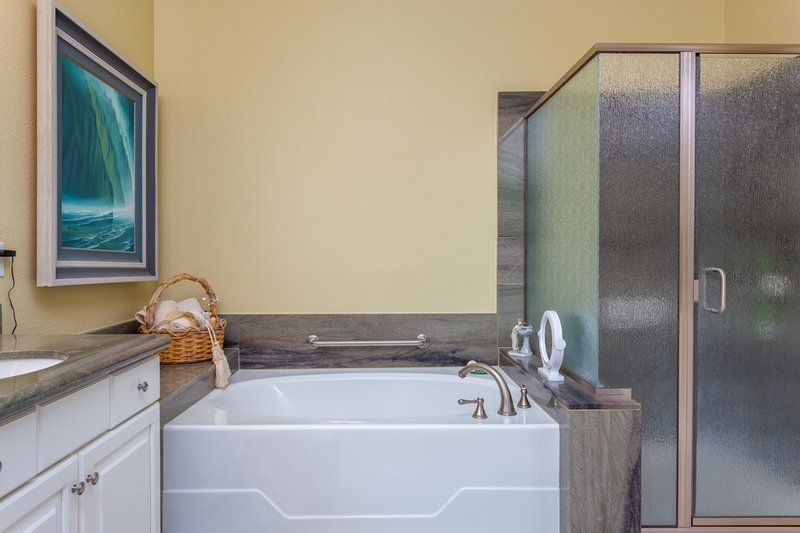 In the hall bathroom, the tub was original, but all else was replaced for an updated look with a fun and whimsical mirror. 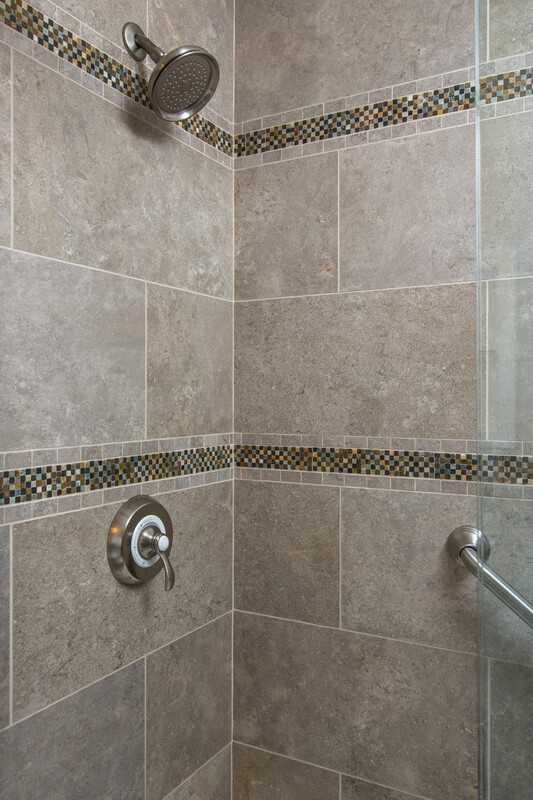 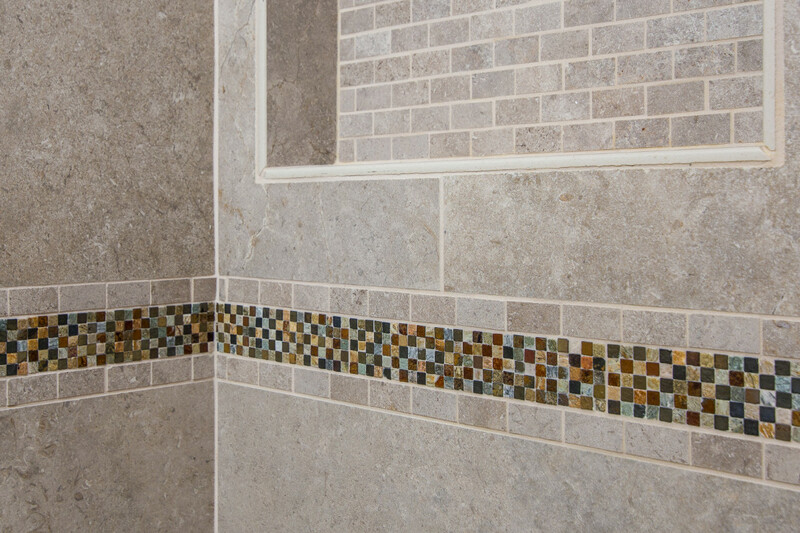 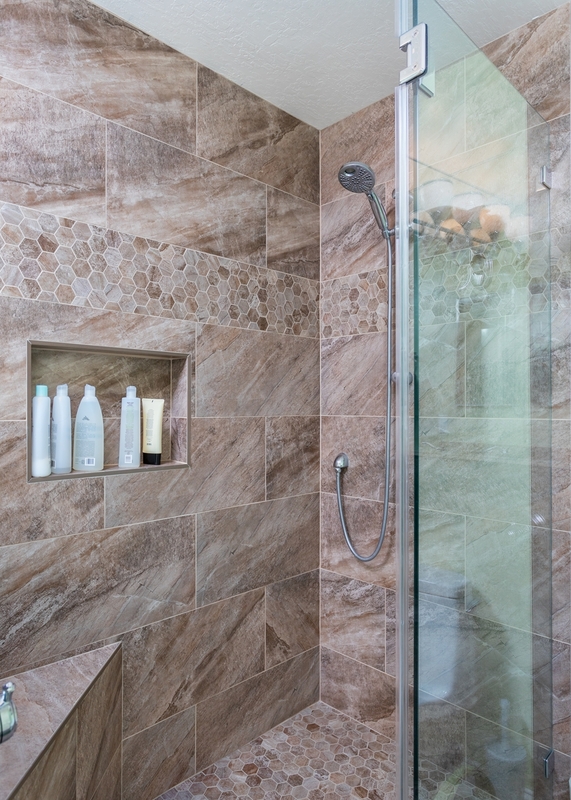 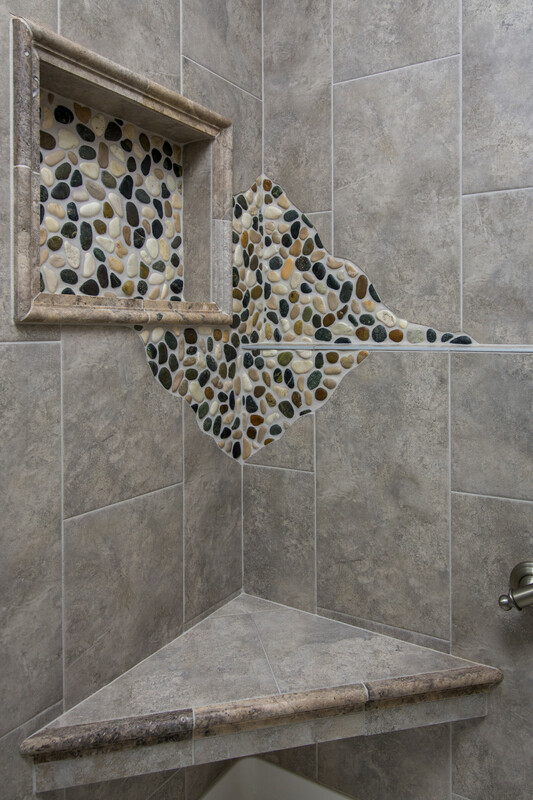 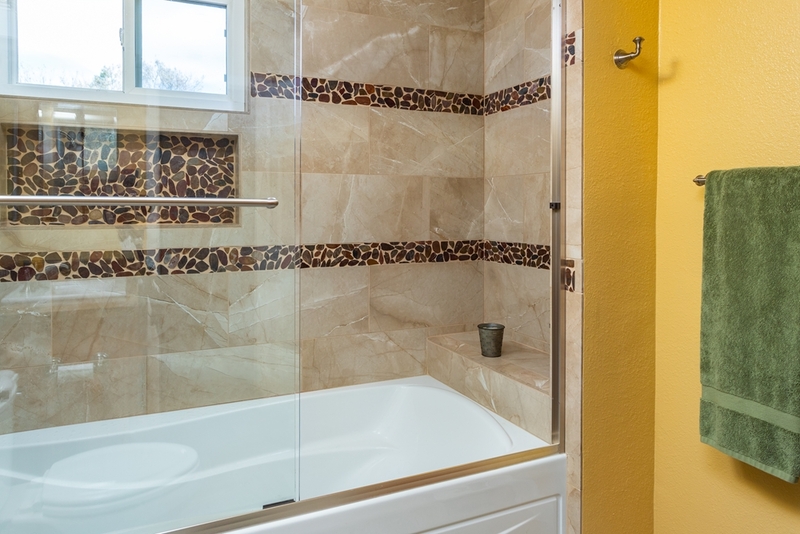 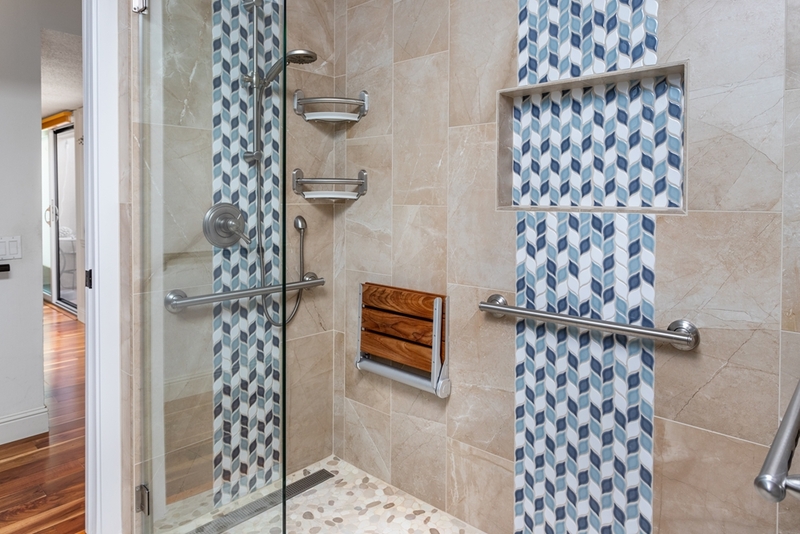 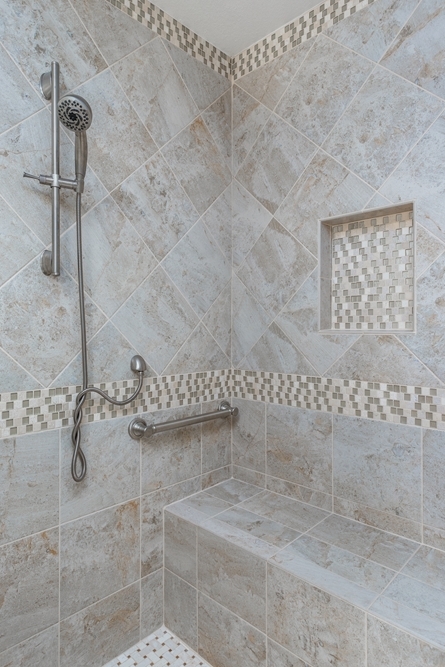 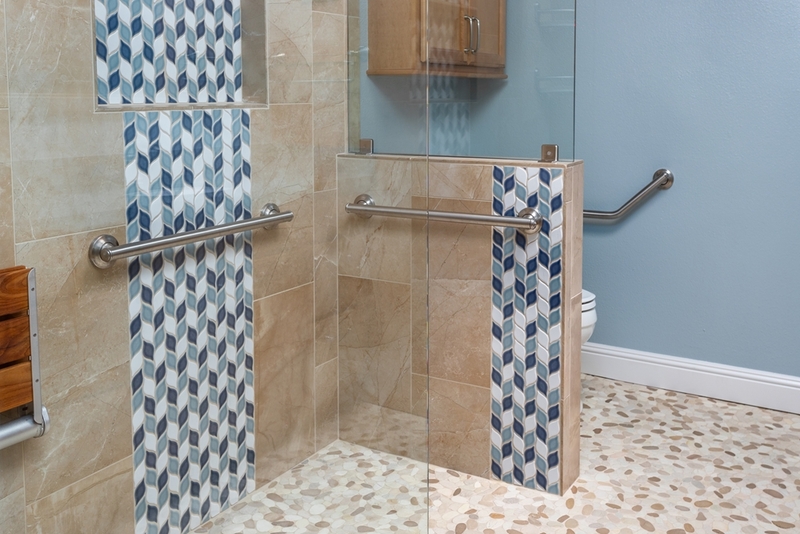 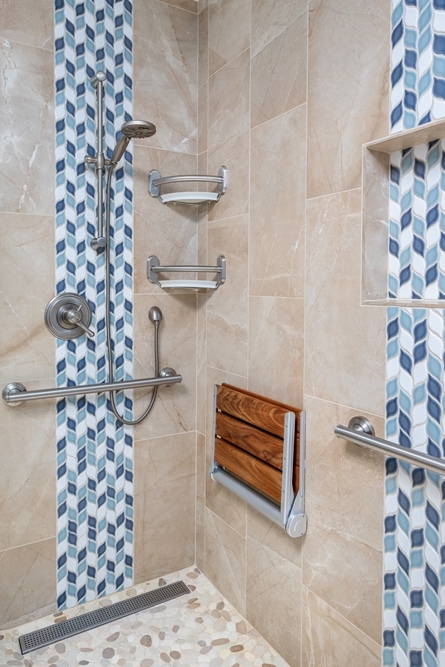 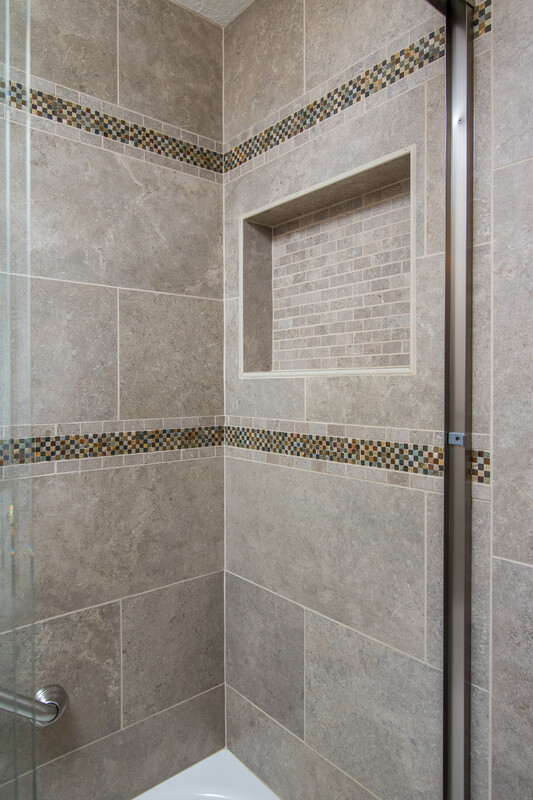 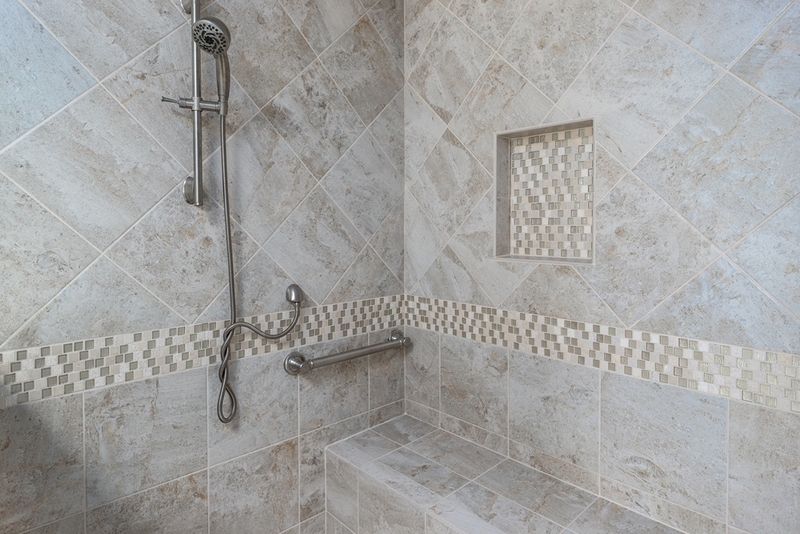 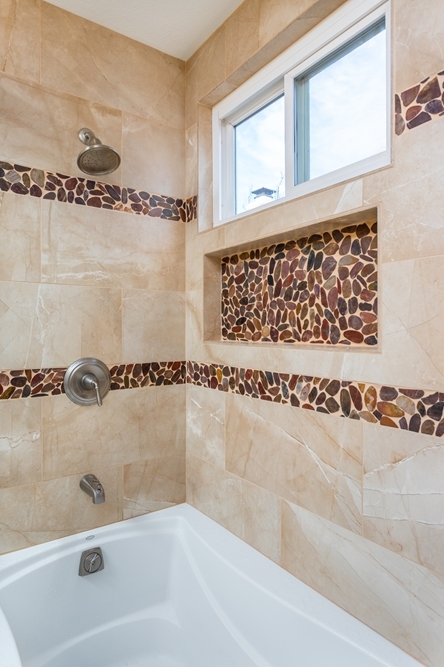 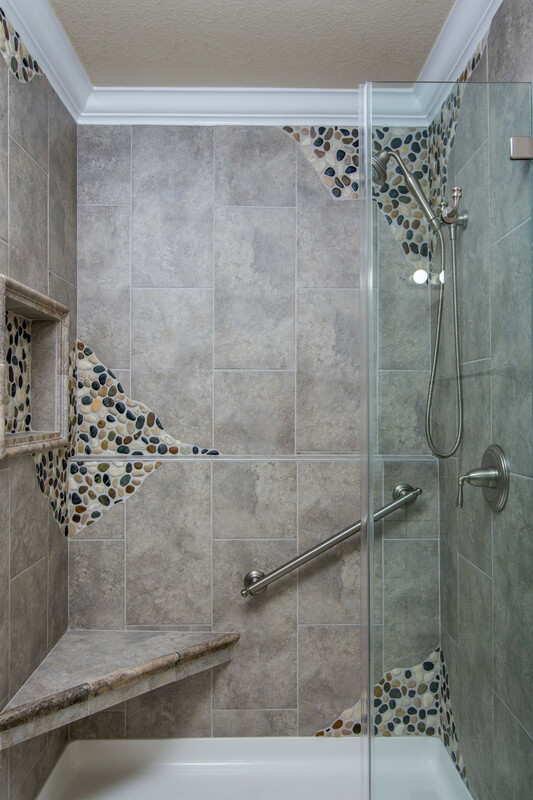 The master bathroom remodel includes a fun tile design where it appears the porcelain tiles have broken off to expose pebbles. 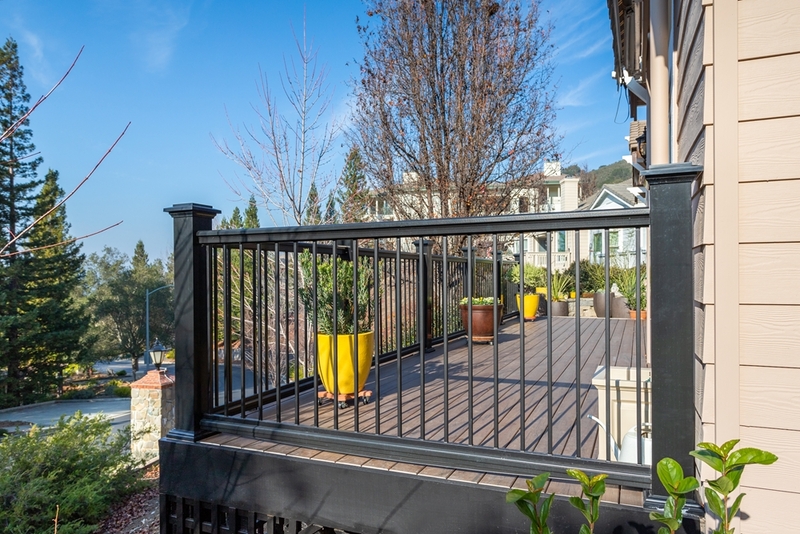 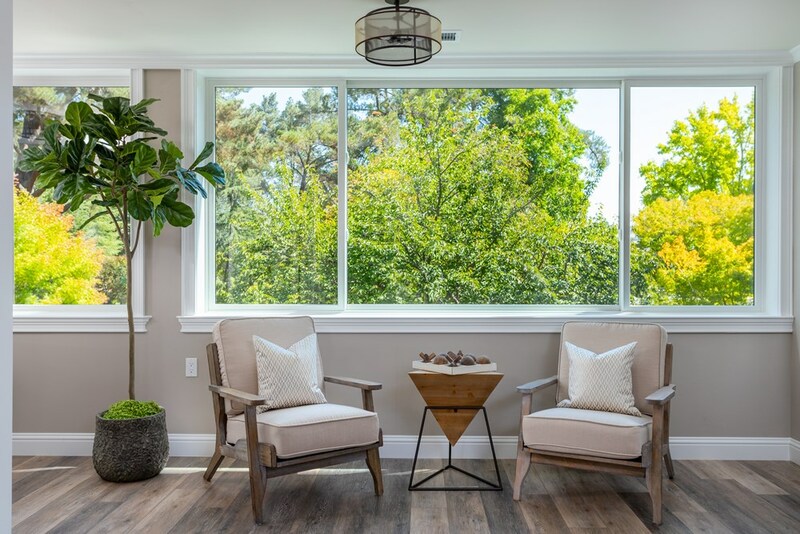 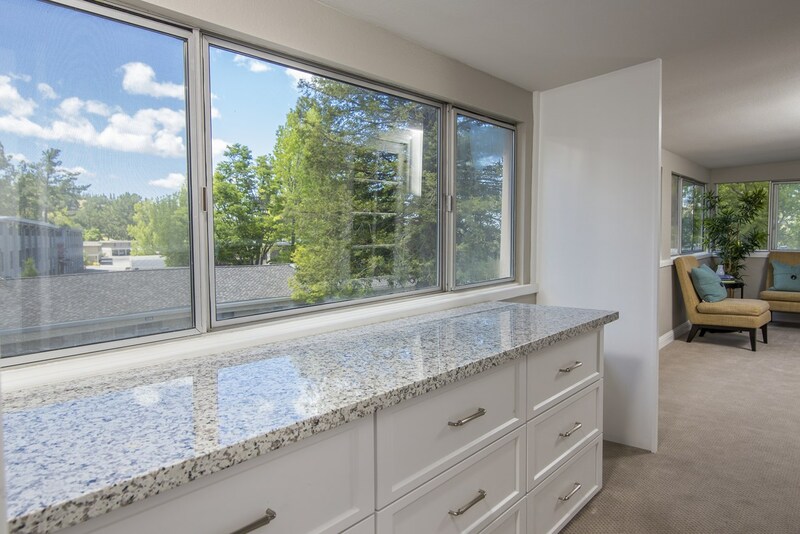 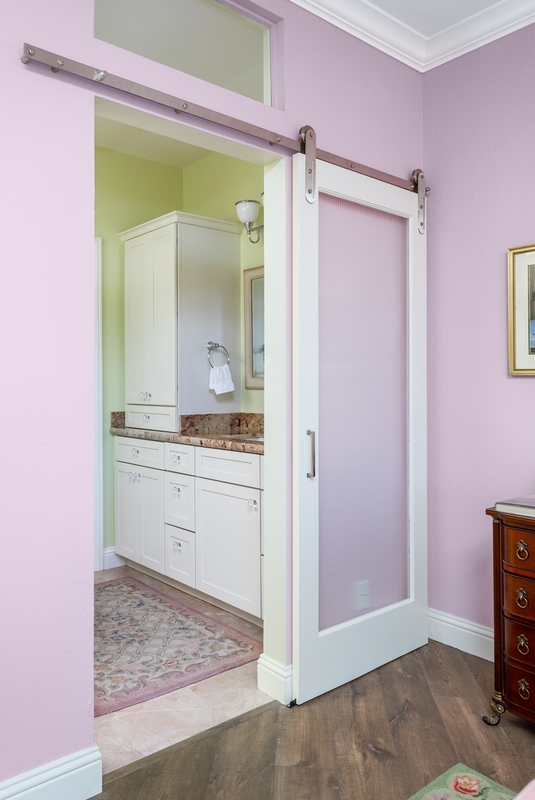 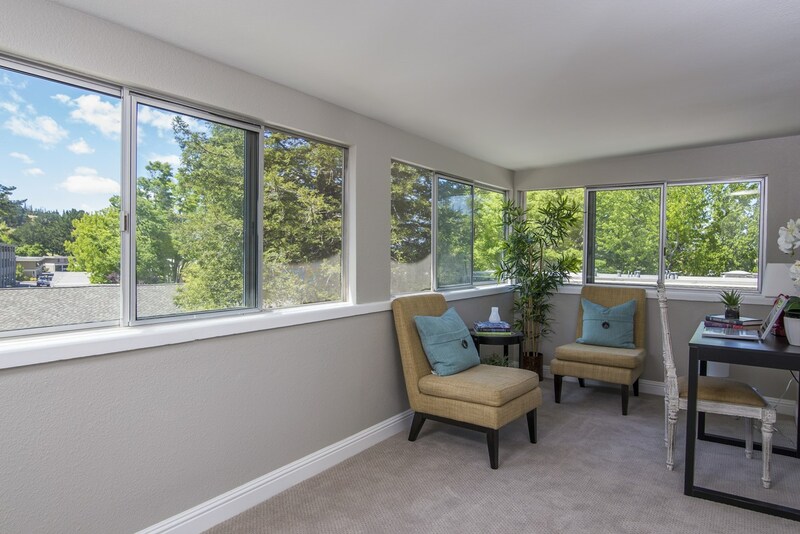 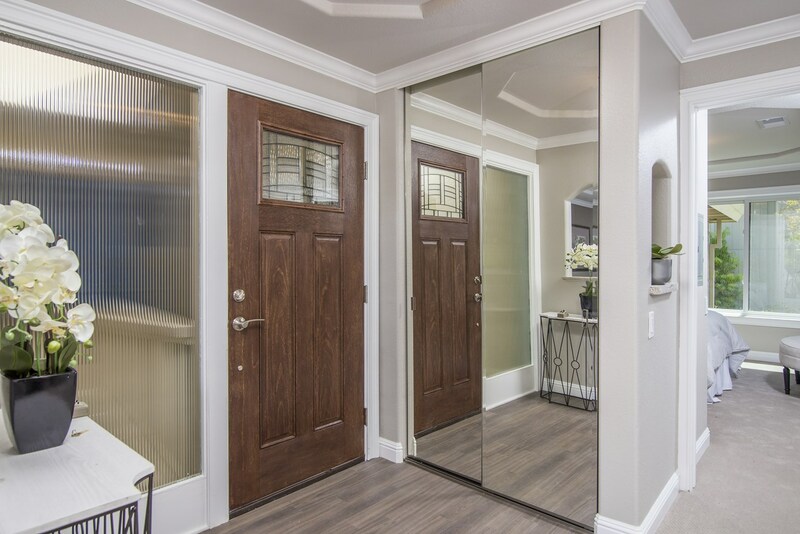 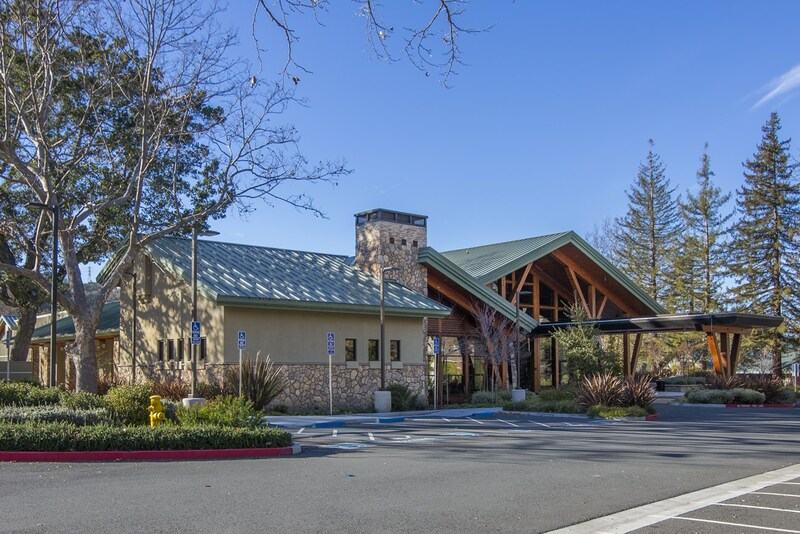 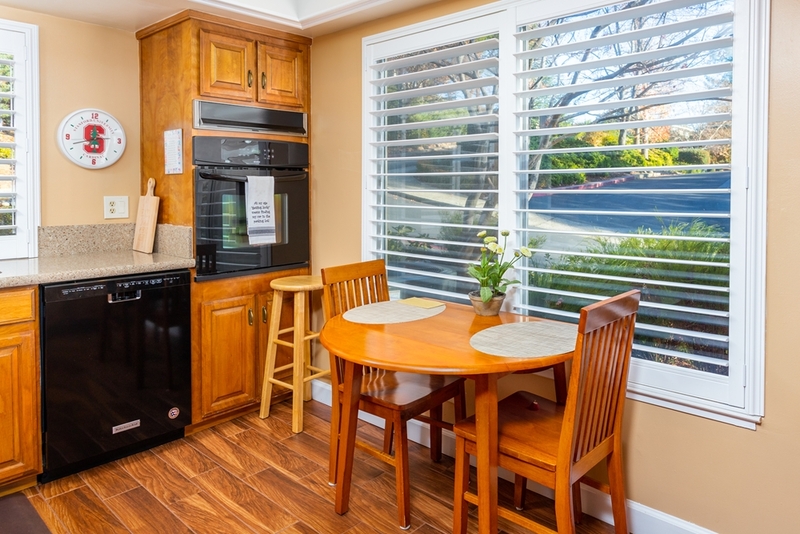 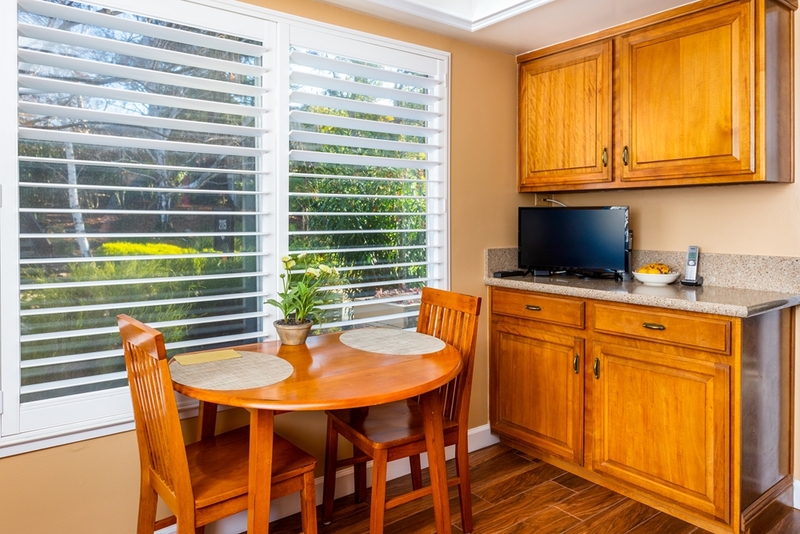 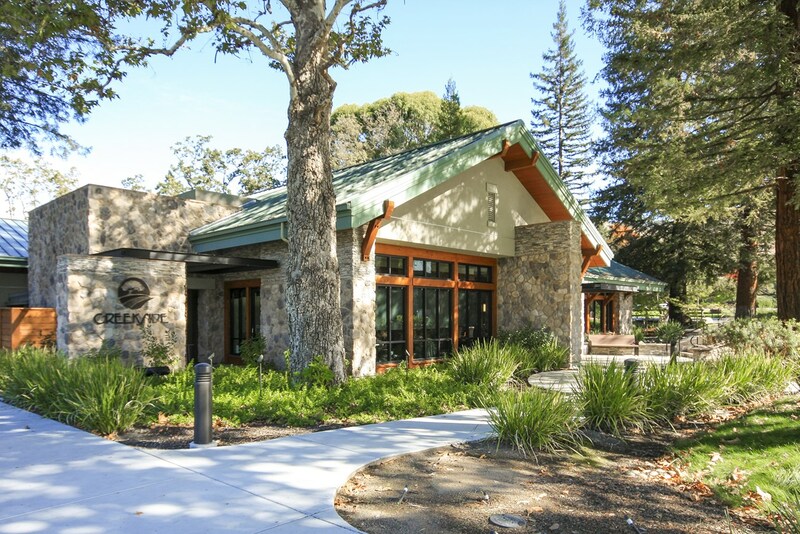 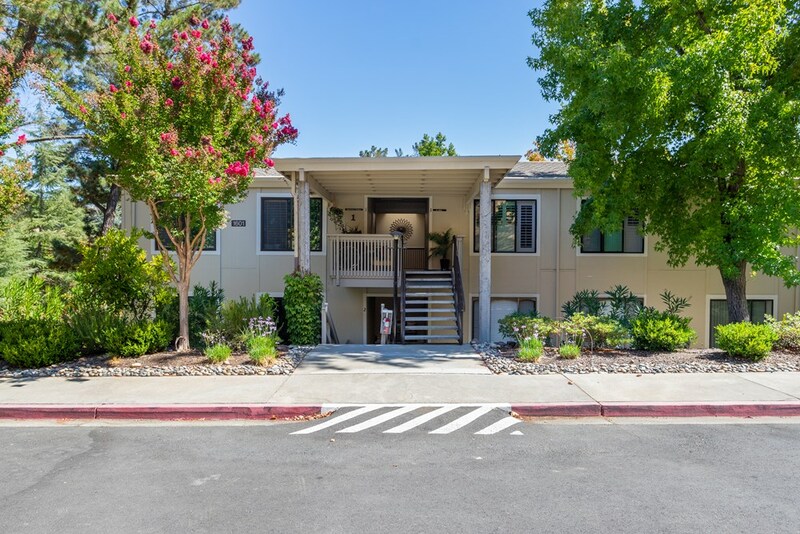 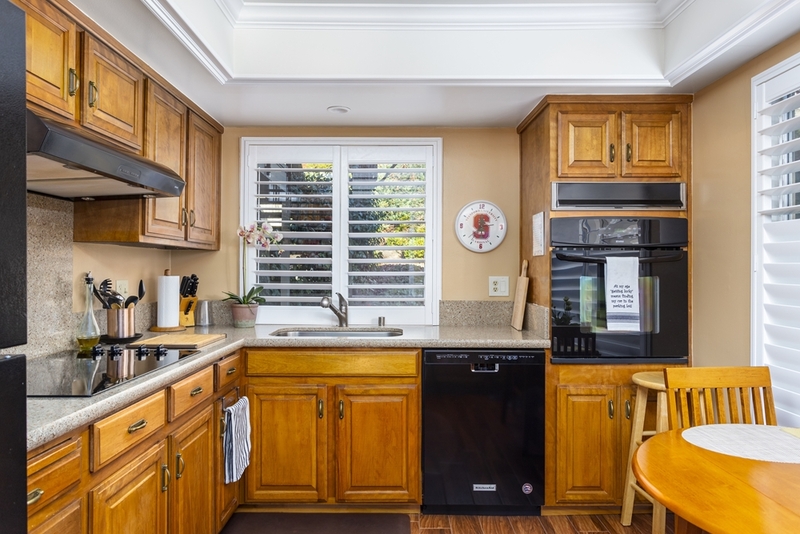 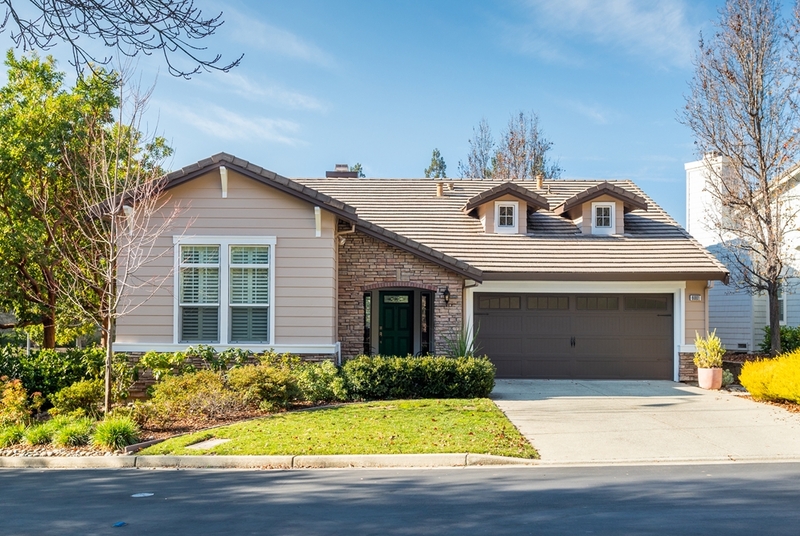 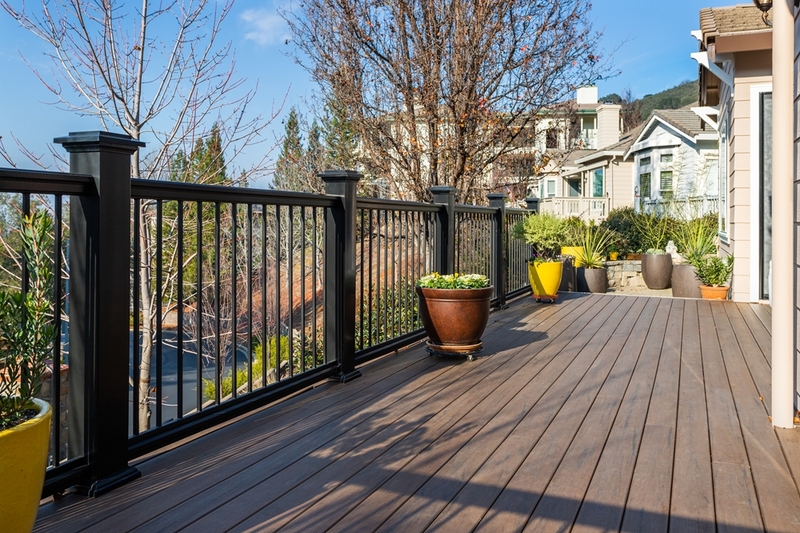 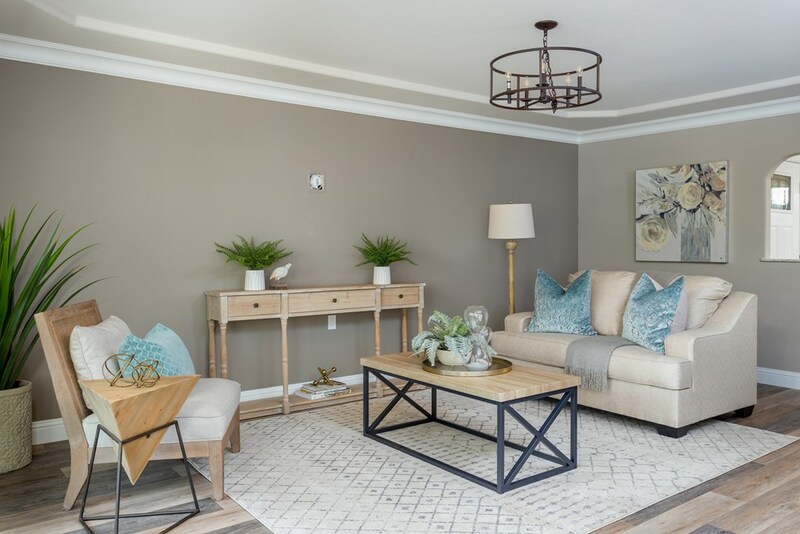 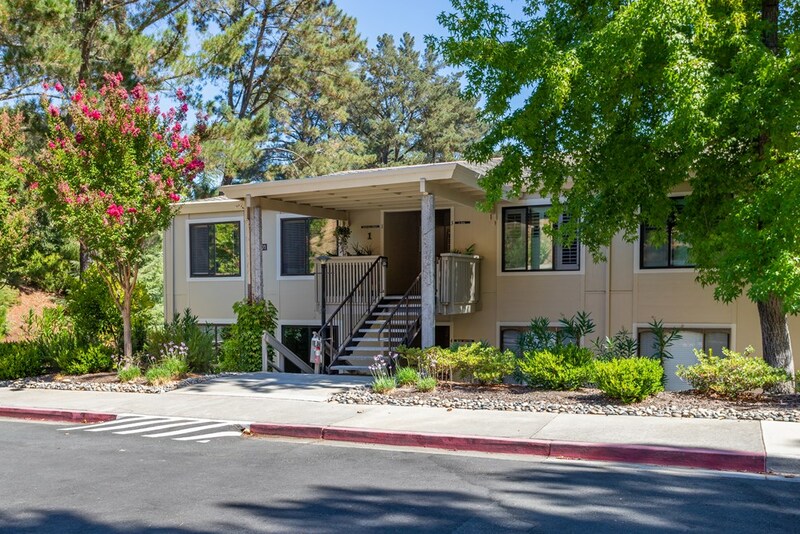 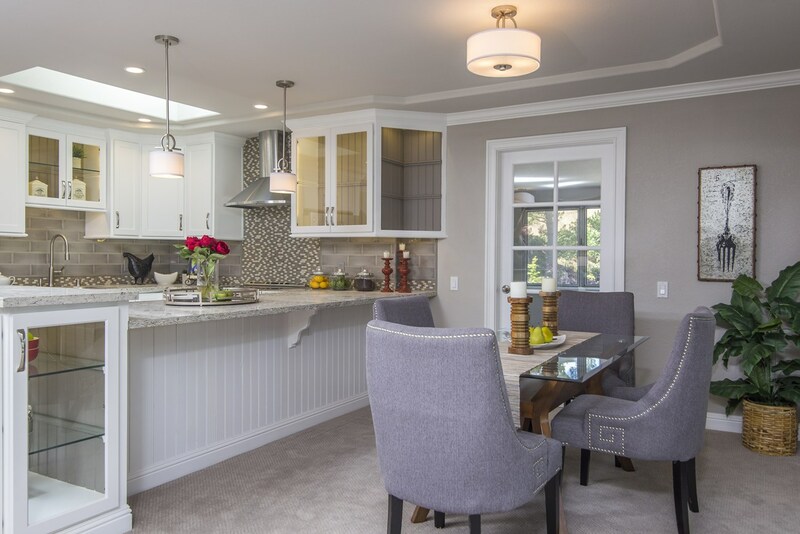 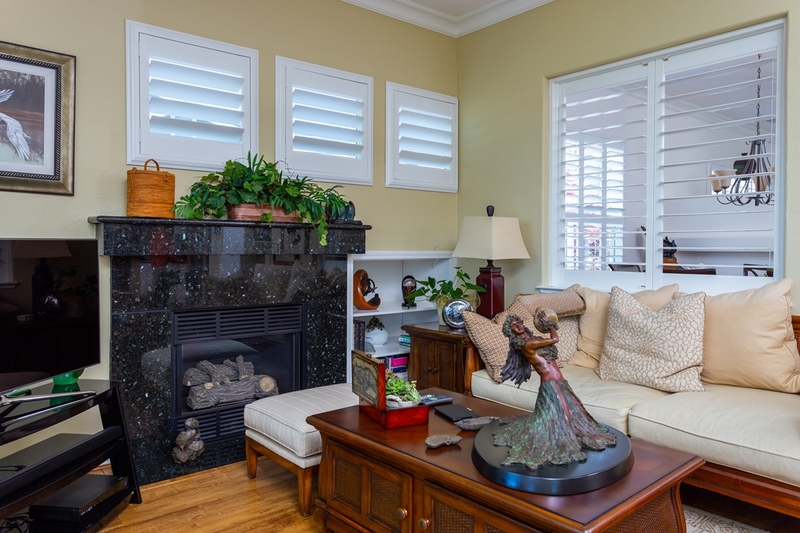 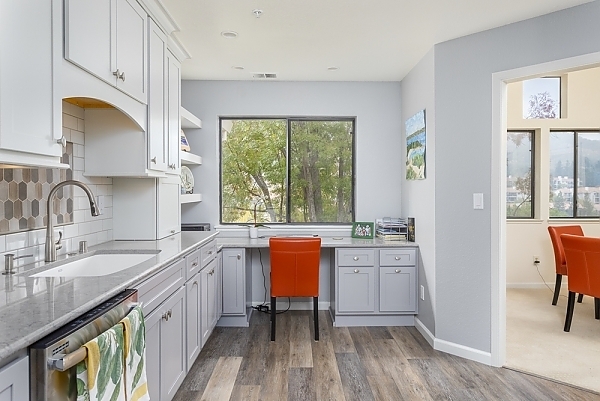 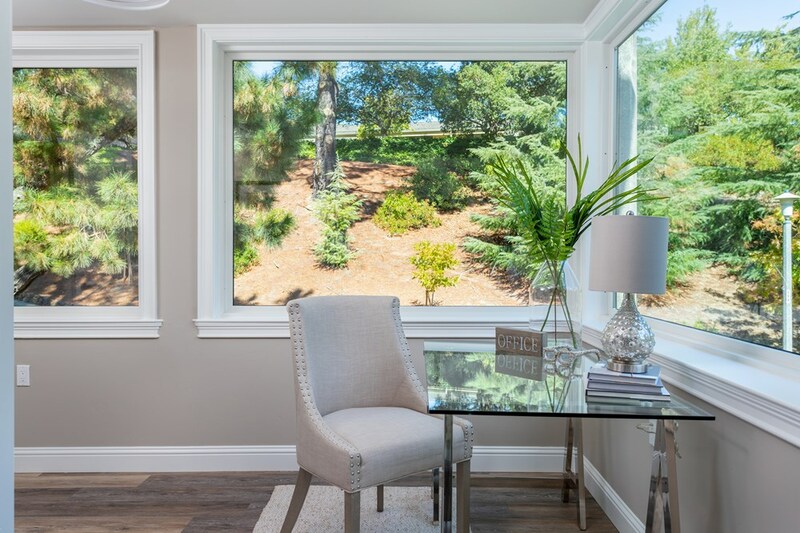 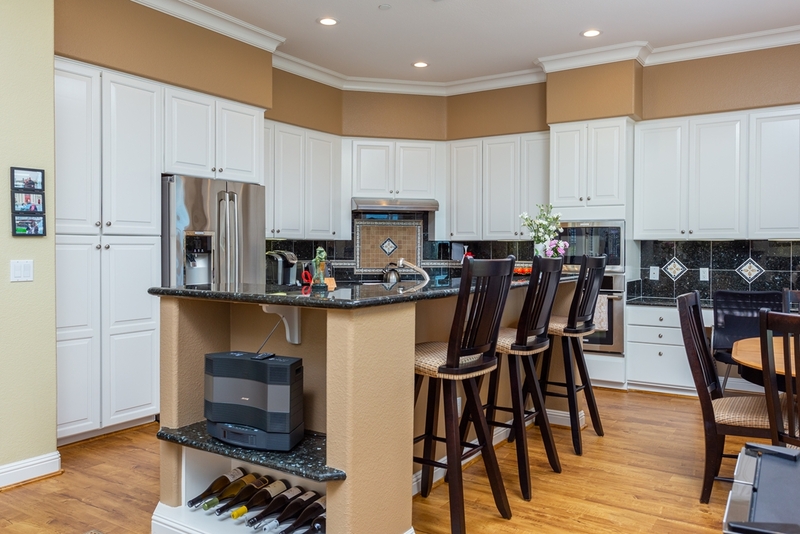 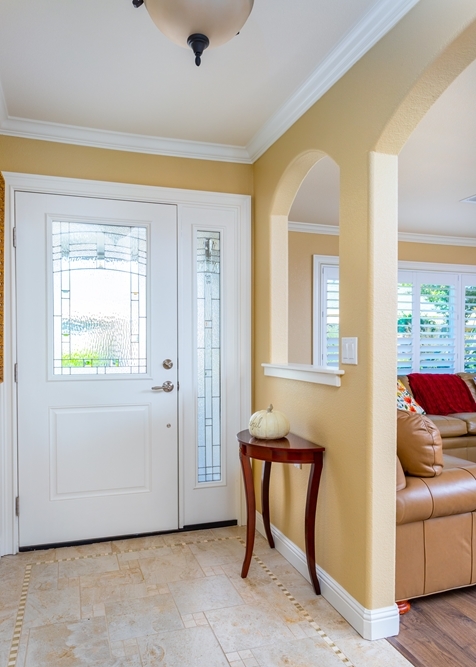 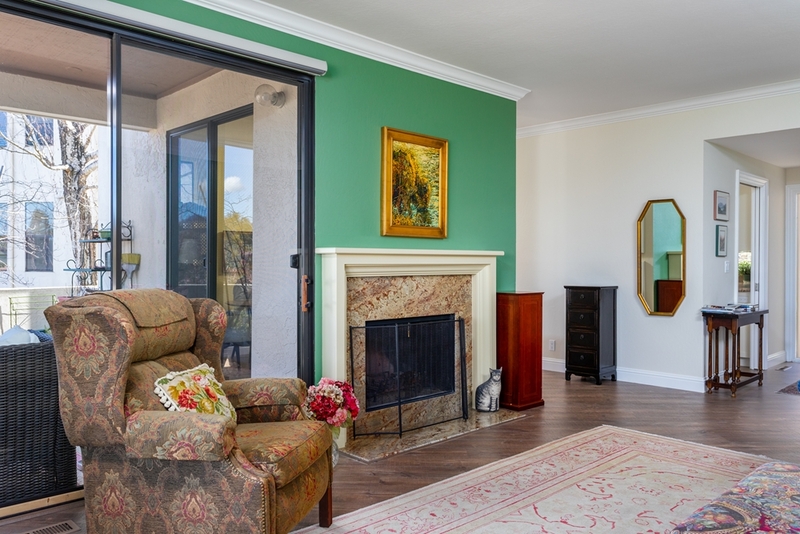 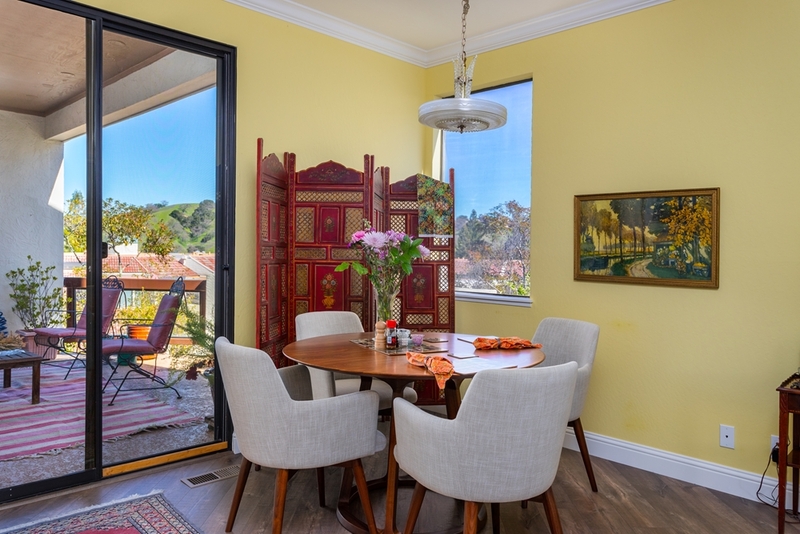 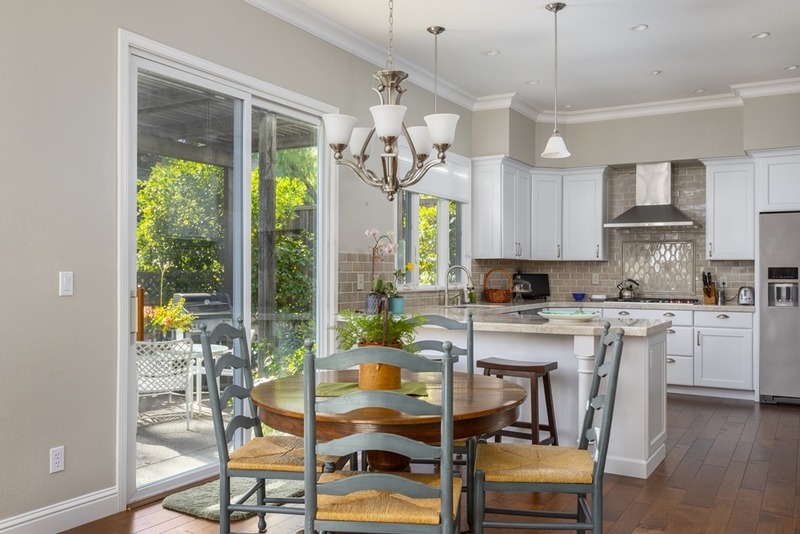 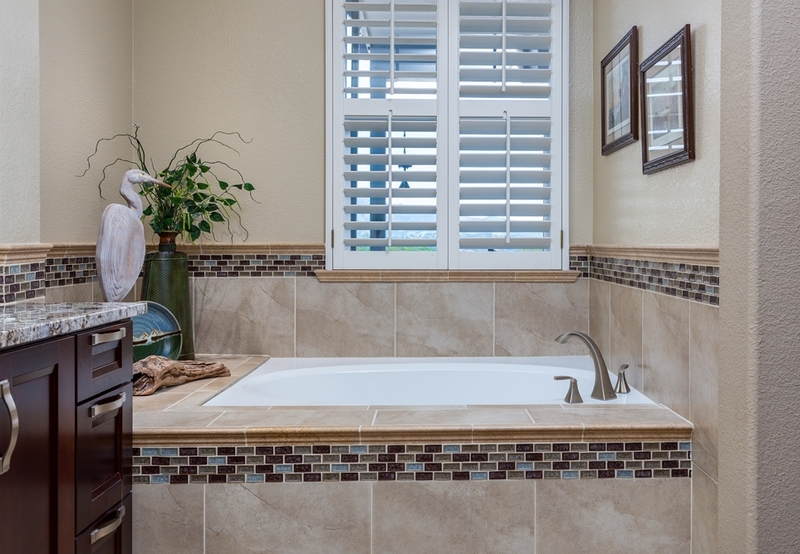 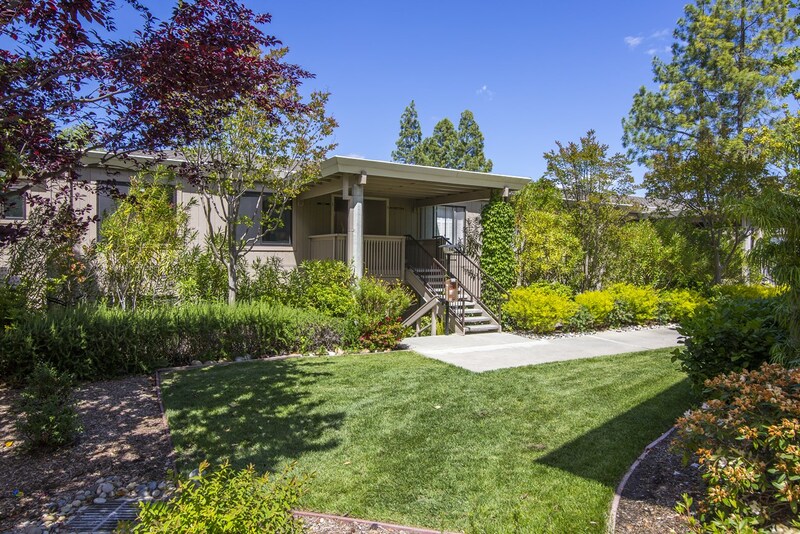 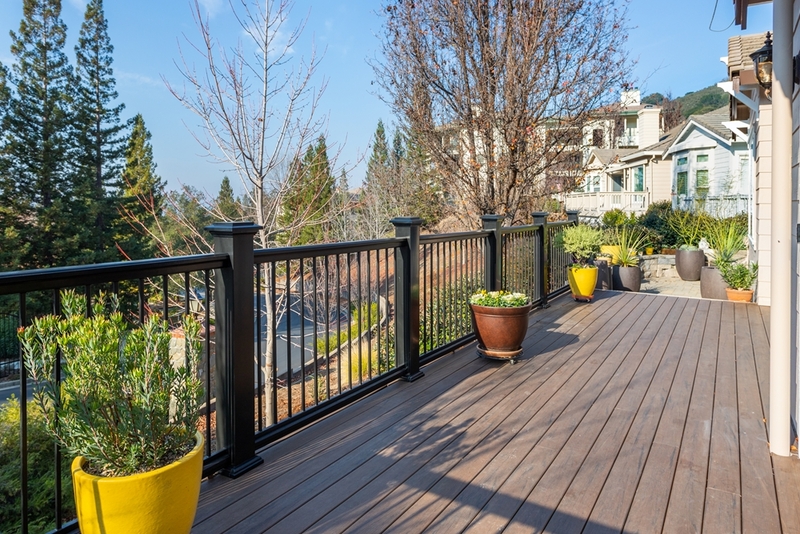 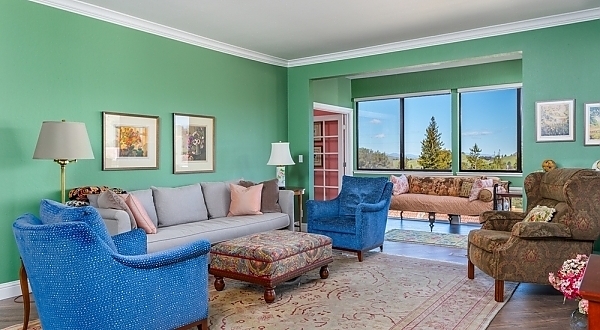 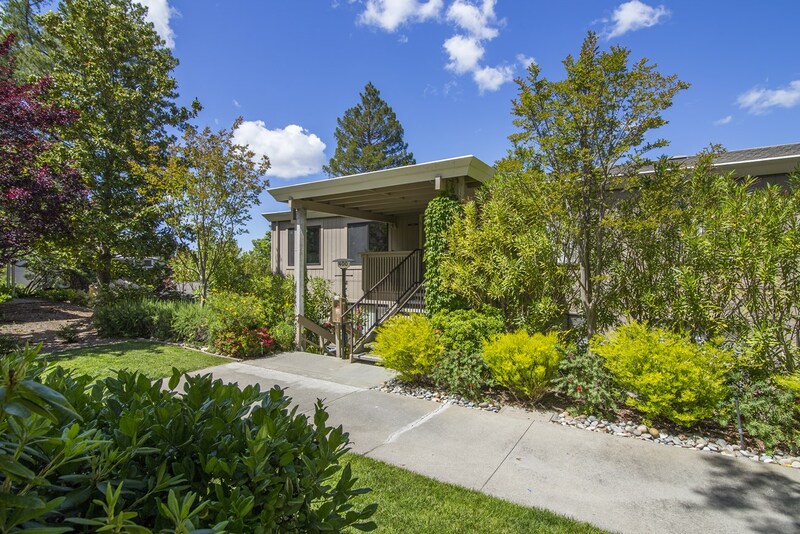 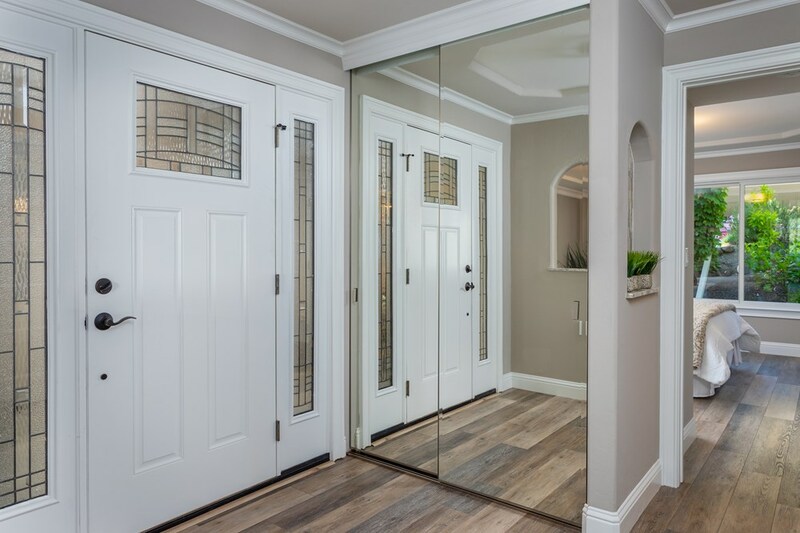 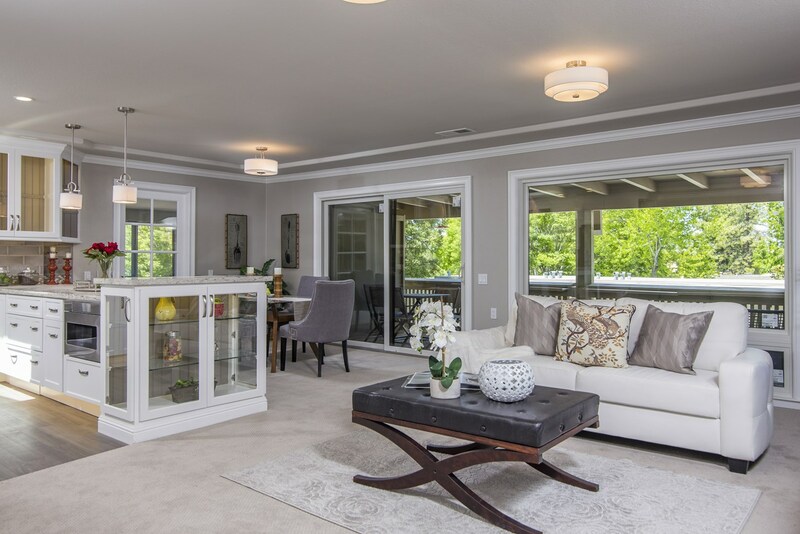 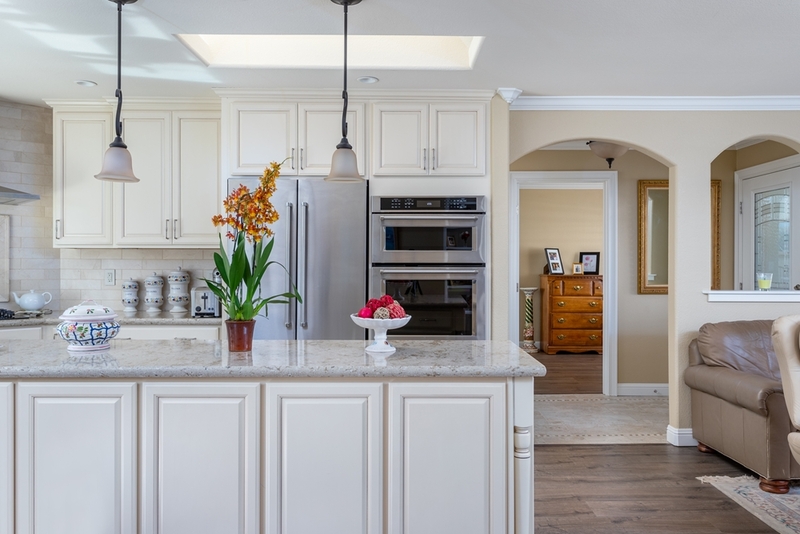 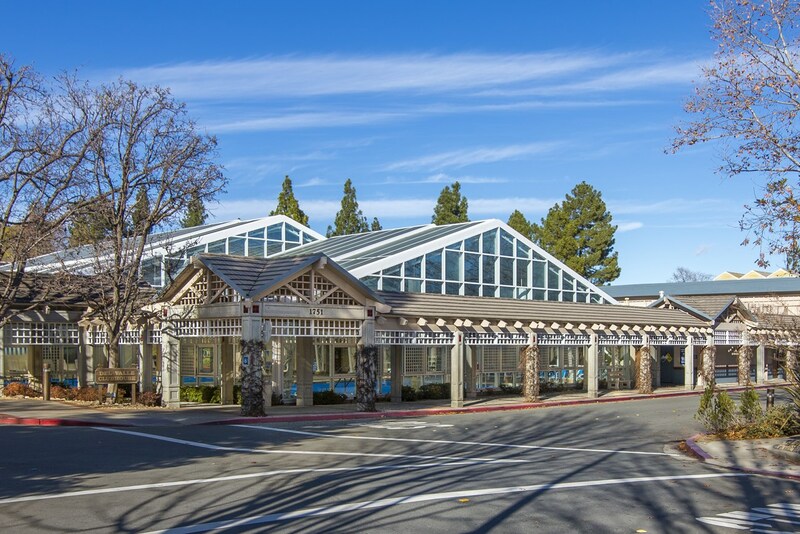 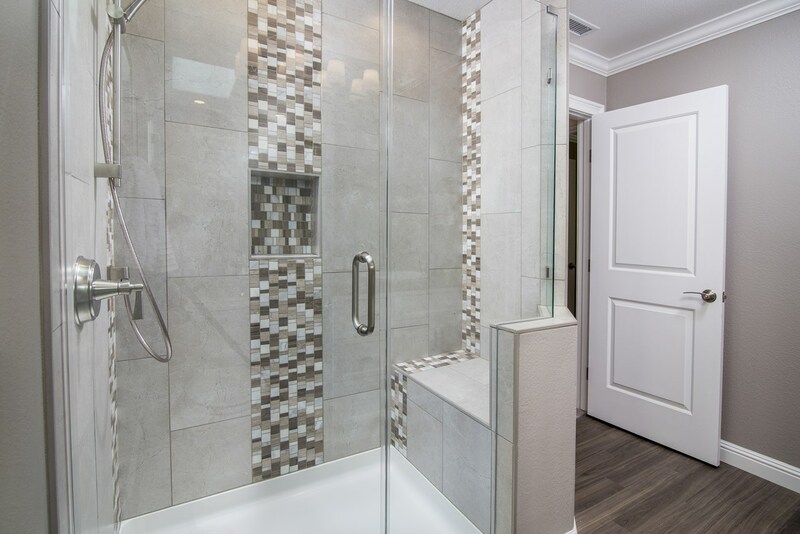 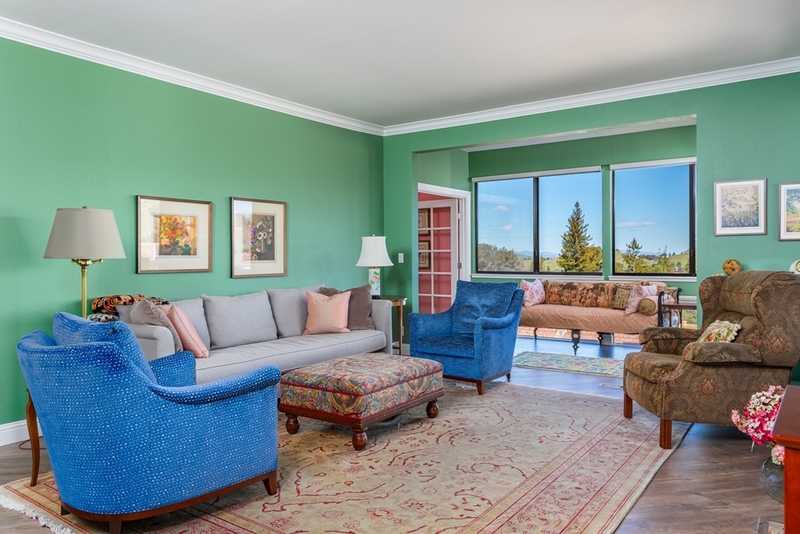 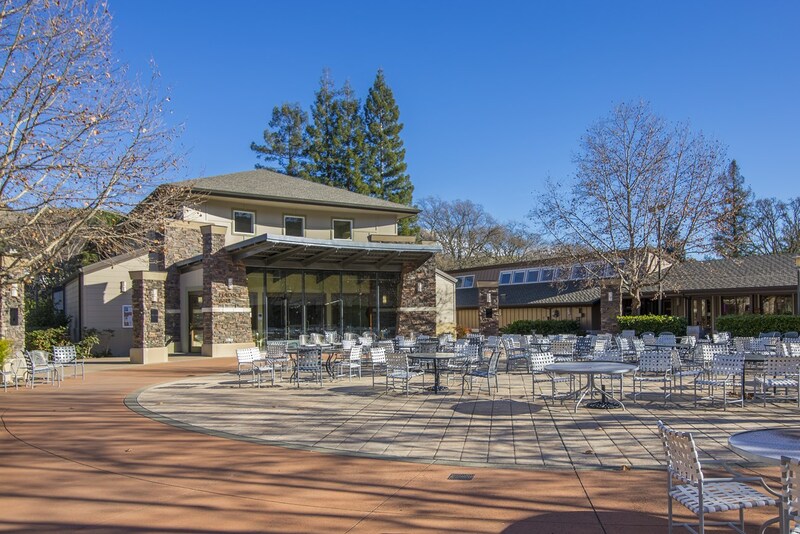 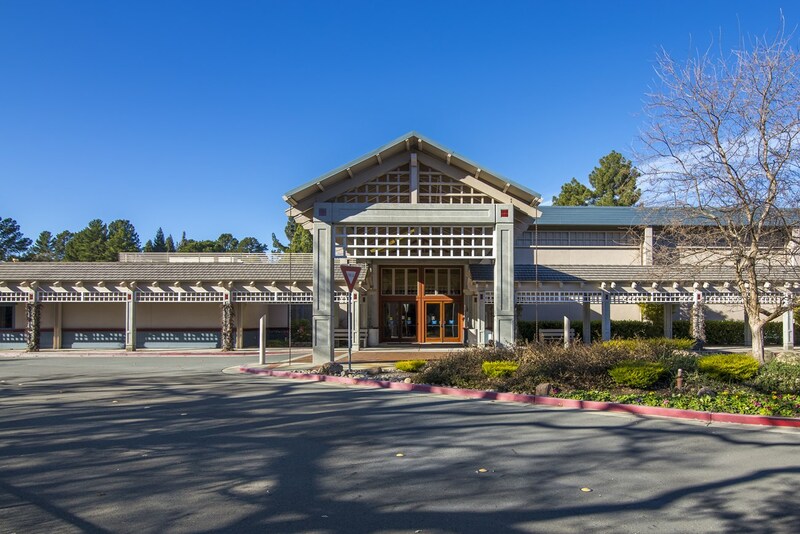 This Sonoma wrap got a complete overhaul, including the addition of a full second bathroom space, expansion of the master bath and relocation of the kitchen. 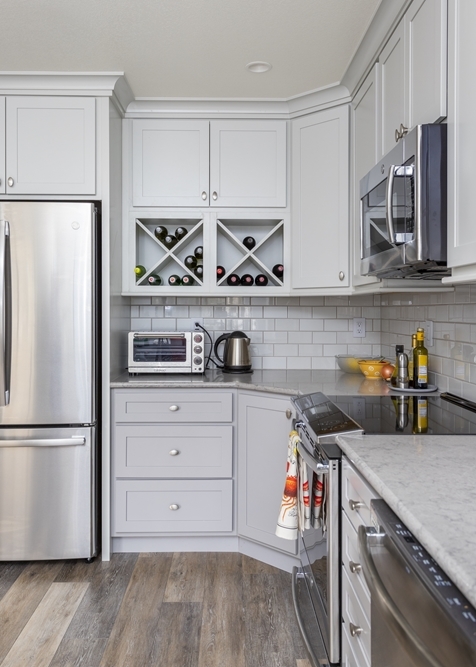 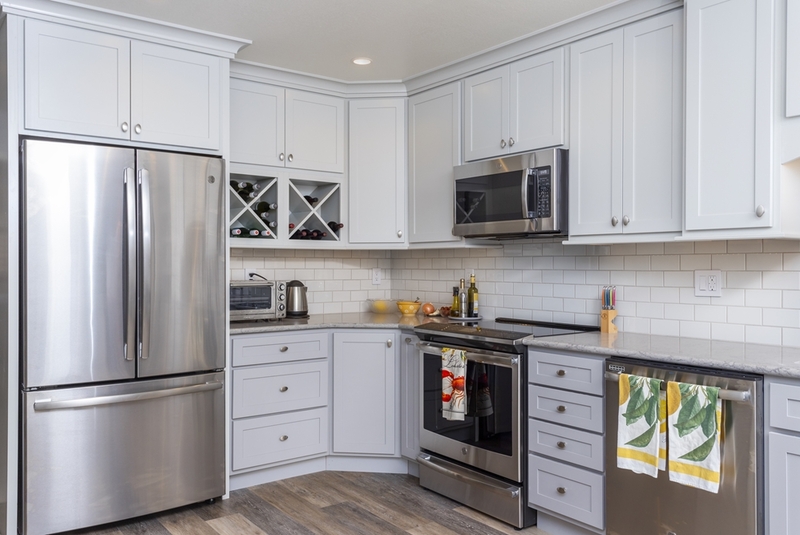 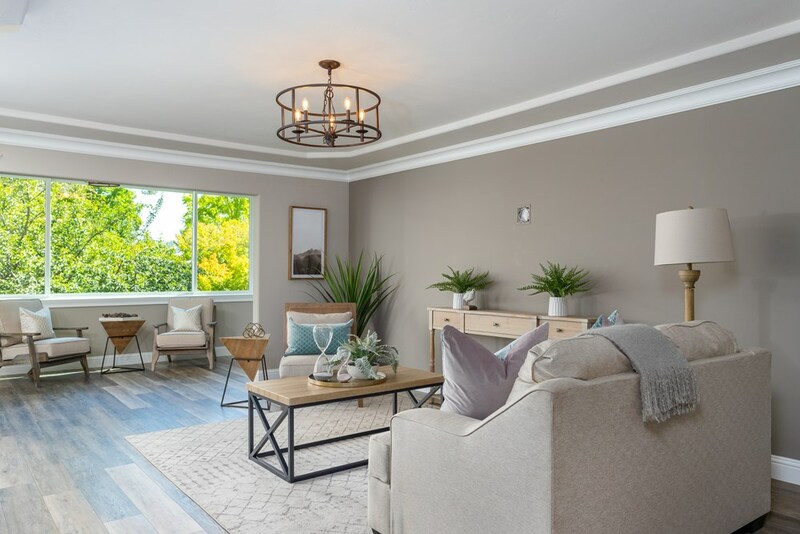 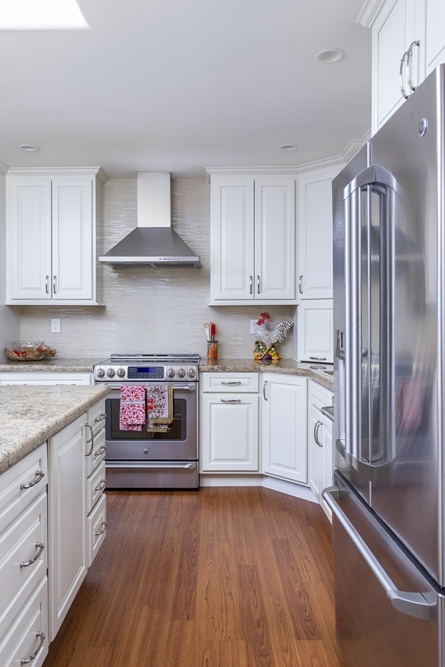 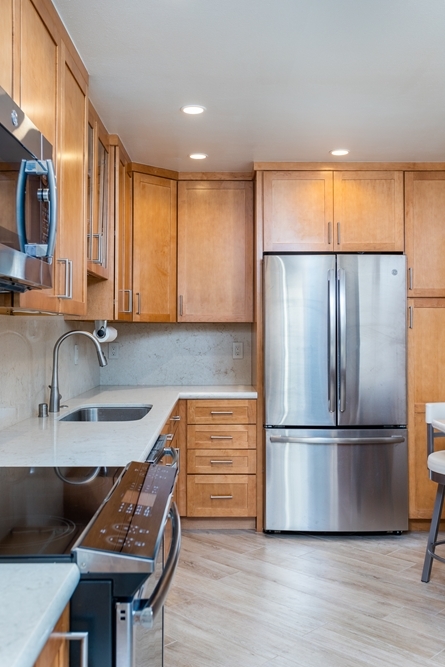 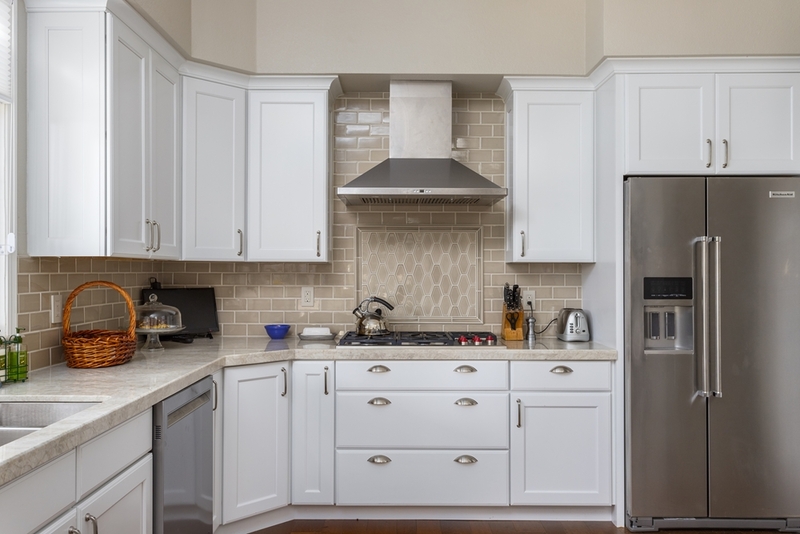 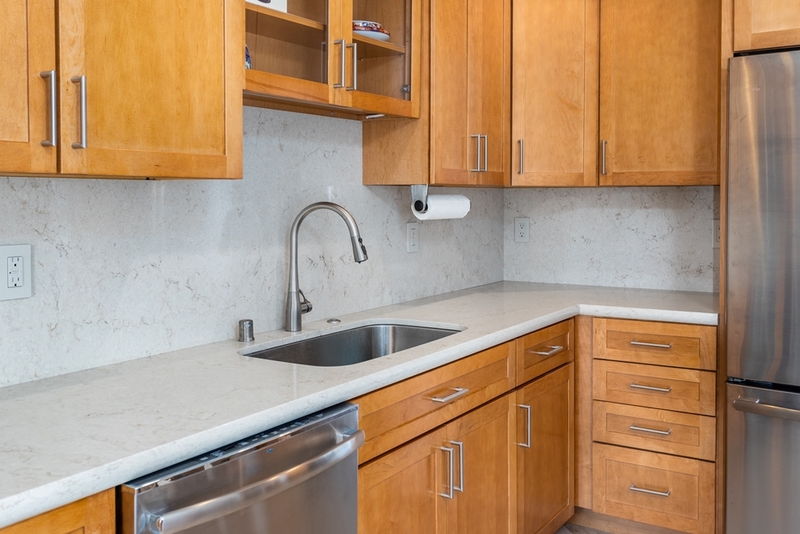 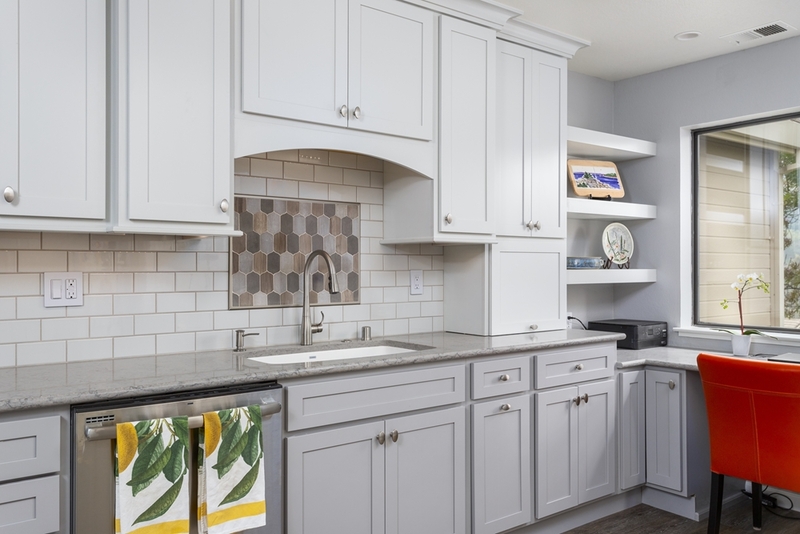 Bright and airy white cabinetry and warm gray-brown tones were used throughout this unit aligned with current color trends. 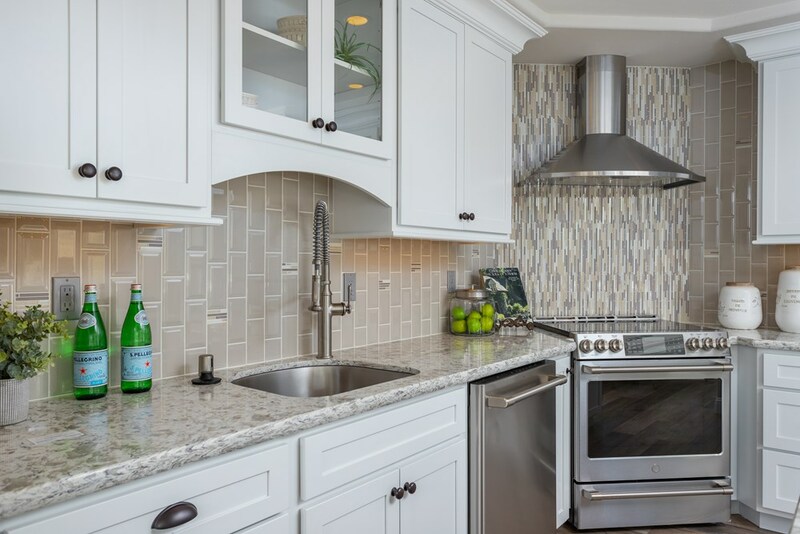 Quartz countertops, ceramic tiled showers and backsplash areas with glass tile accents, and LVT luxury Vinyl Plank flooring are featured. 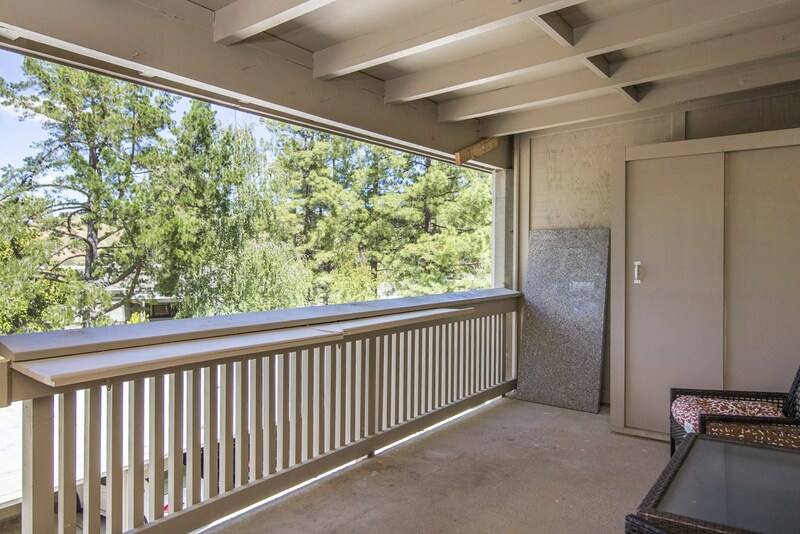 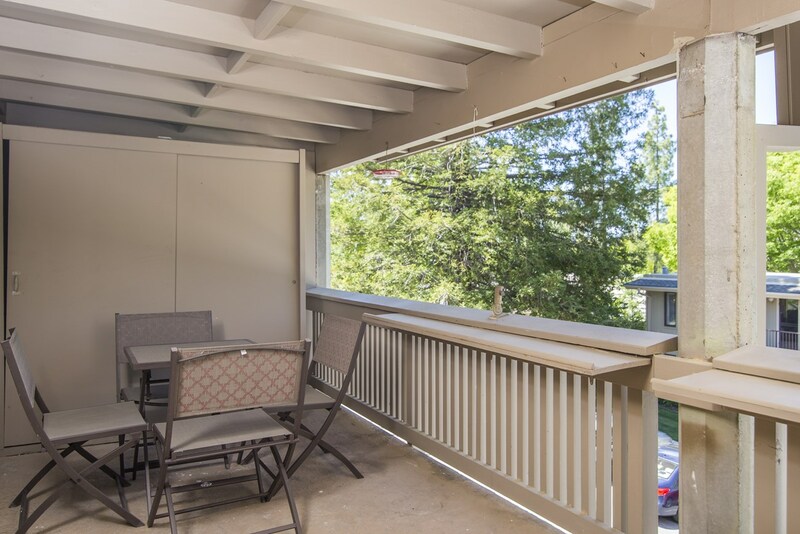 The enclosed veranda was opened up more to the kitchen and living room spaces with glass shelves between the existing two supporting posts. 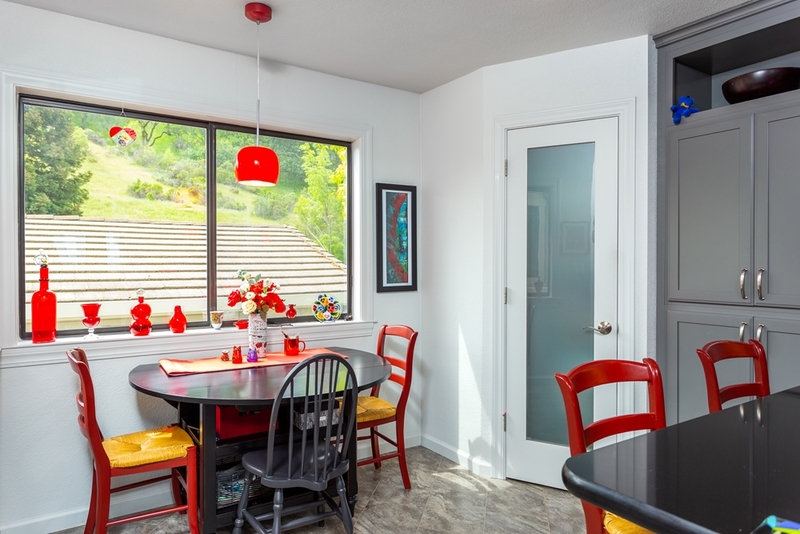 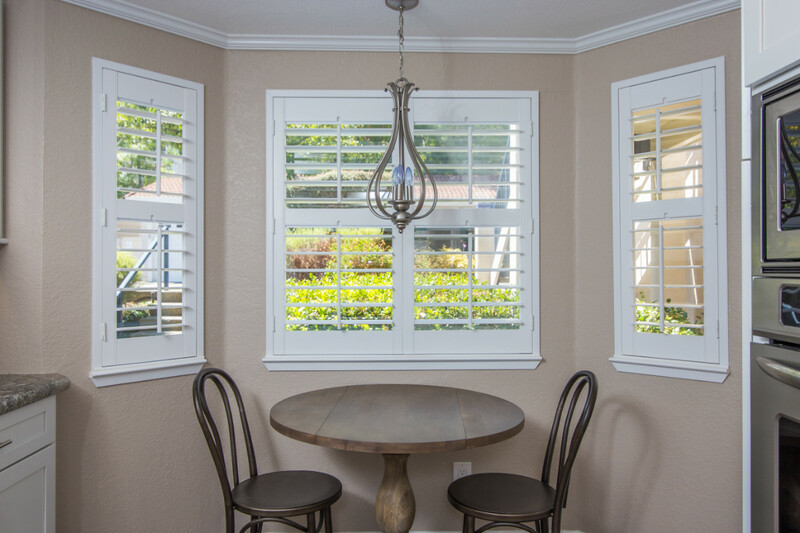 Sometimes inspiration for a space comes from a piece of art, or in this case a great piece of furniture like this client’s kitchen table. 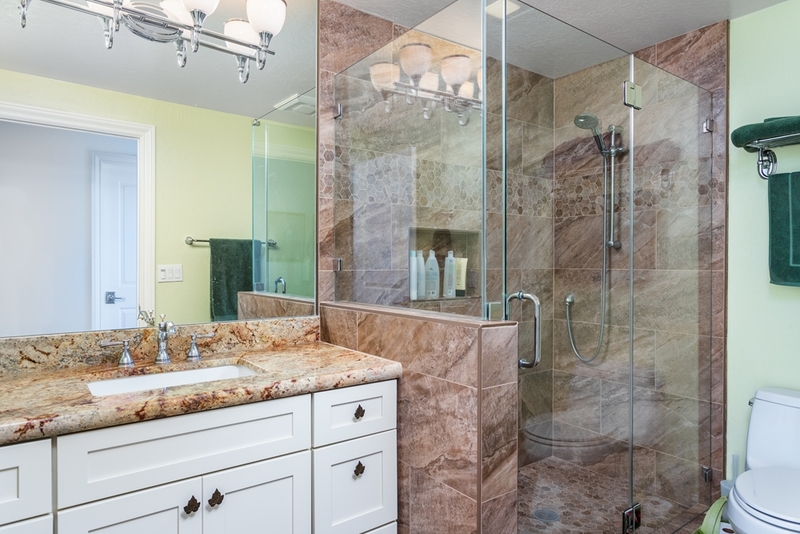 From that piece creams, golds and blues were utilized in the design to compliment it. 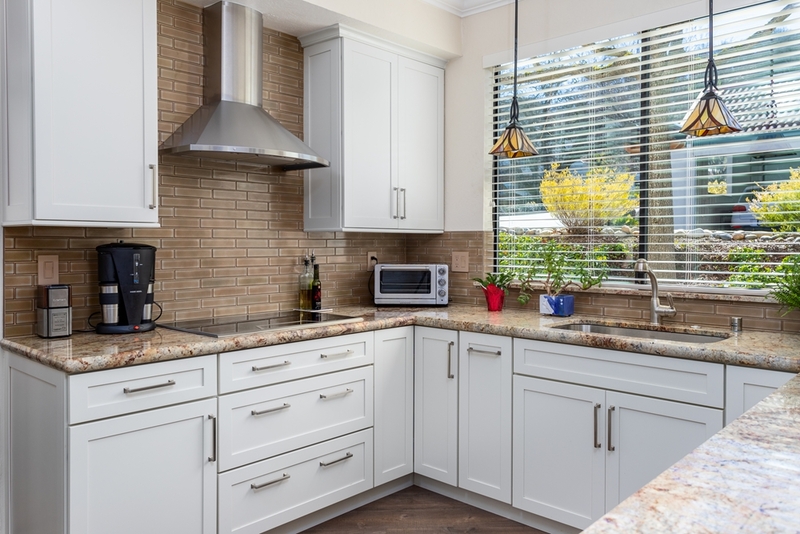 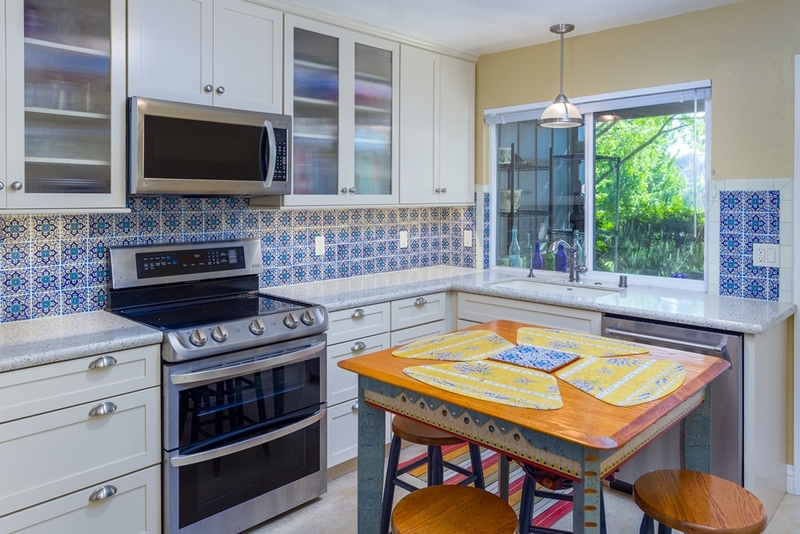 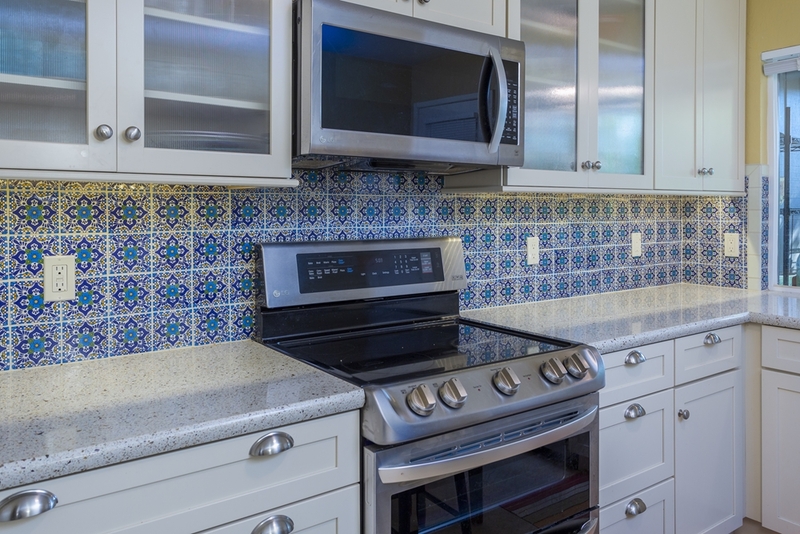 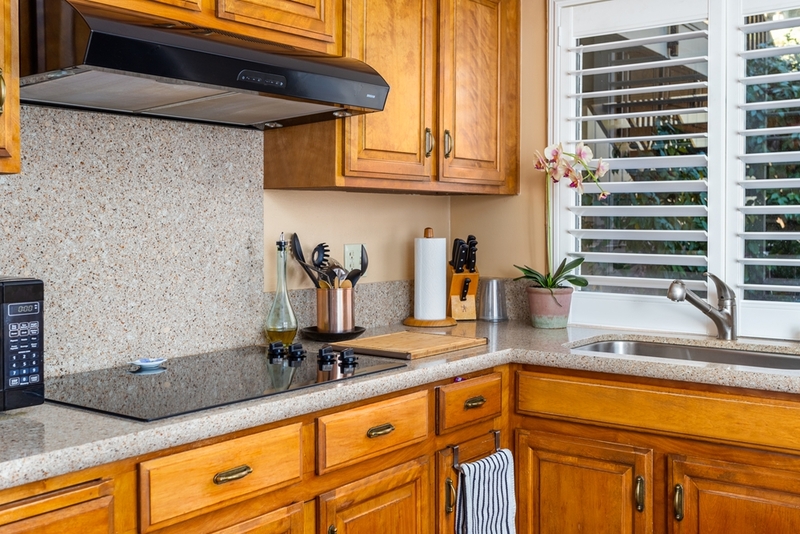 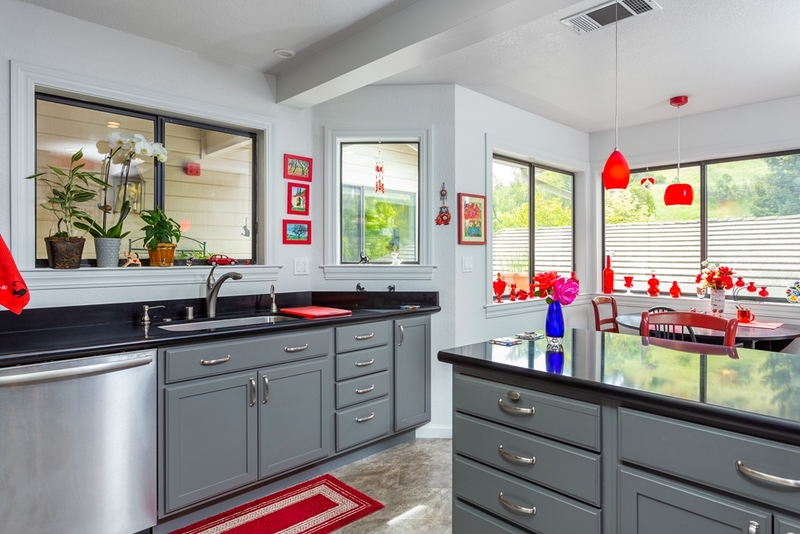 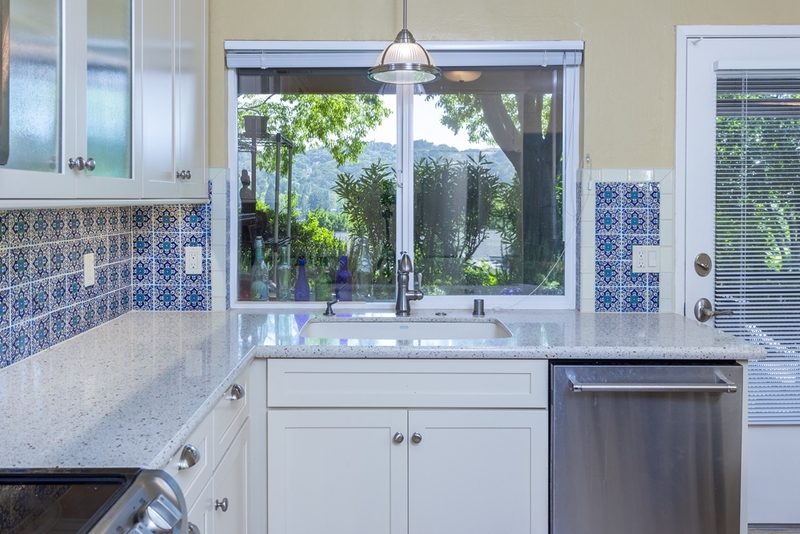 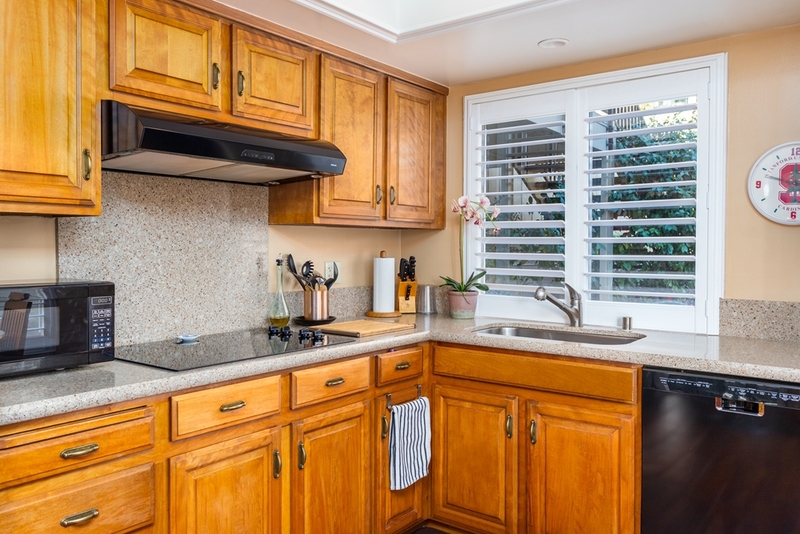 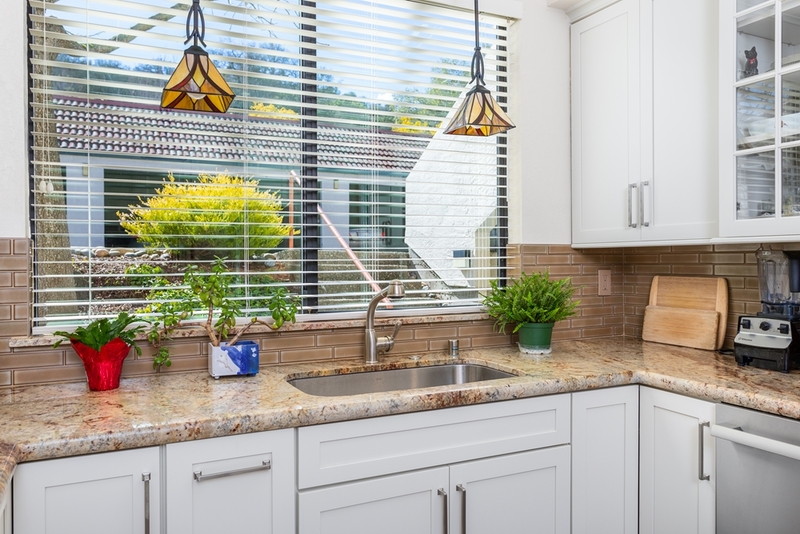 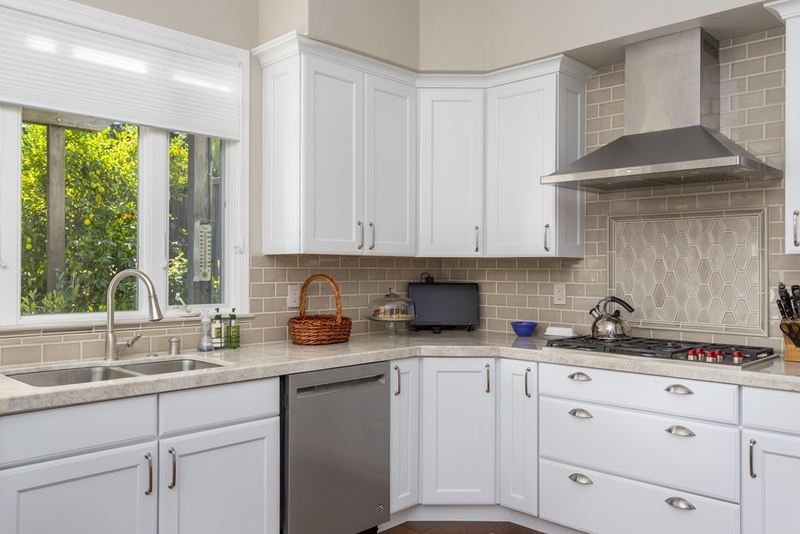 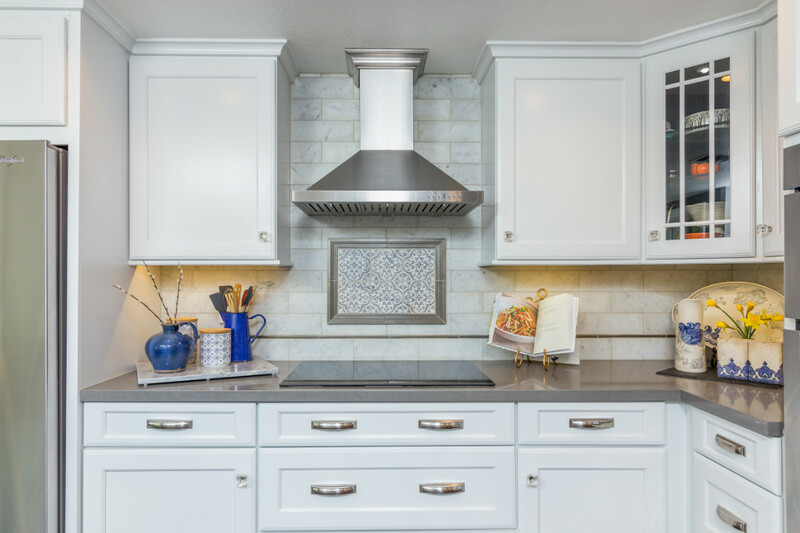 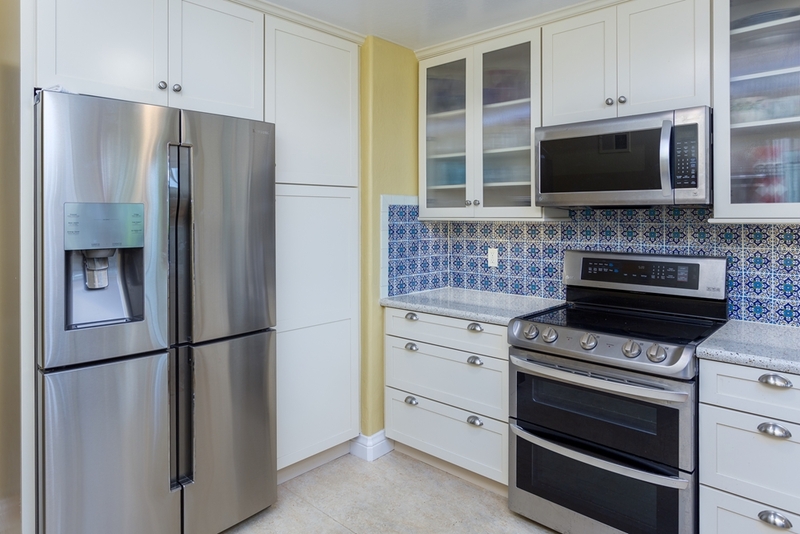 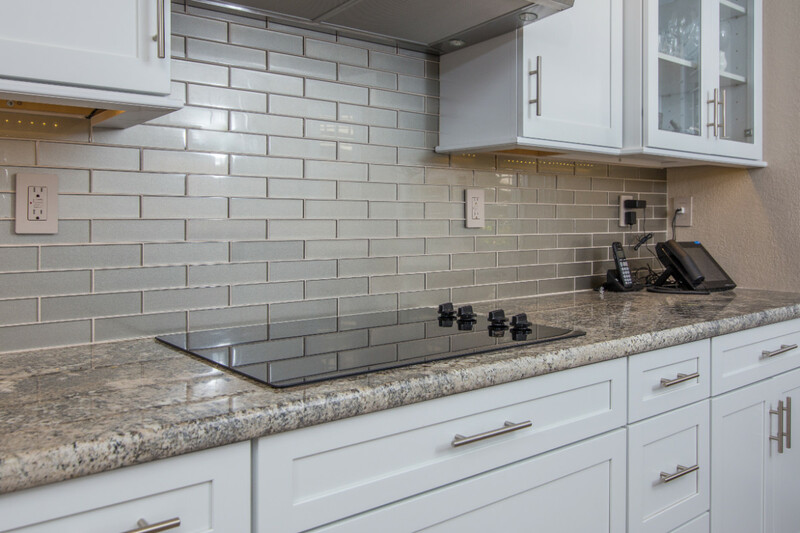 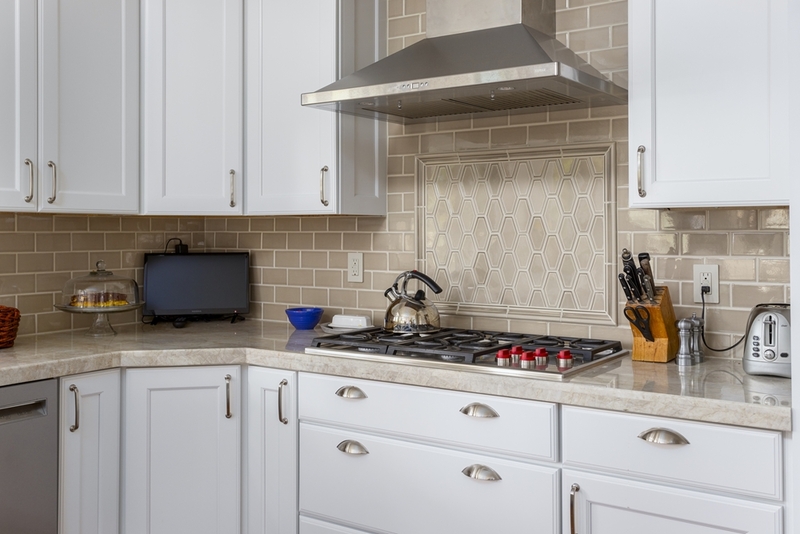 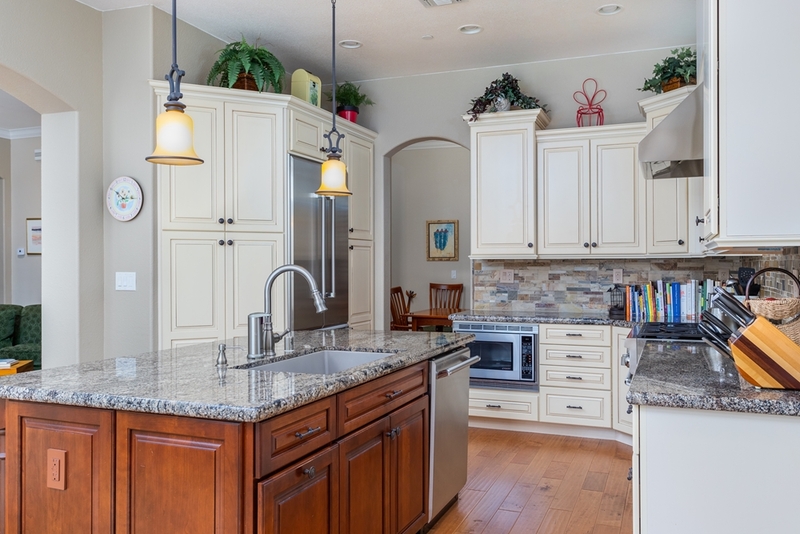 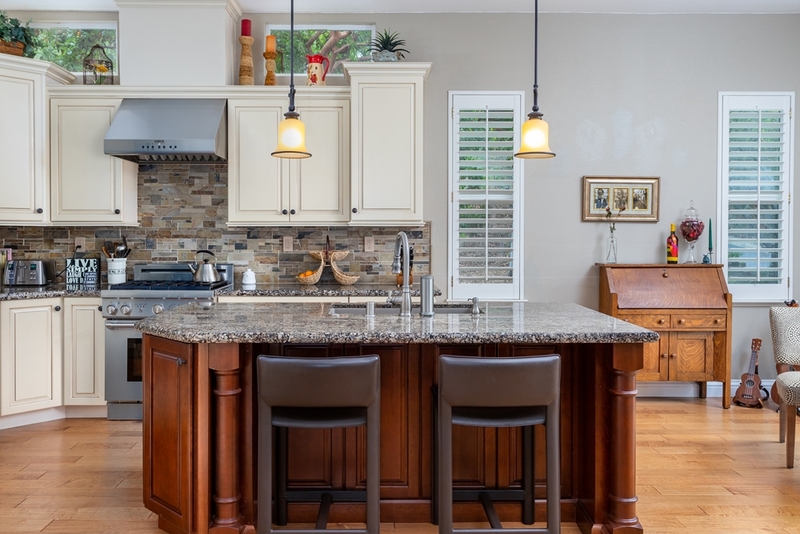 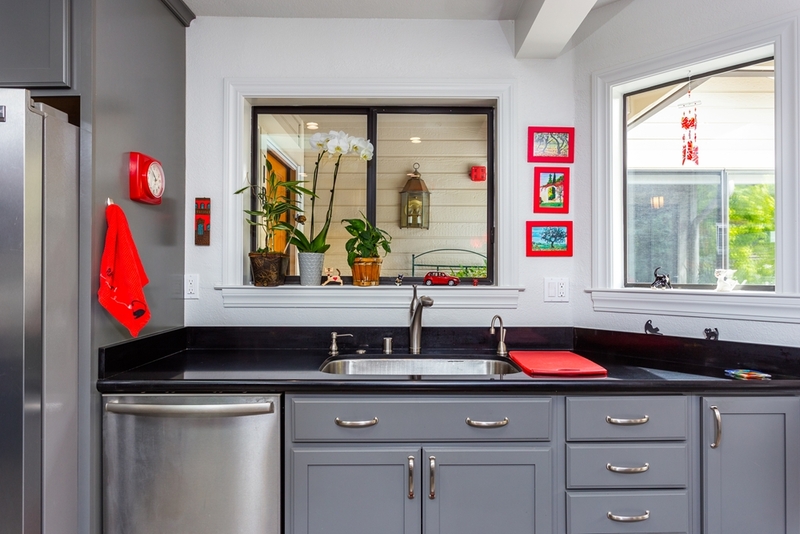 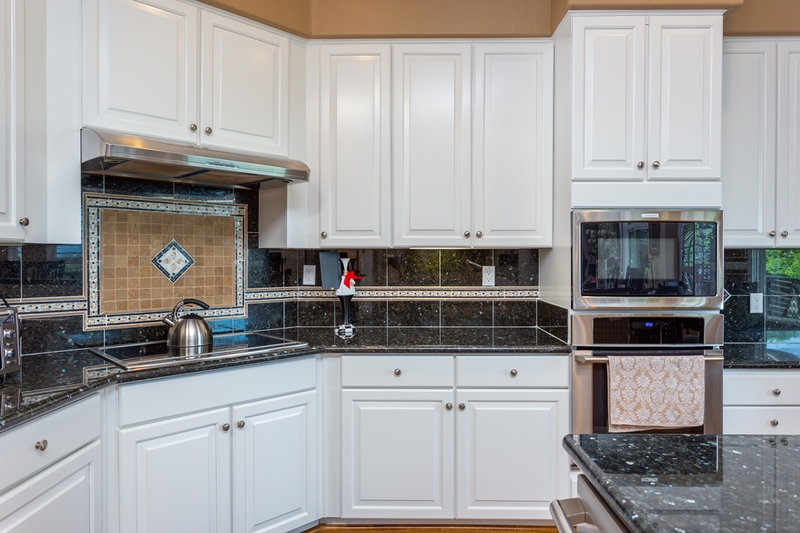 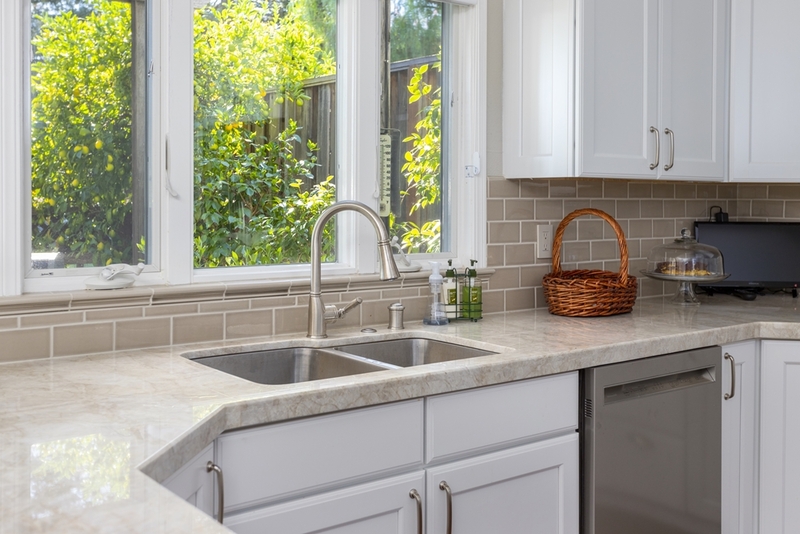 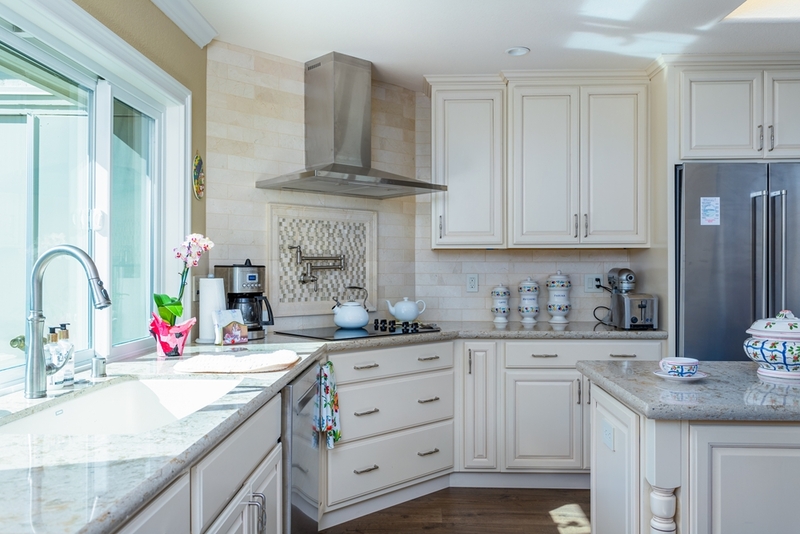 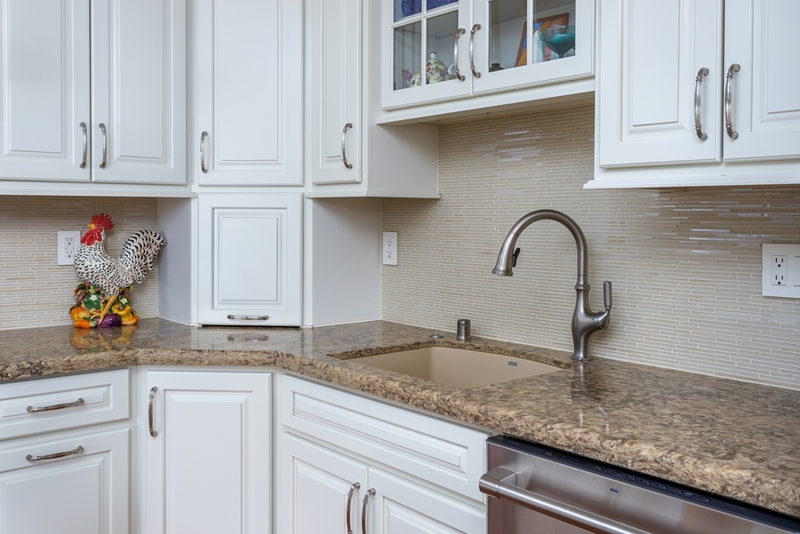 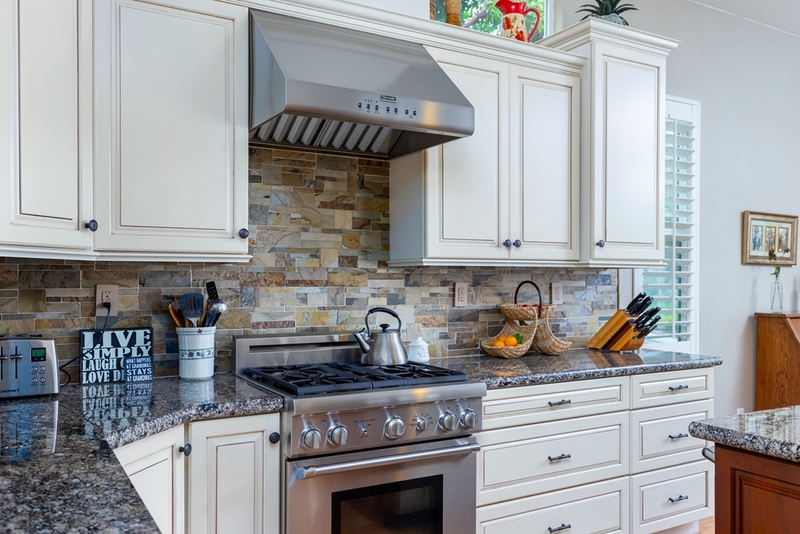 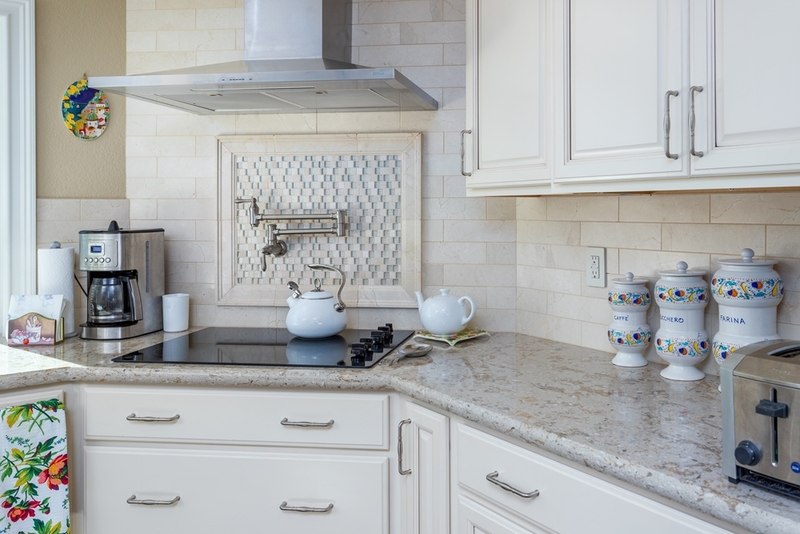 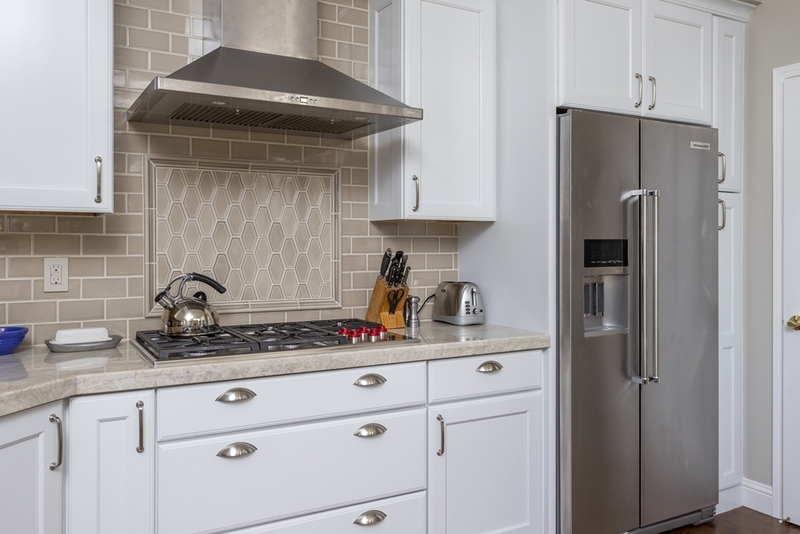 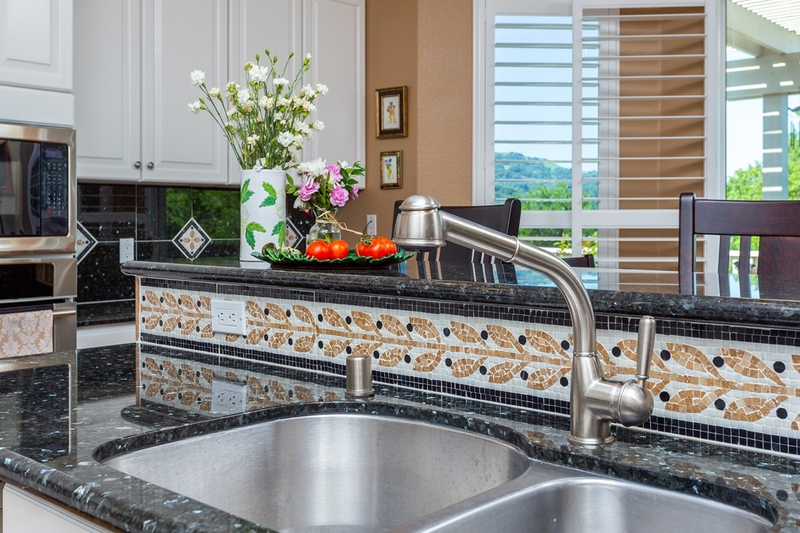 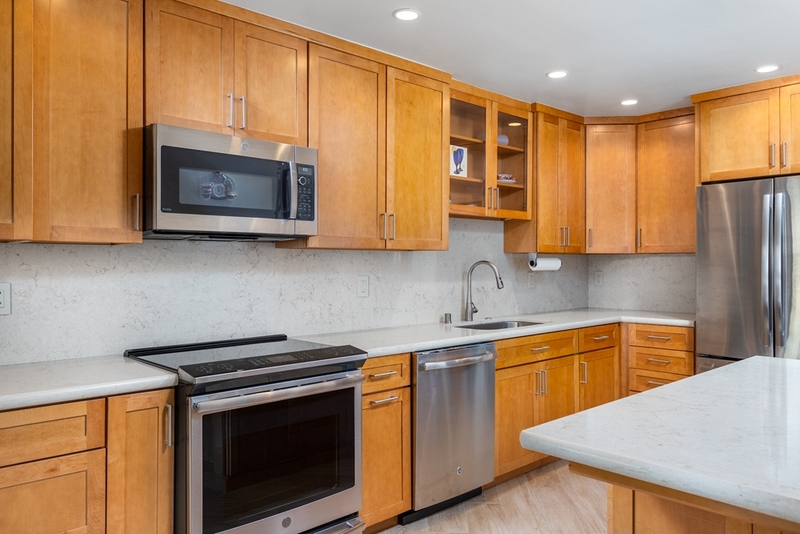 The simplicity of the cream cabinets and fairly simple countertops allowed for a bold punch of fun color with the Mexican style backsplash tiles. 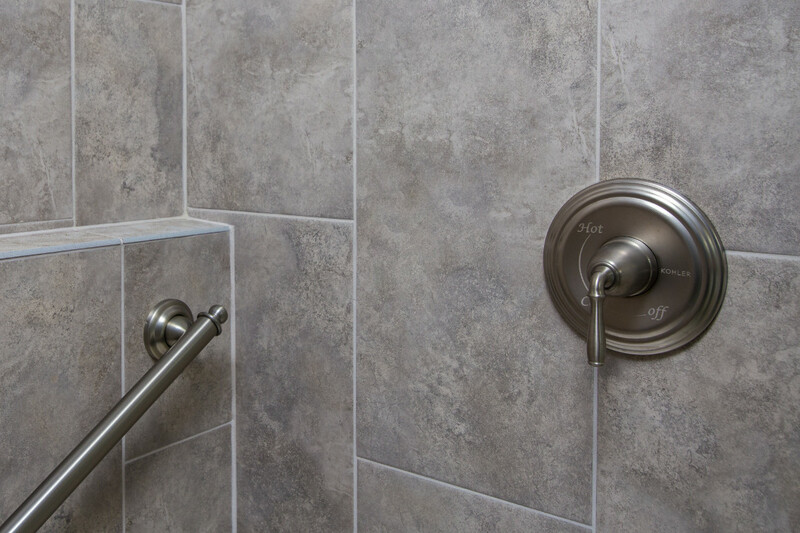 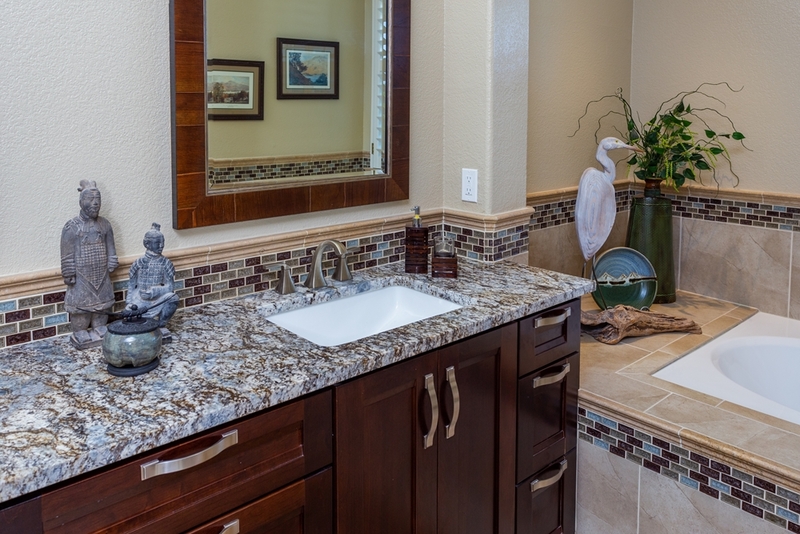 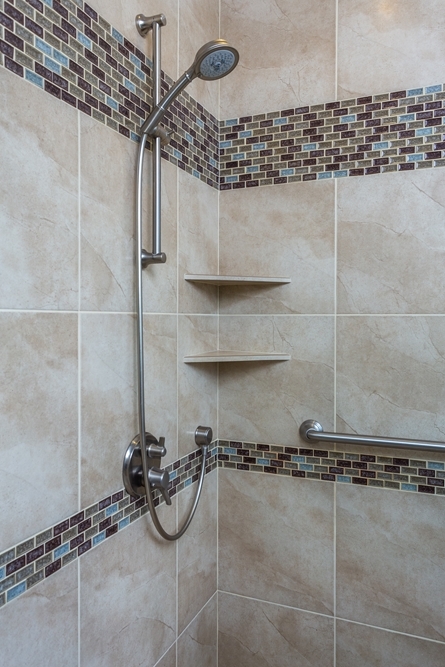 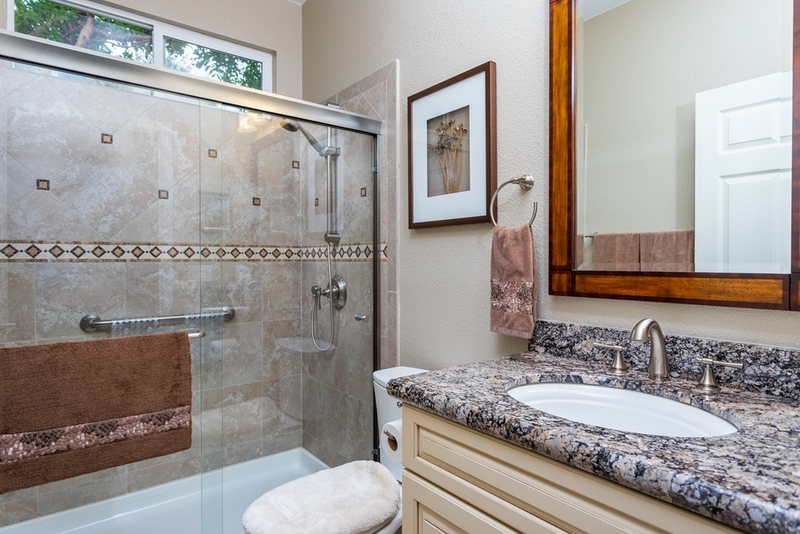 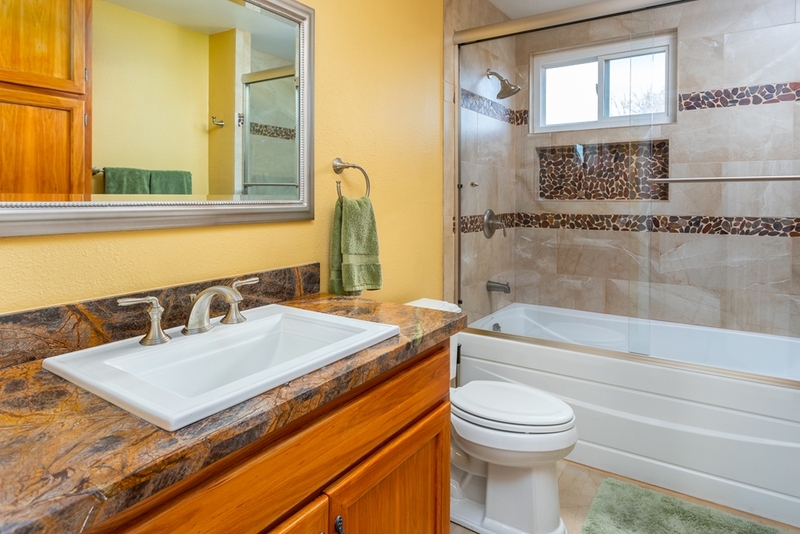 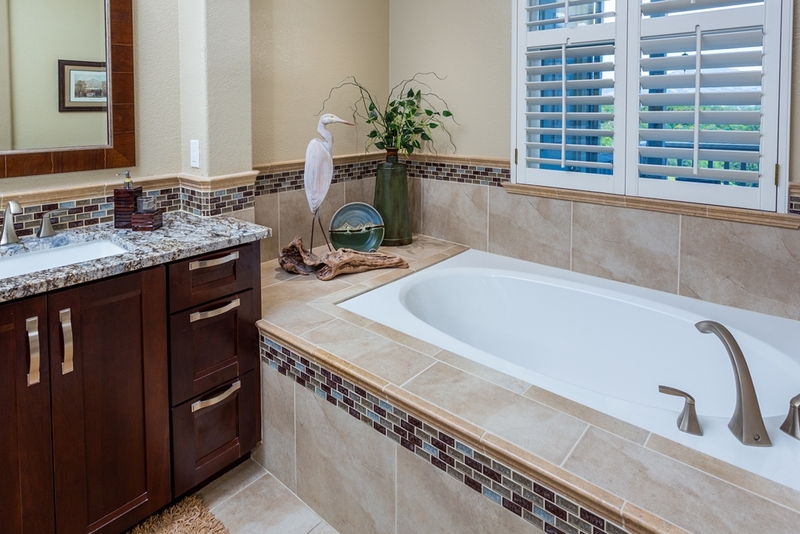 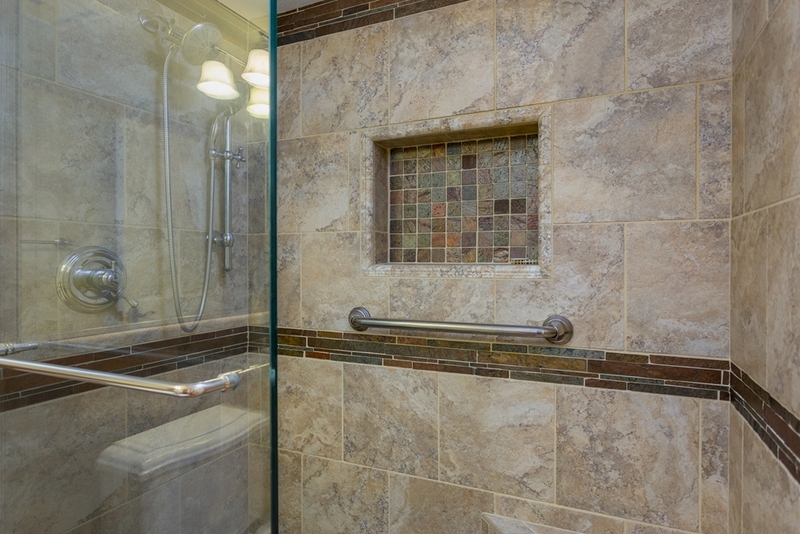 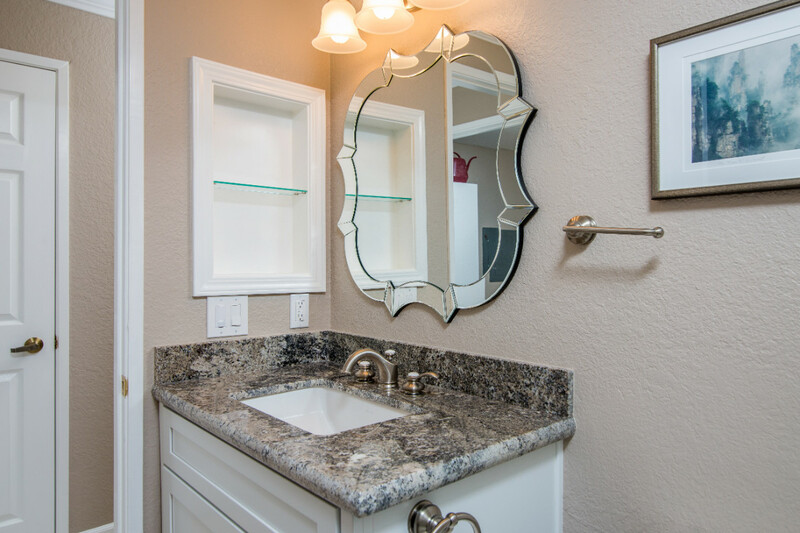 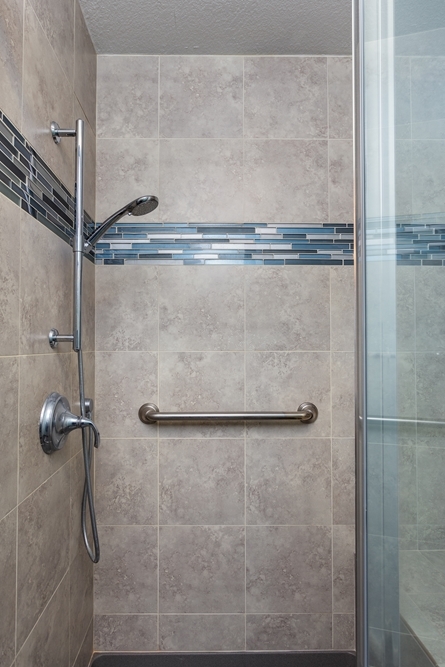 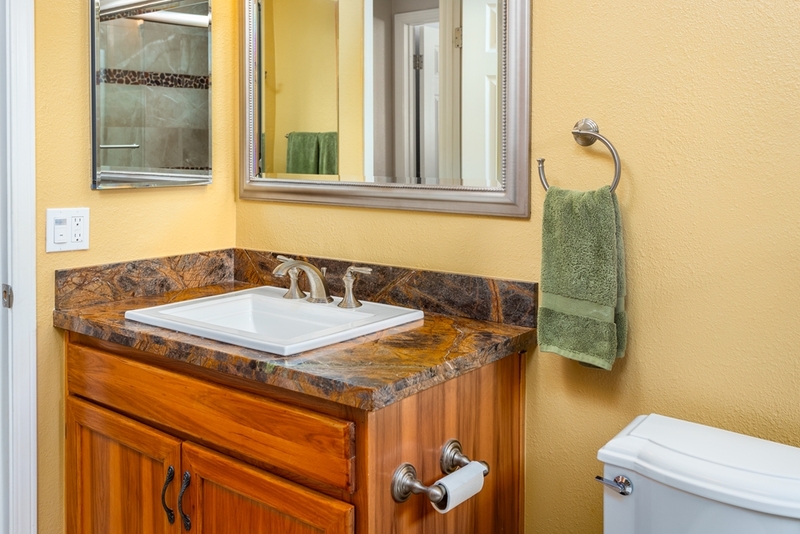 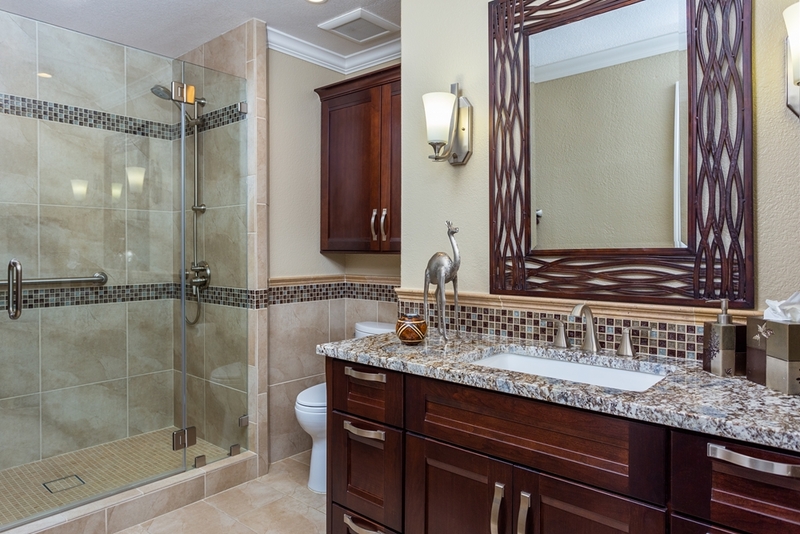 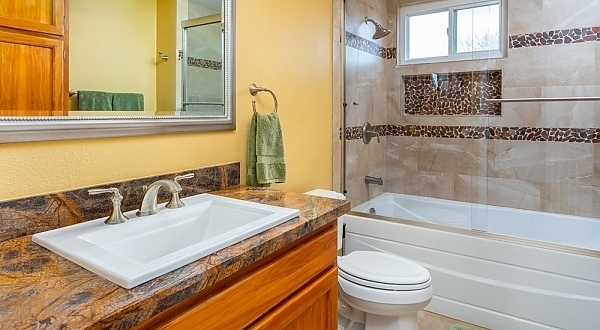 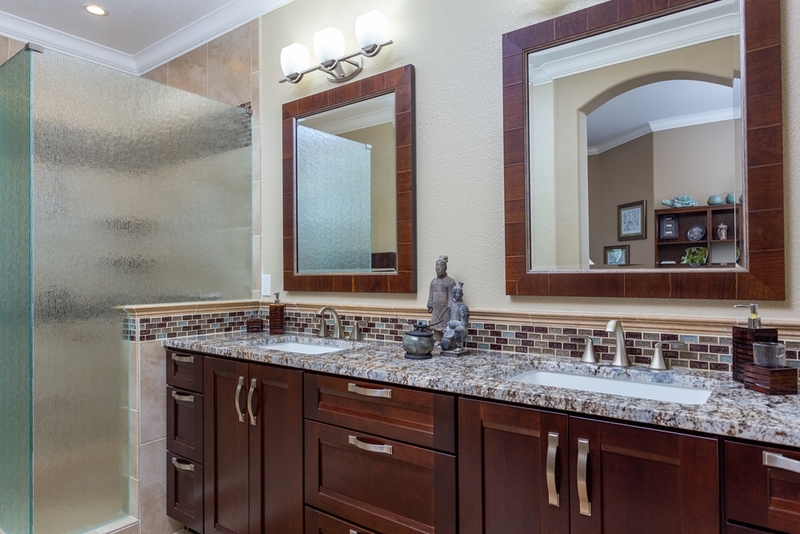 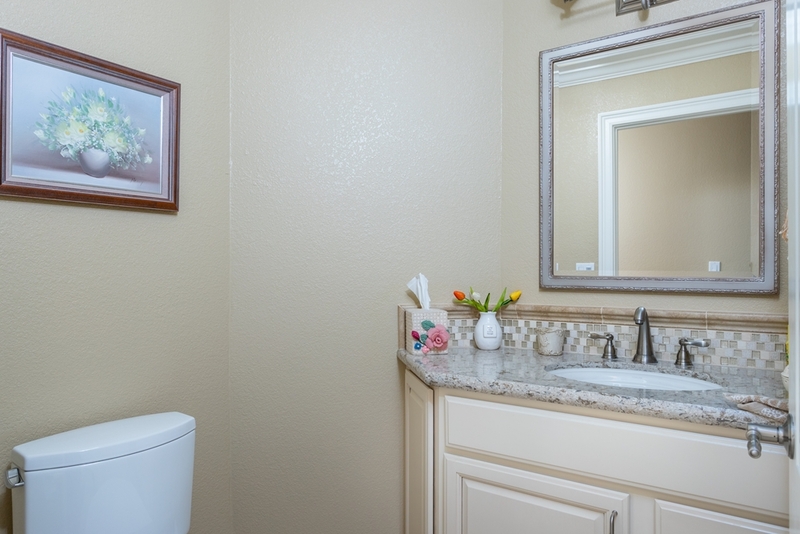 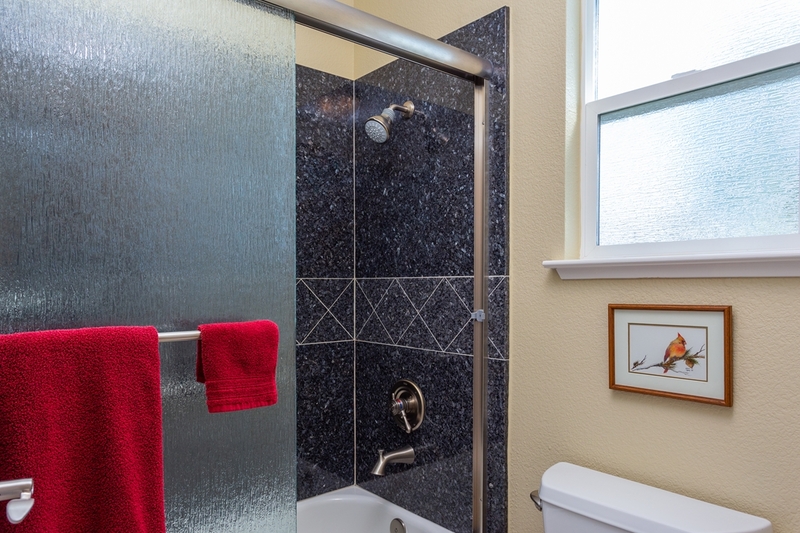 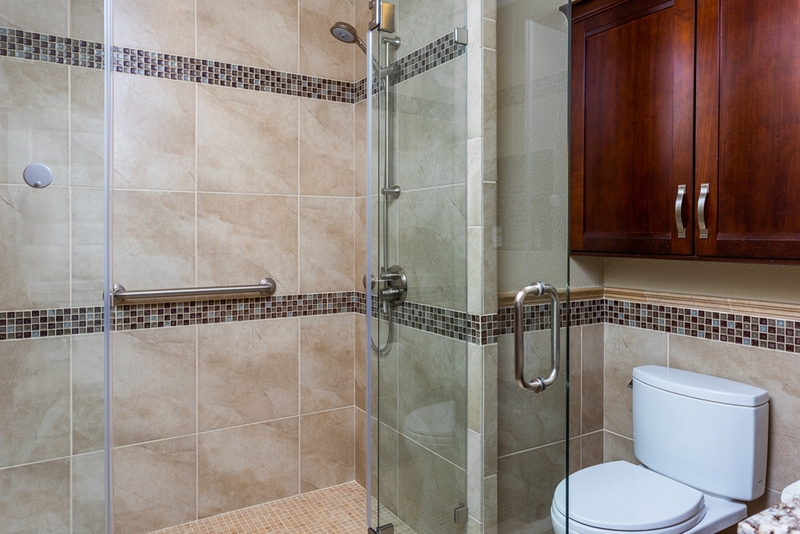 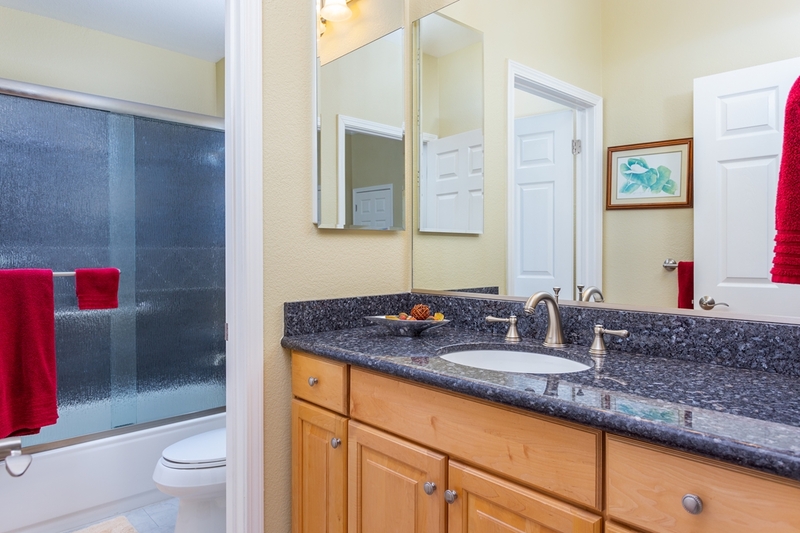 In the bathroom we used rich red slate accents with a fairly neutral color scheme to give it a nice pop of color. 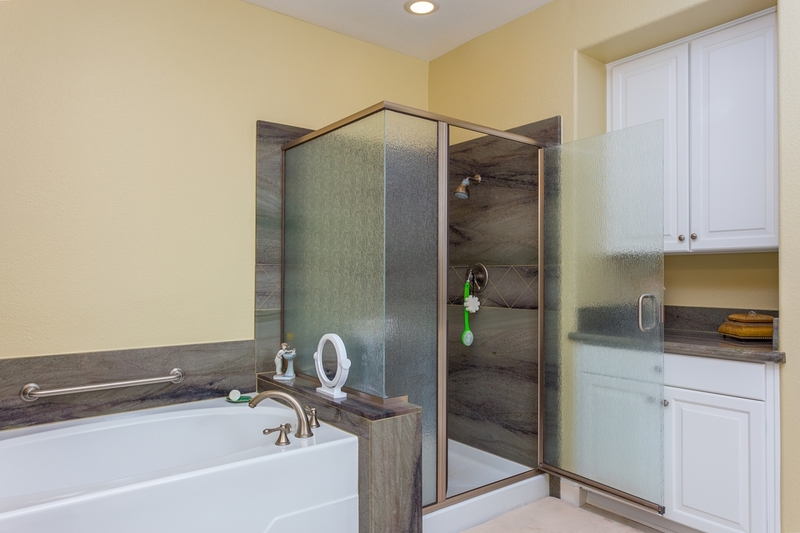 The clients were also concerned with using green materials and thus glass recycled countertops were chosen for both spaces. 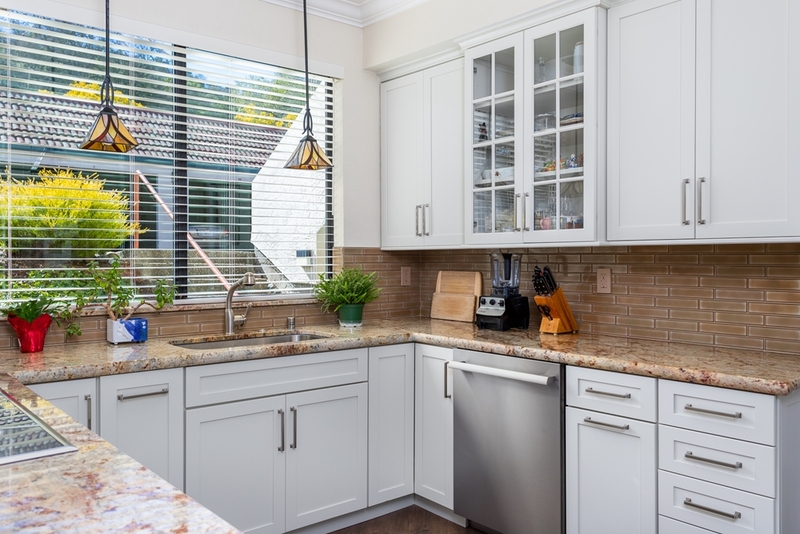 This kitchen was reconfigured in order to make a more functional work triangle, and also to open up and enhance the space. 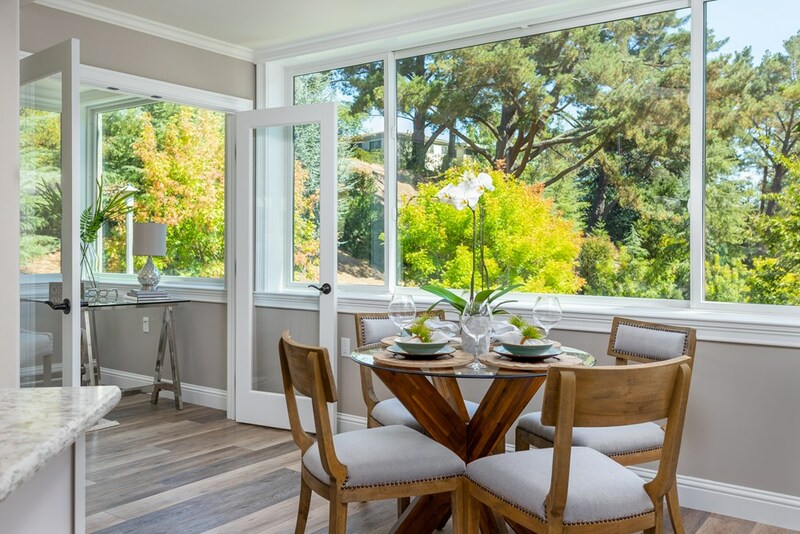 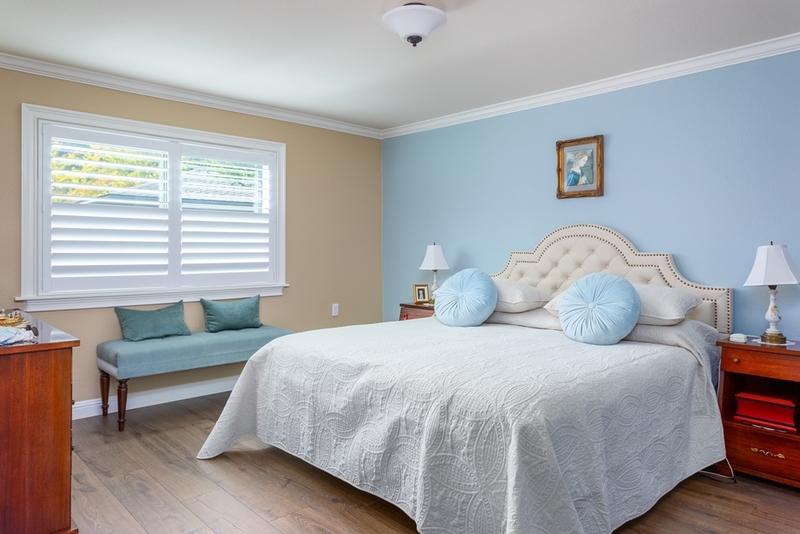 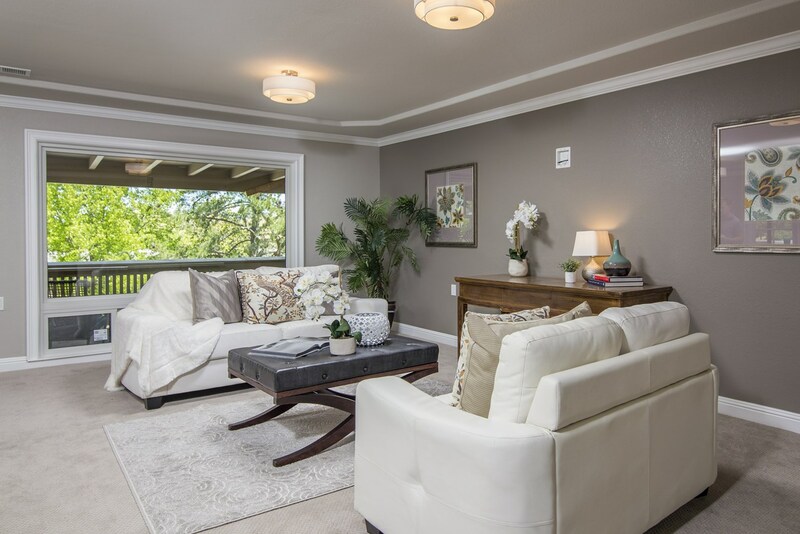 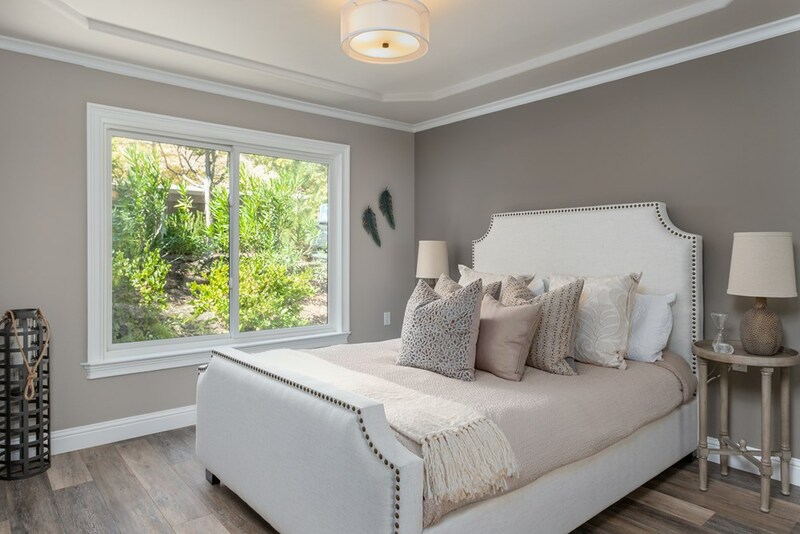 Subtle creams and whites make for a soothing, restful pallet, grounded by the rich hardwood floors. 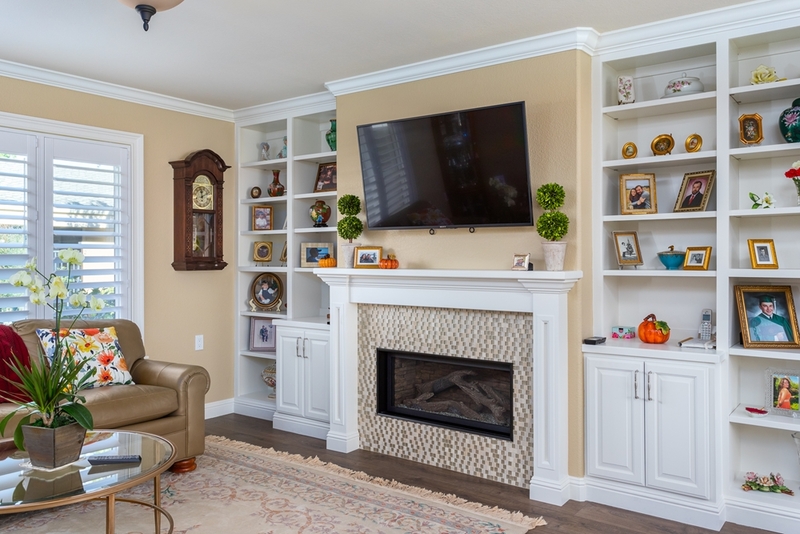 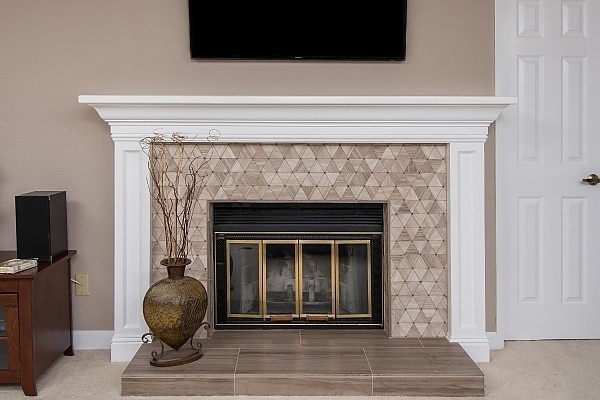 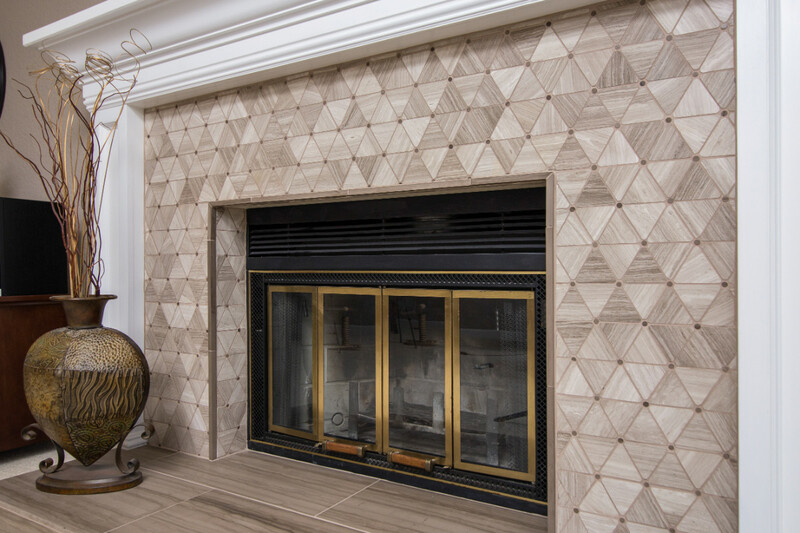 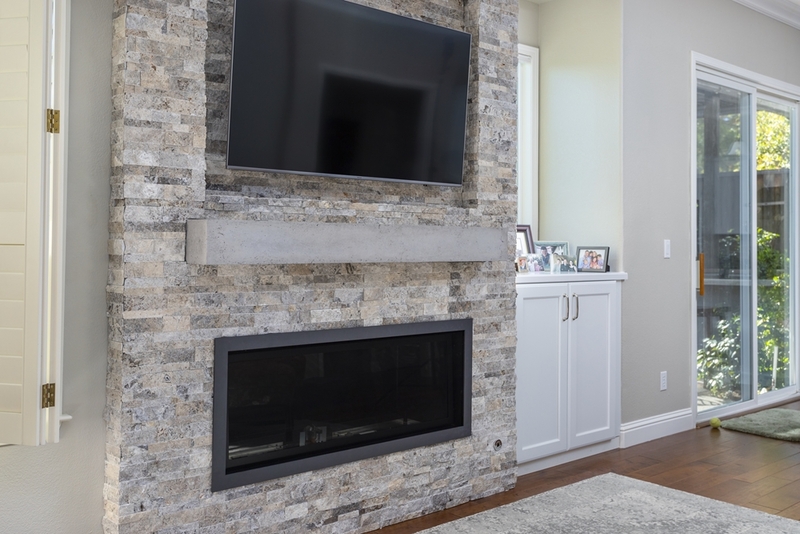 The fireplace area was modernized to allow for a linear fireplace and wall mounted TV, with the extra drama of floor to ceiling stone work. 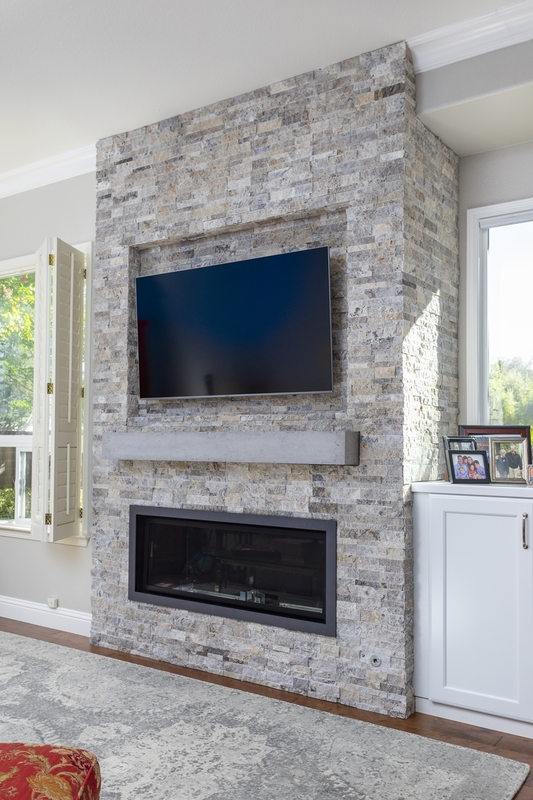 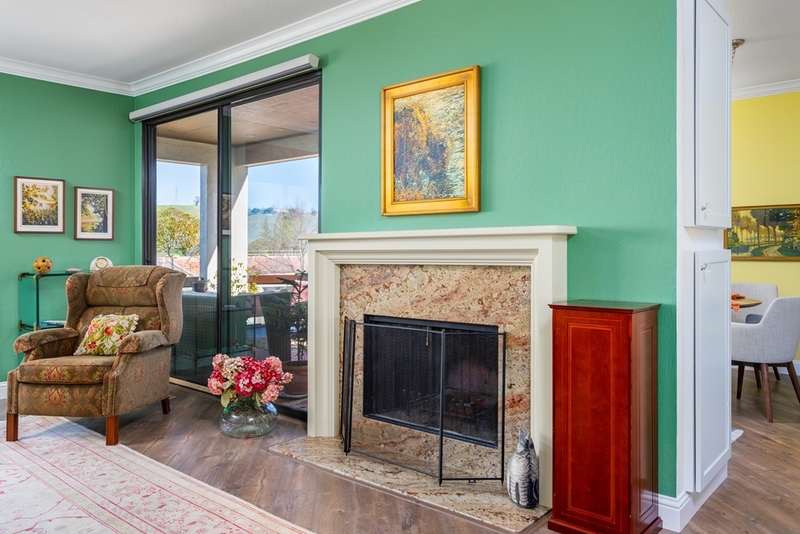 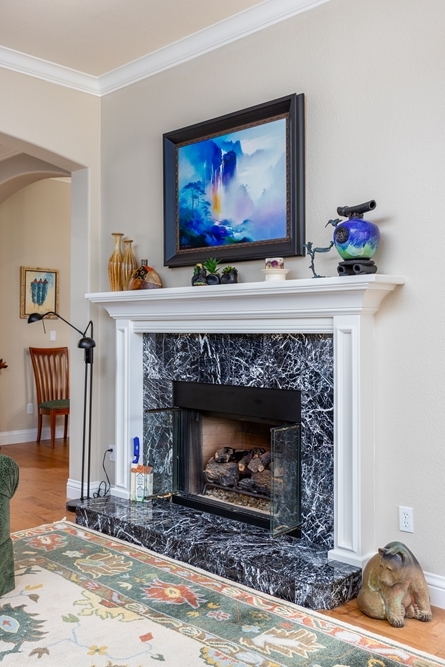 A cement cast mantle allows for heat deflection. 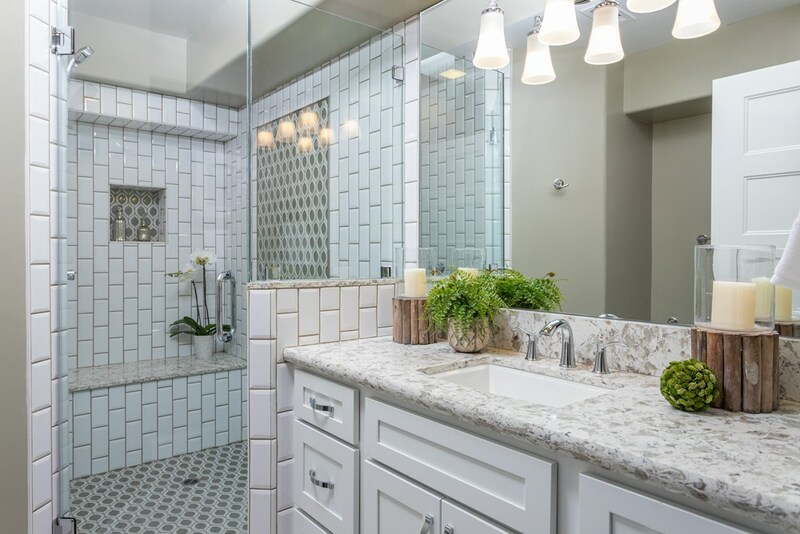 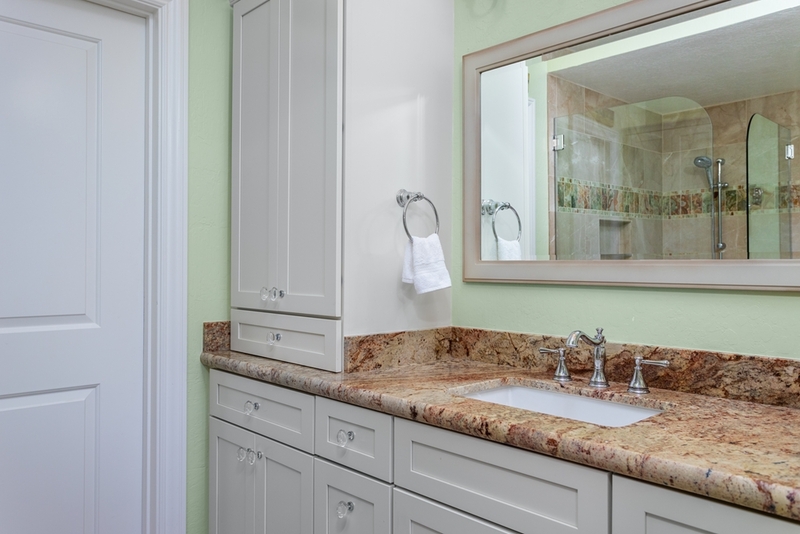 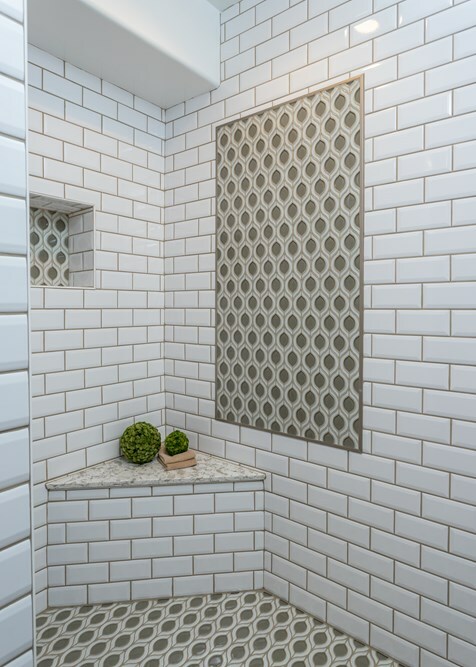 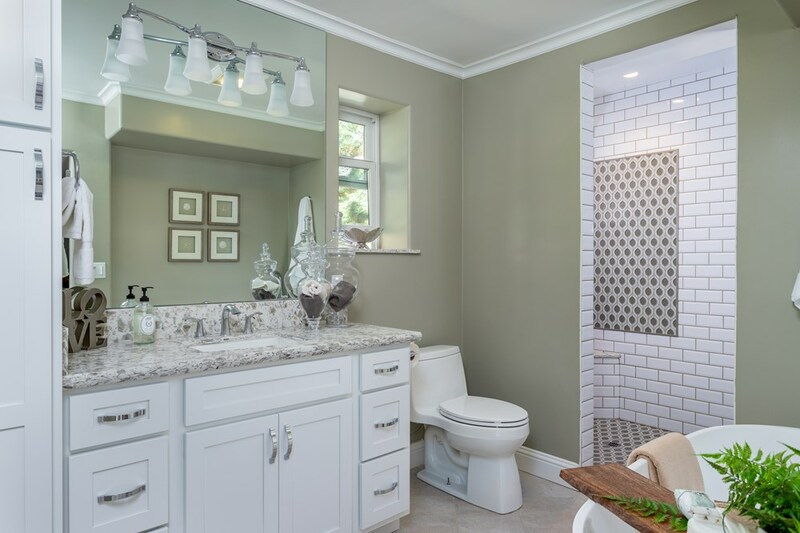 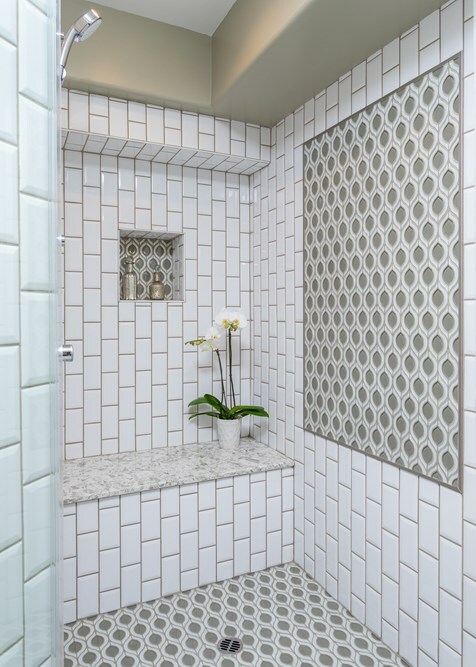 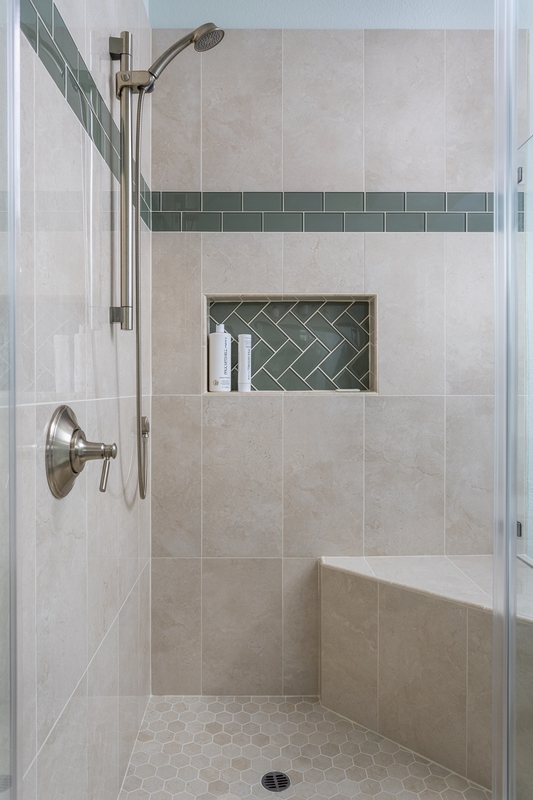 In the master bathroom Green Accents in the tile work and quartz countertops bring a little drama to the otherwise subtle creamy tones. 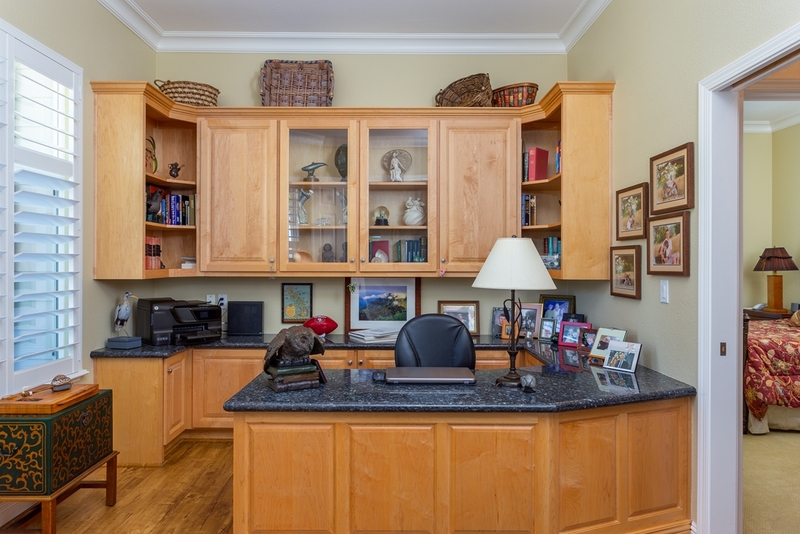 We built the desk and storage cabinetry on site for the client to create the perfect office space customized to her specific needs. 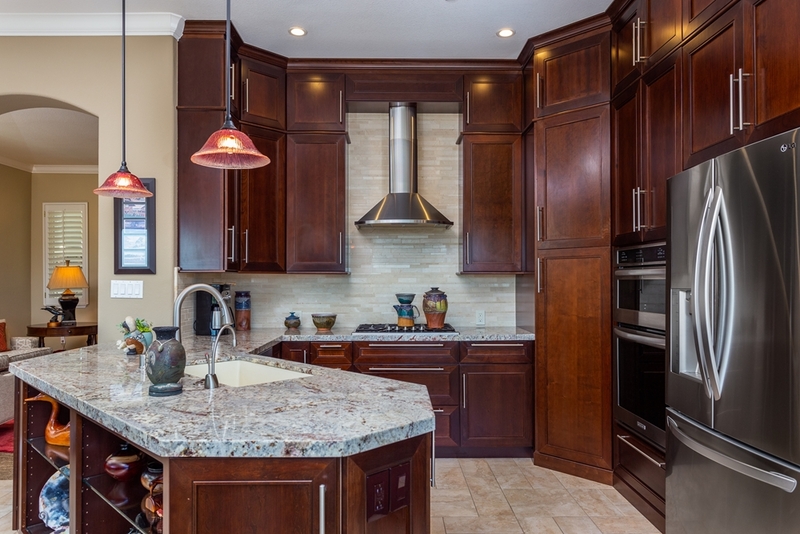 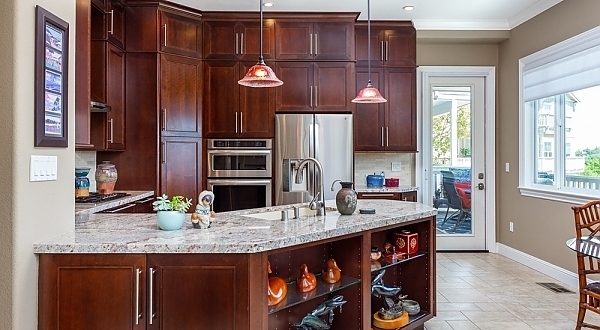 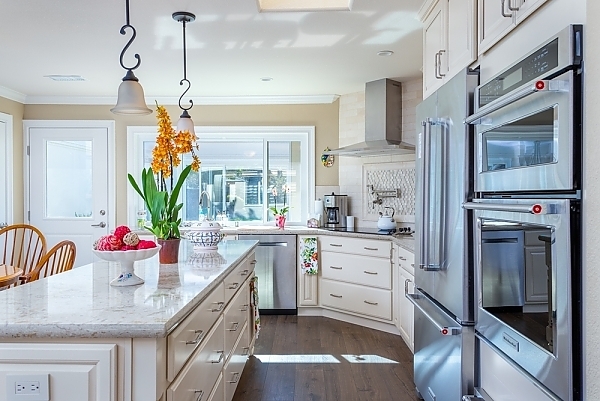 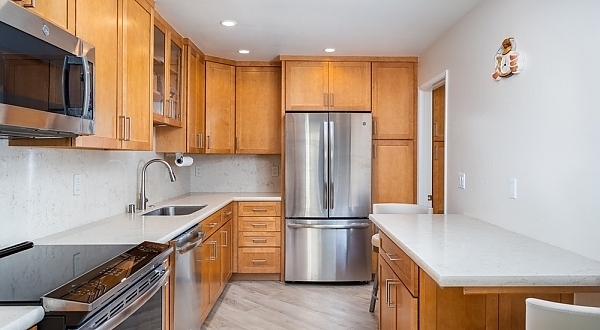 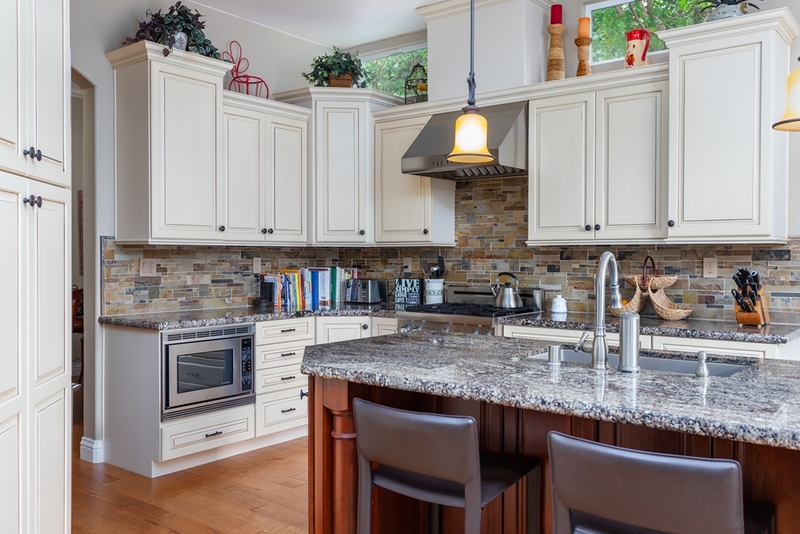 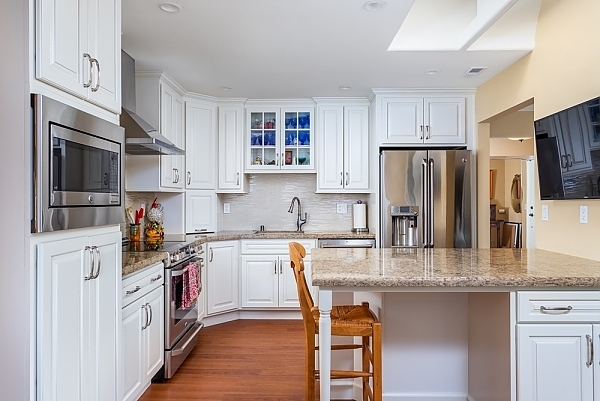 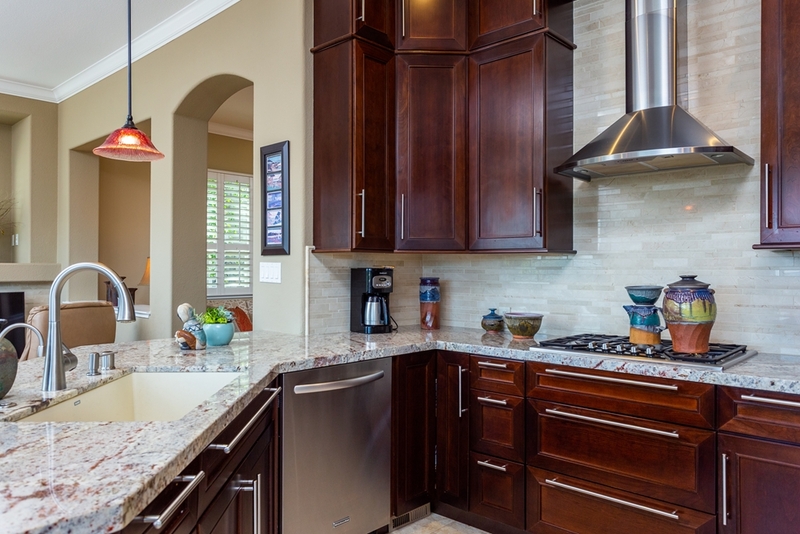 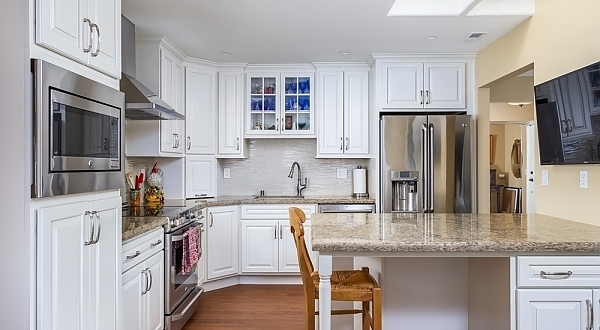 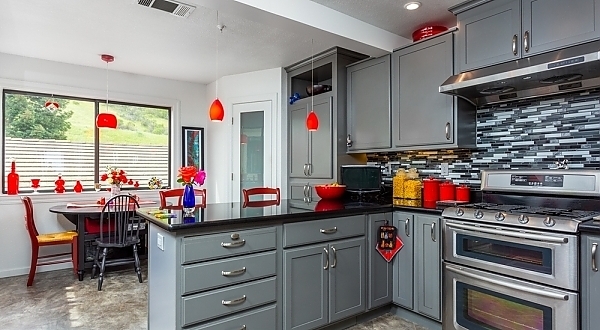 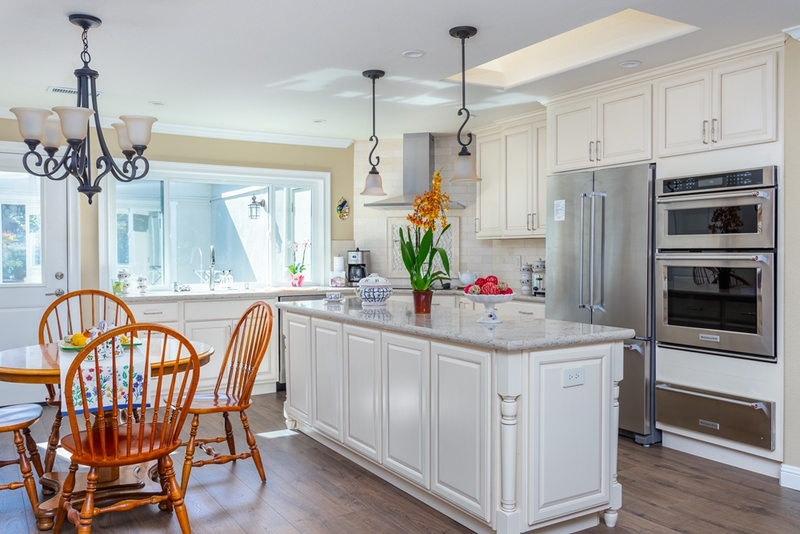 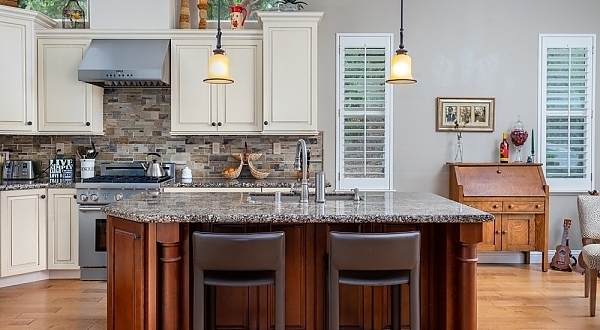 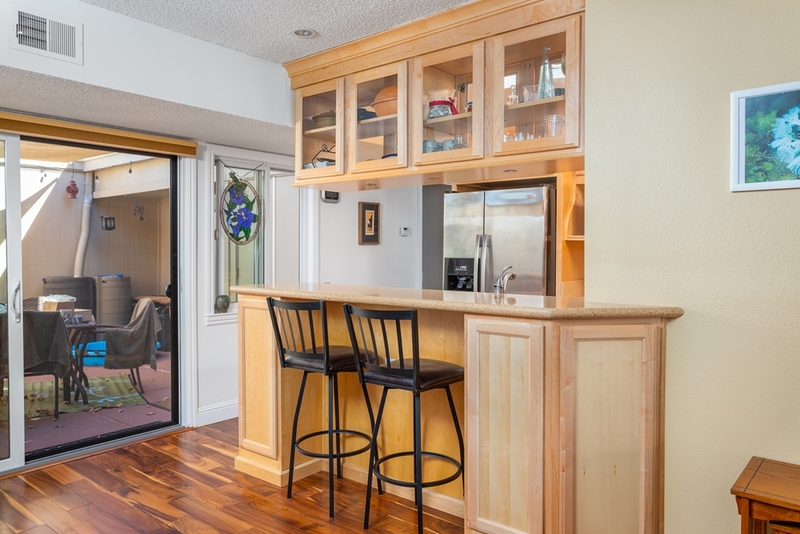 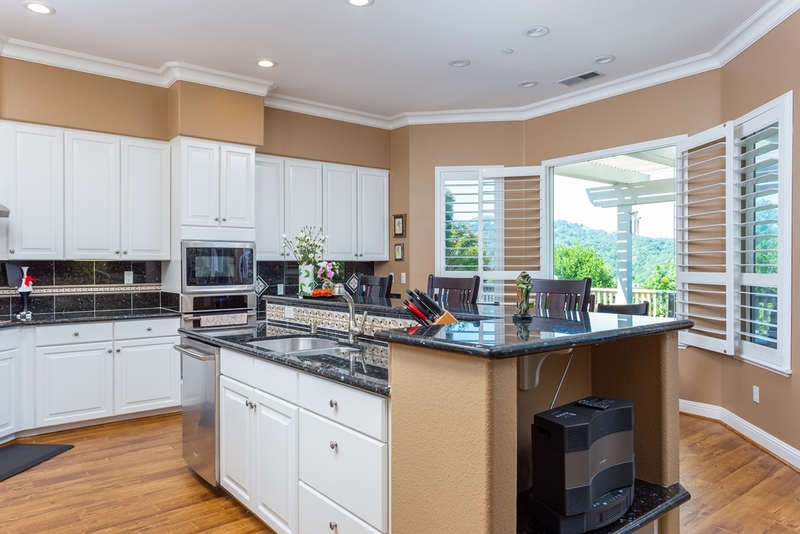 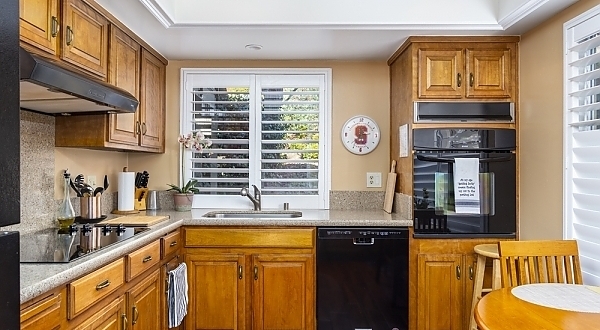 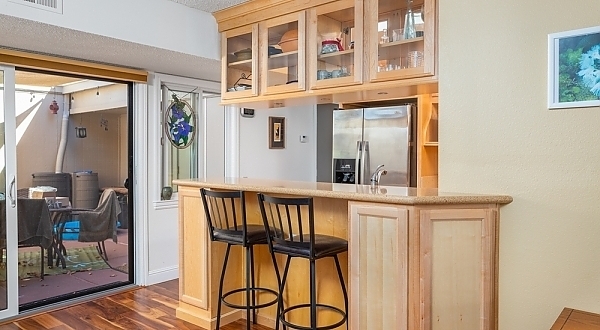 This kitchen space was opened up, eliminating an oppressive peninsula that cramped the space. 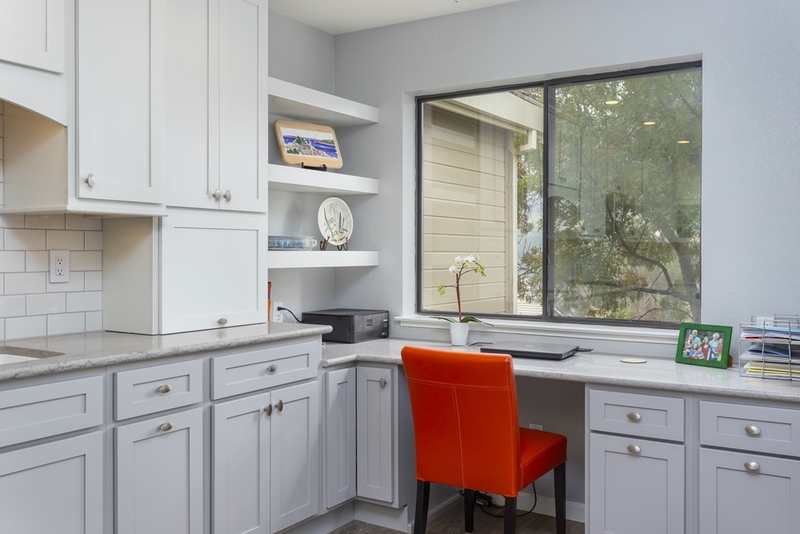 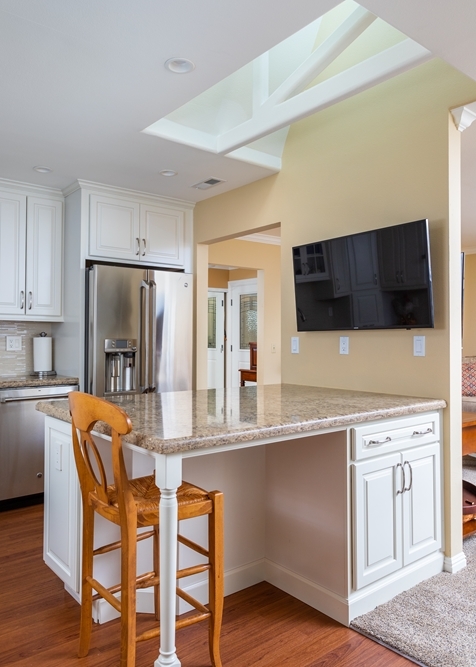 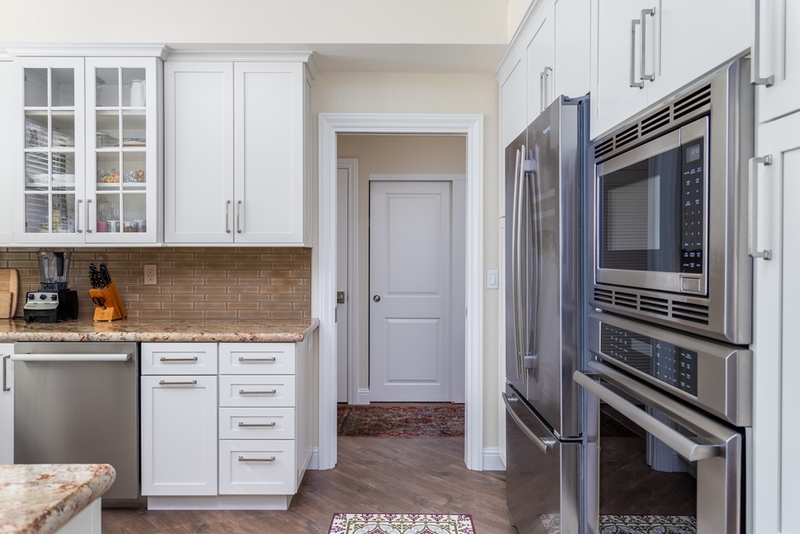 Better organized cabinetry extended into the nook side of the kitchen more than made up for the loss of the peninsula and a built-in desk area more to the client’s specific needs was installed in the original nook space. 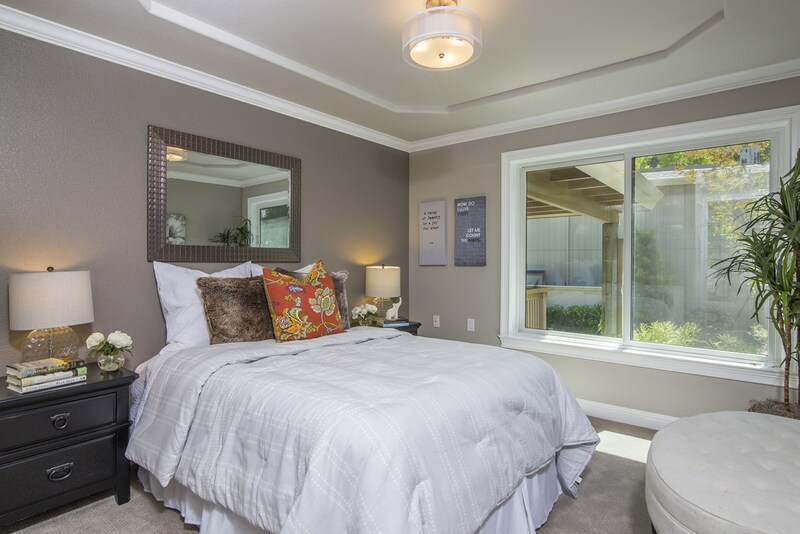 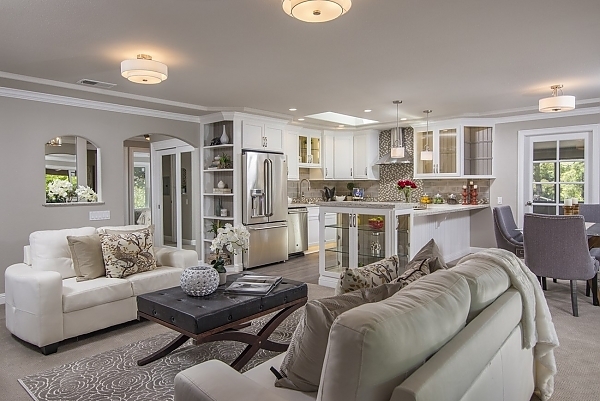 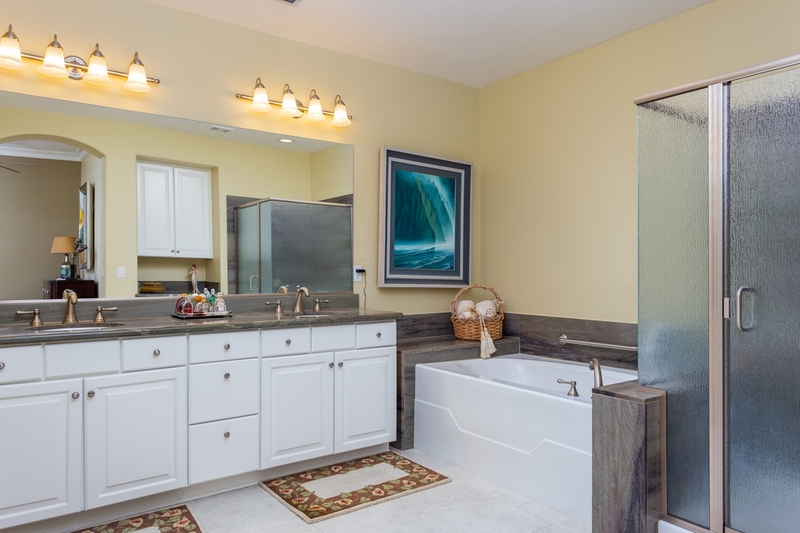 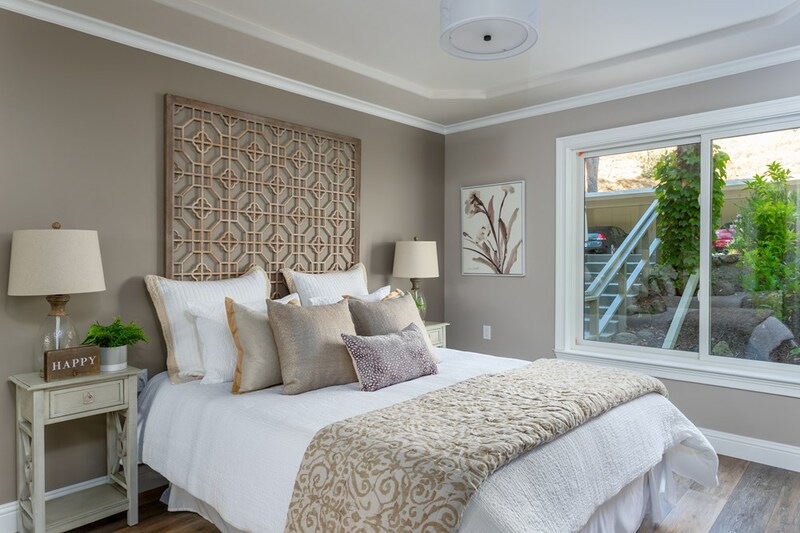 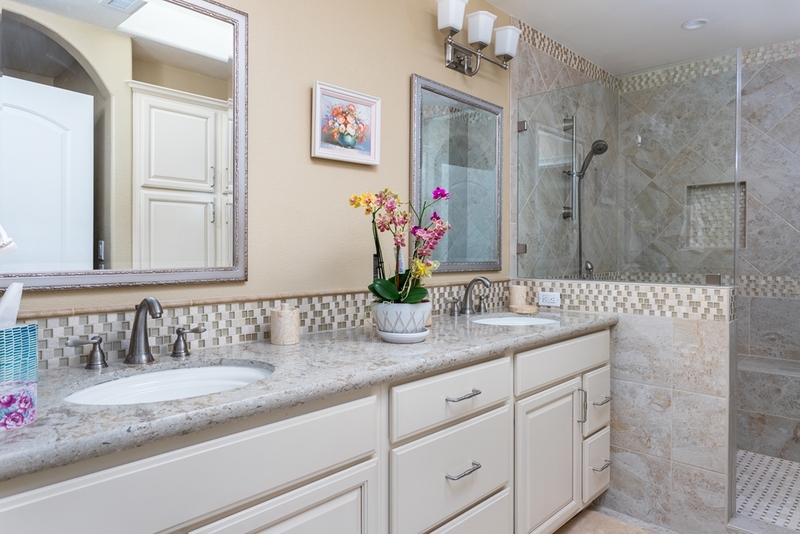 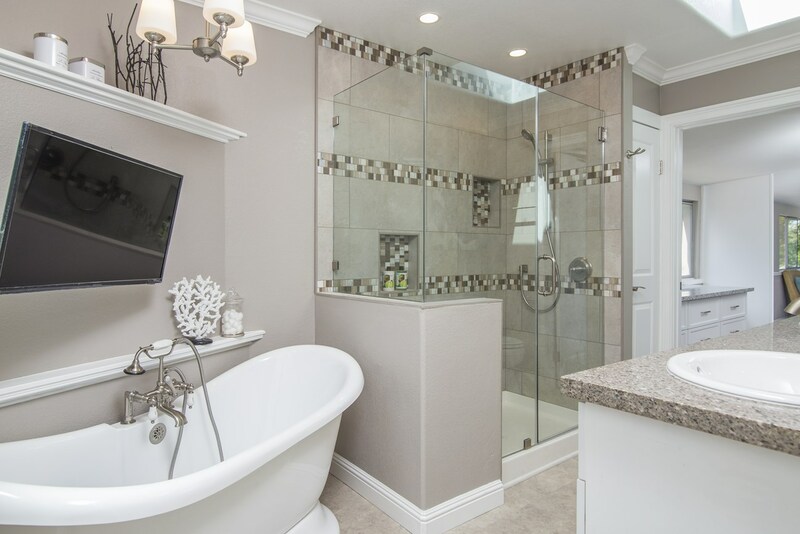 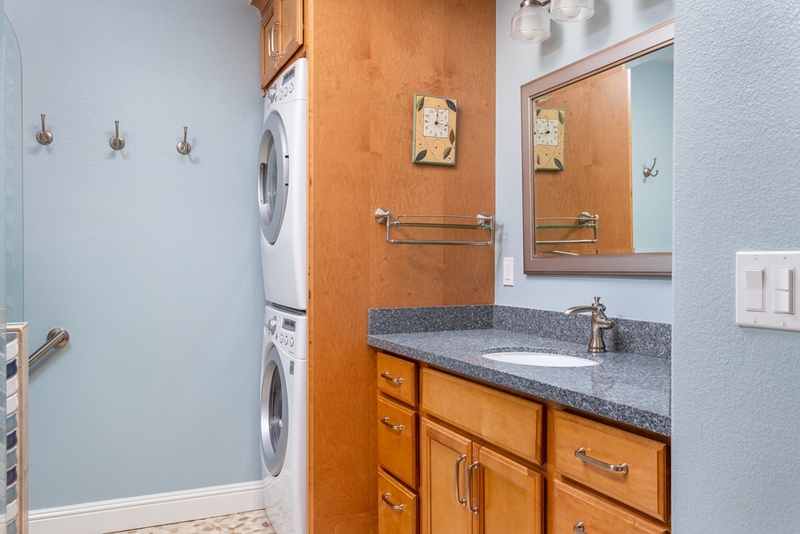 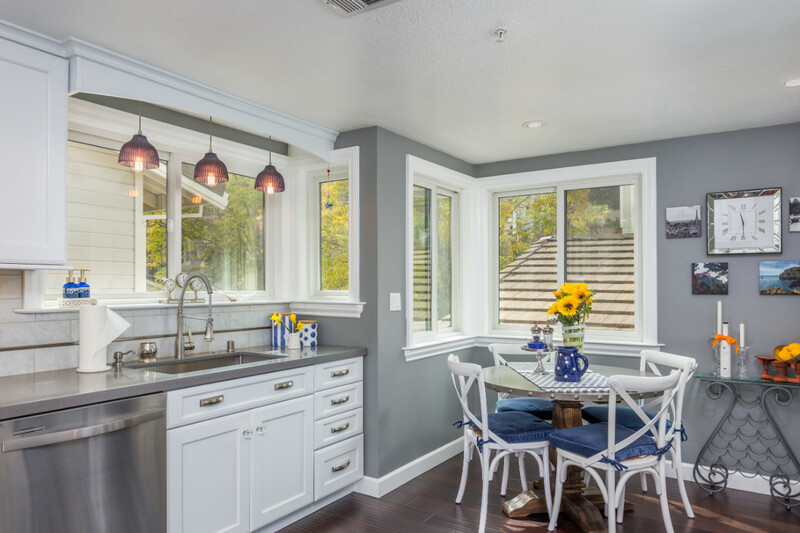 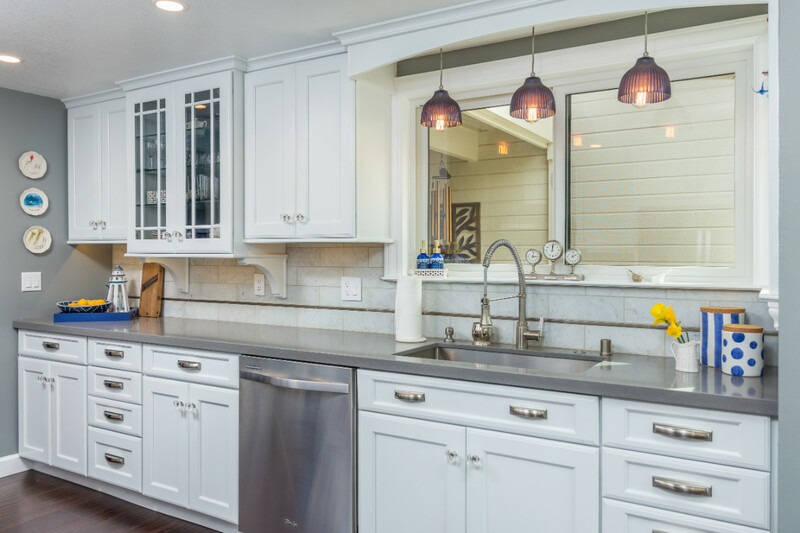 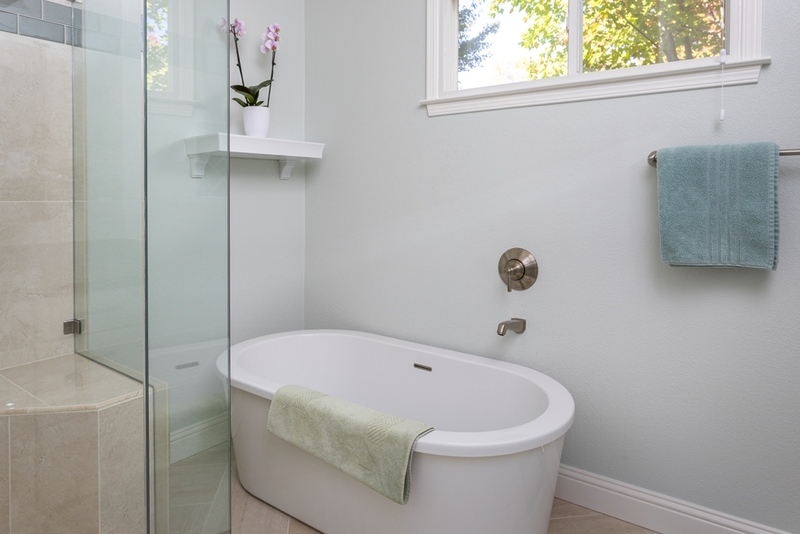 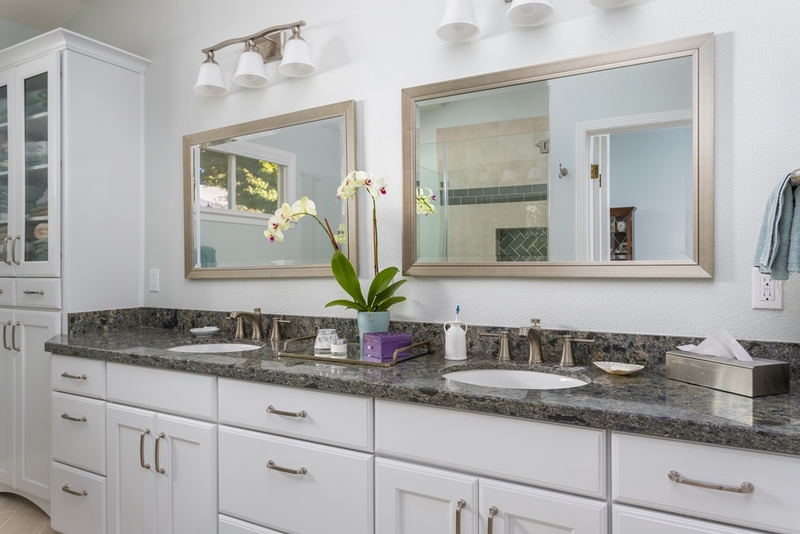 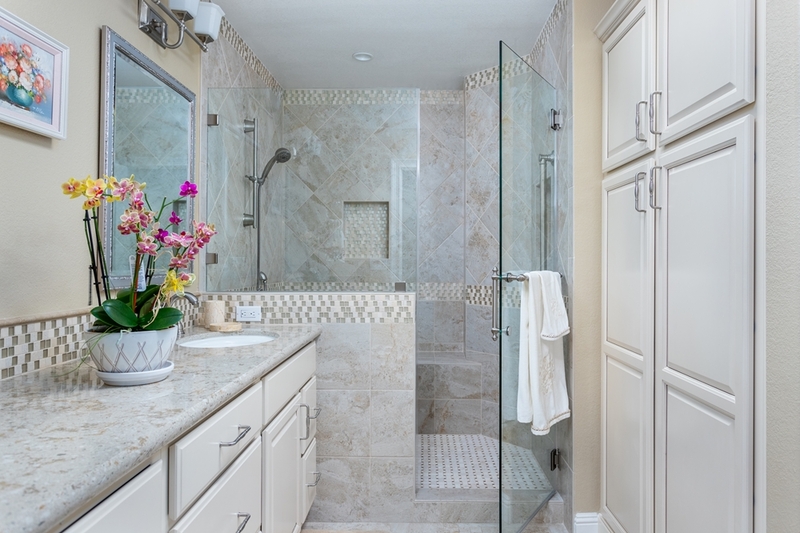 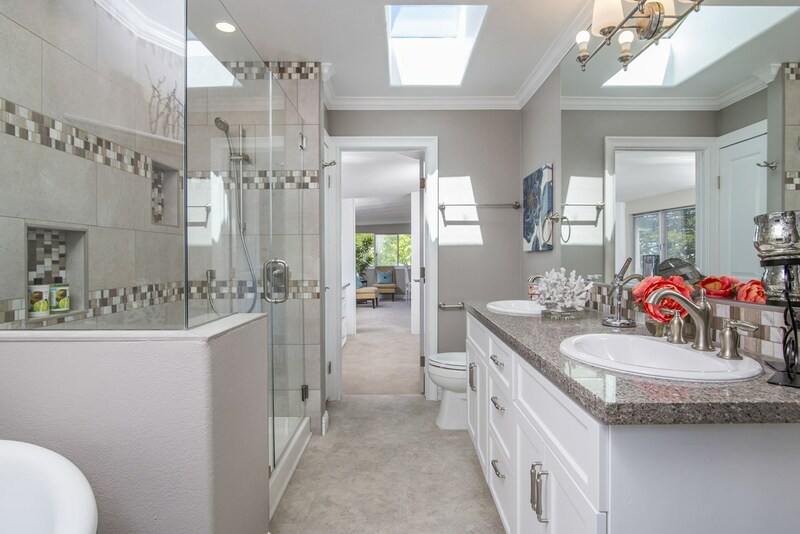 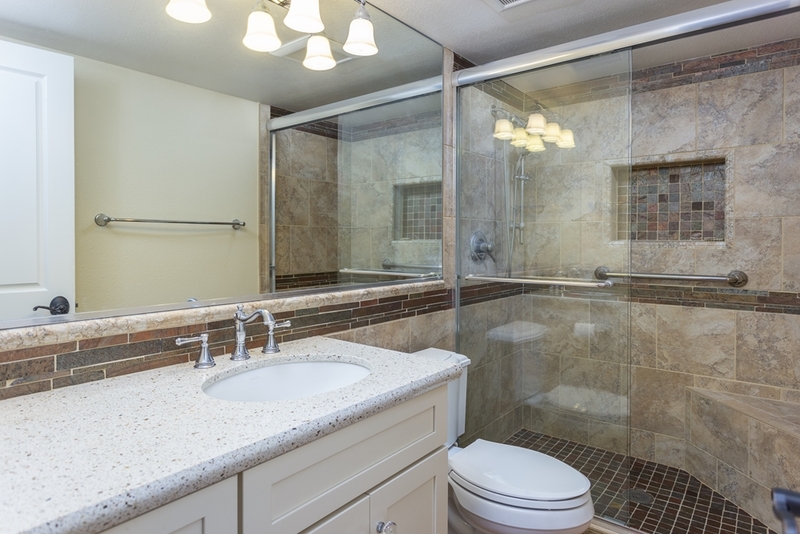 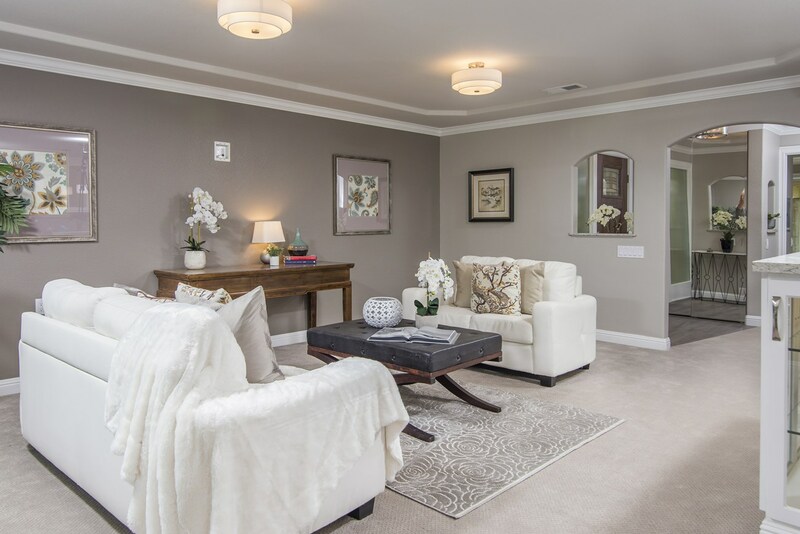 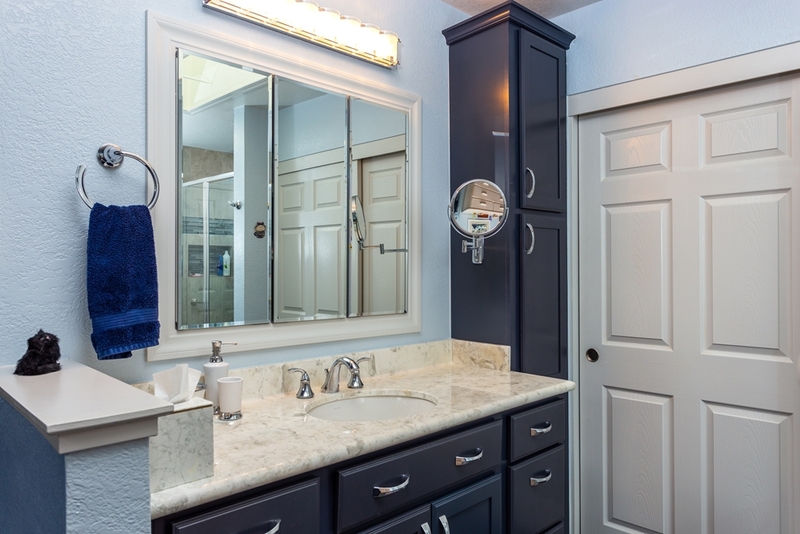 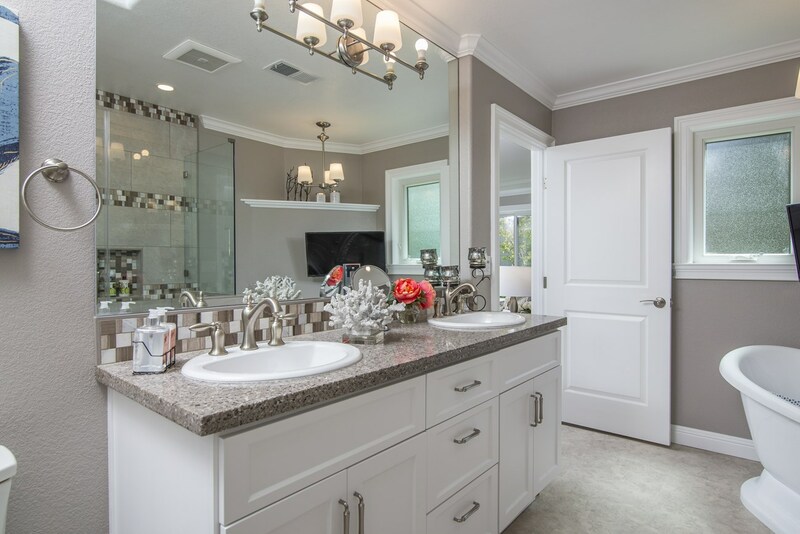 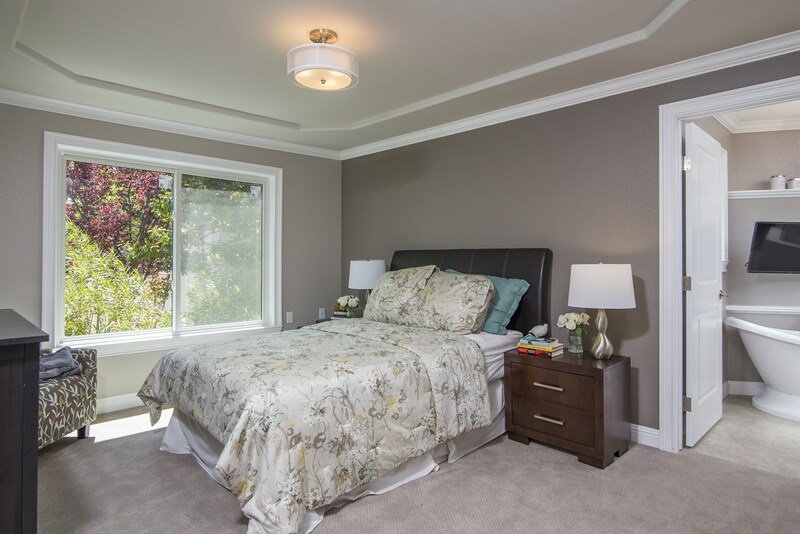 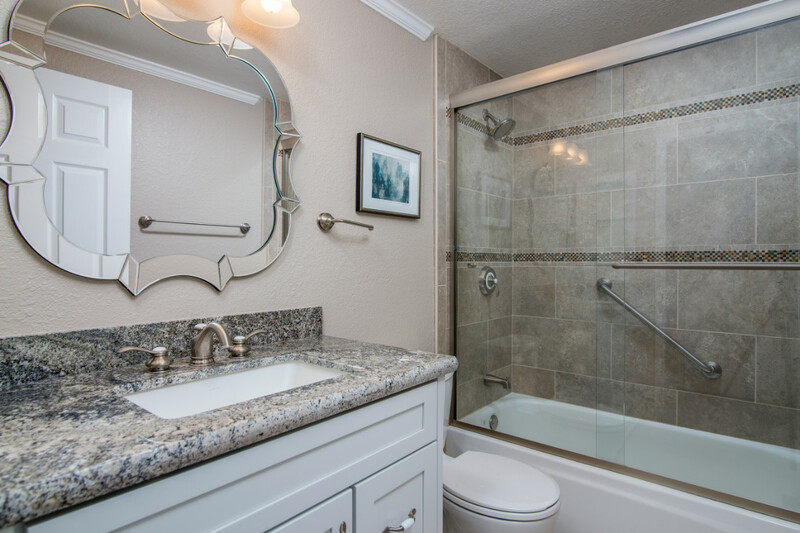 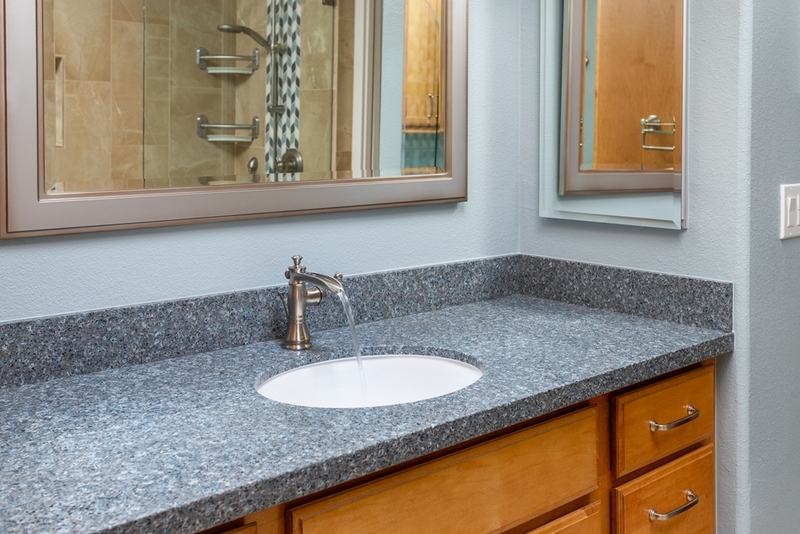 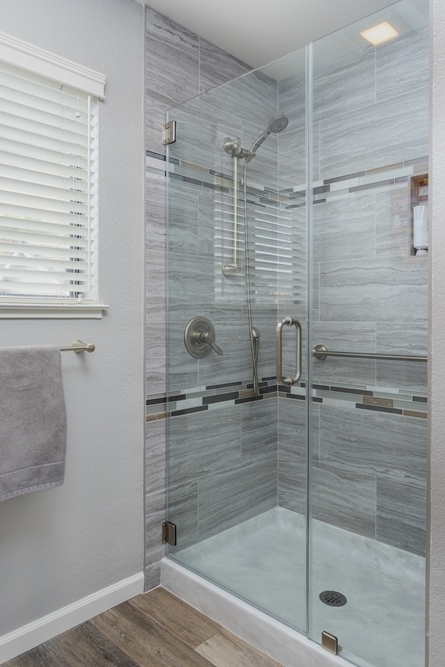 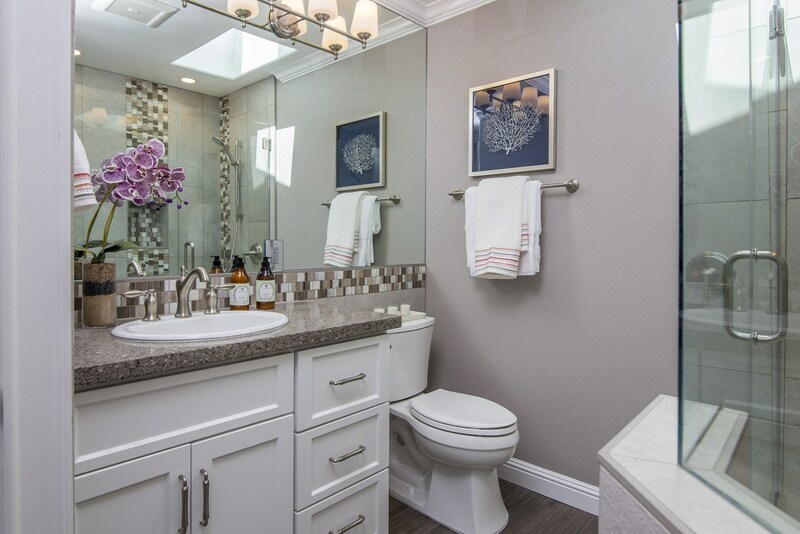 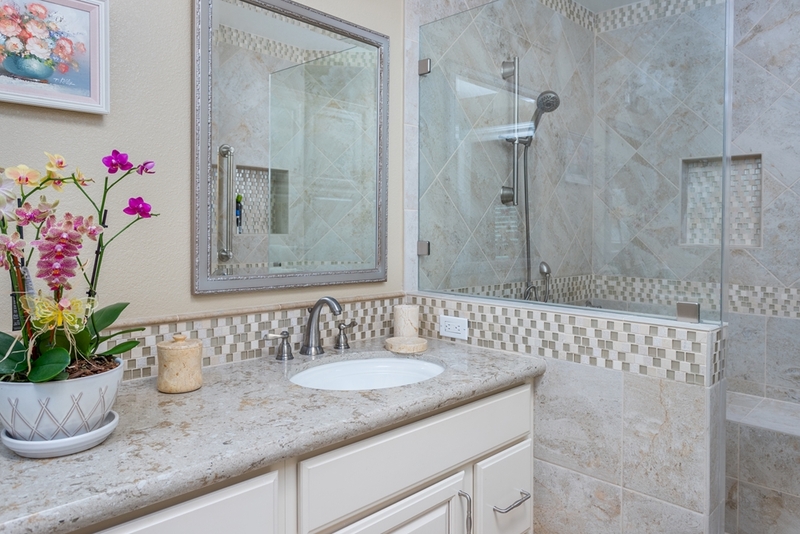 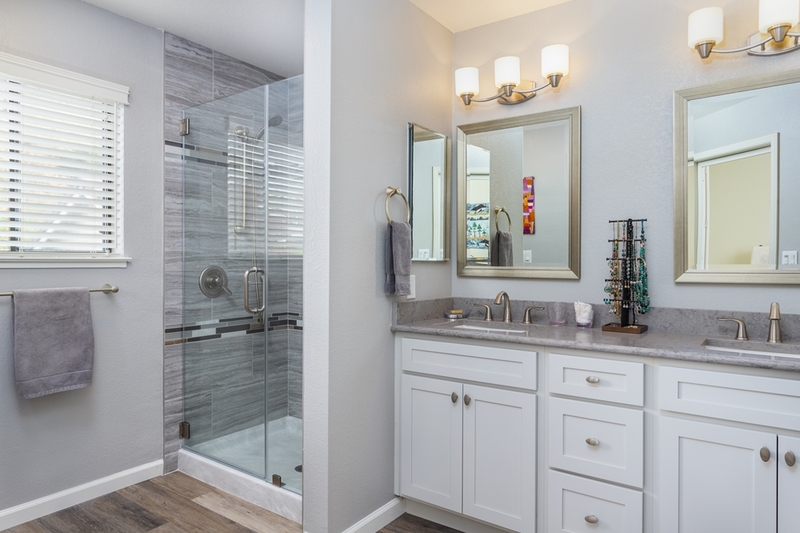 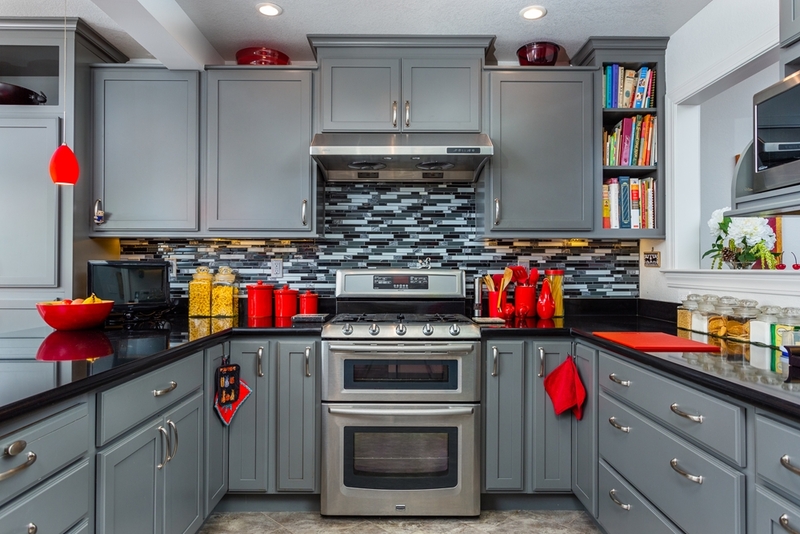 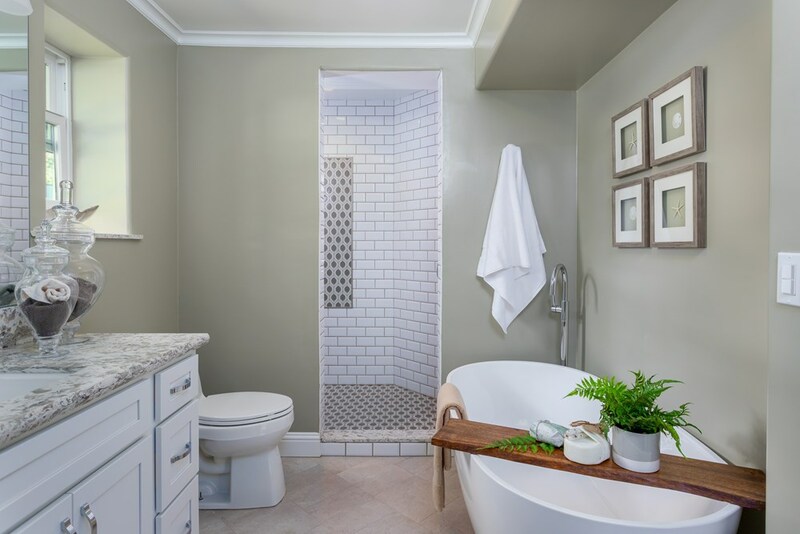 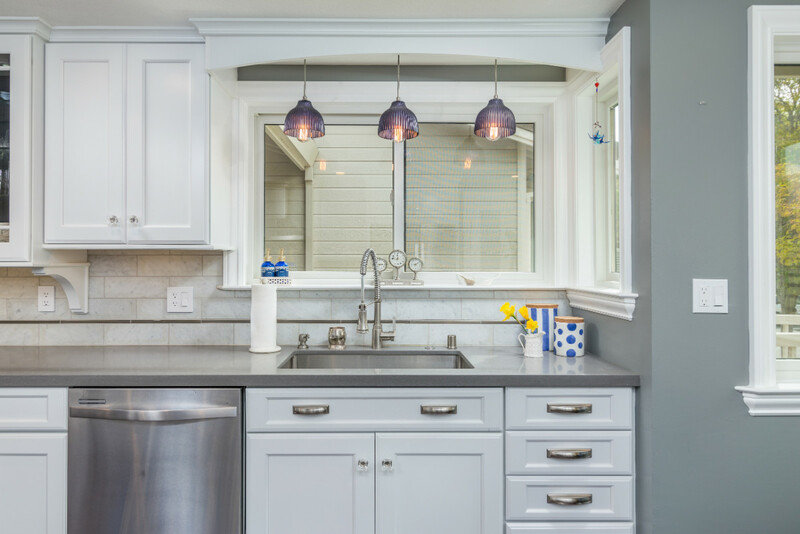 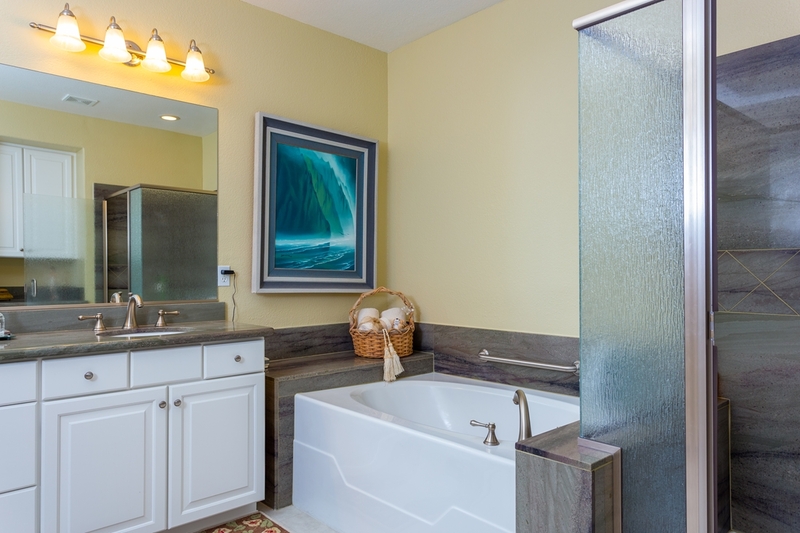 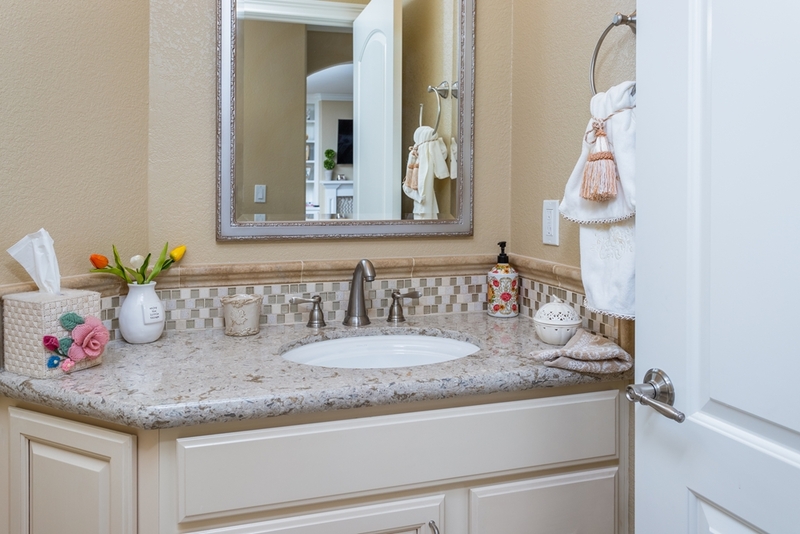 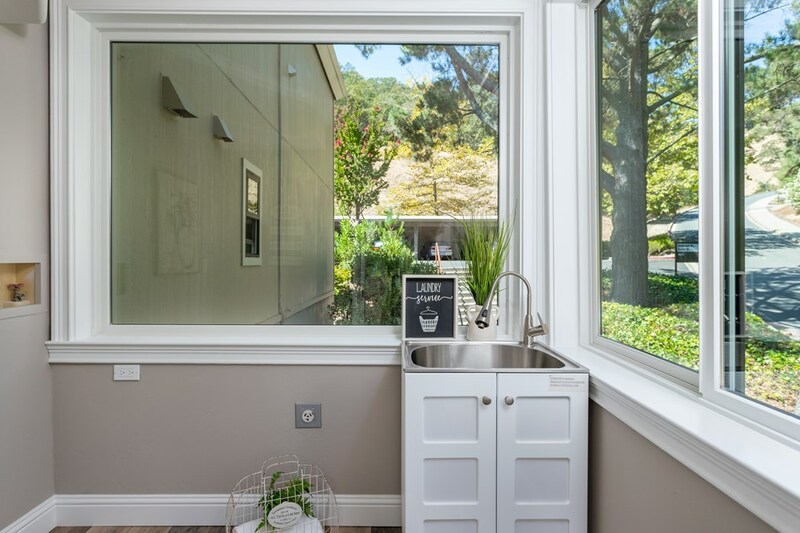 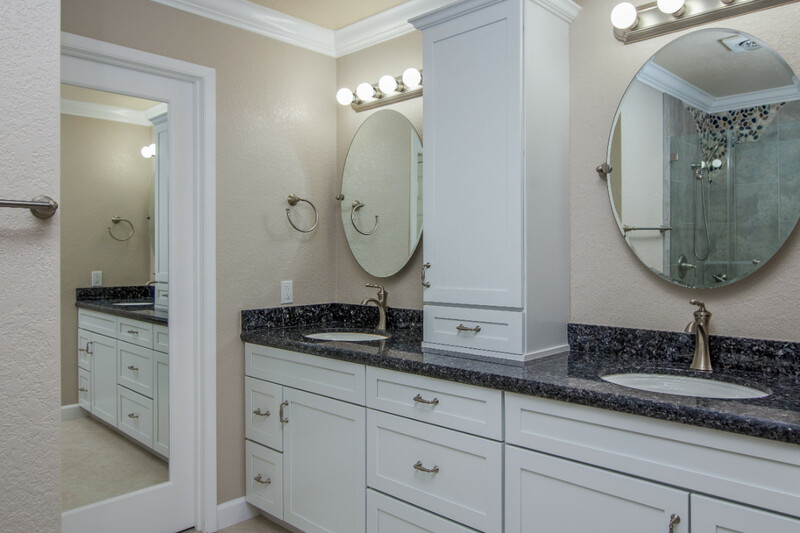 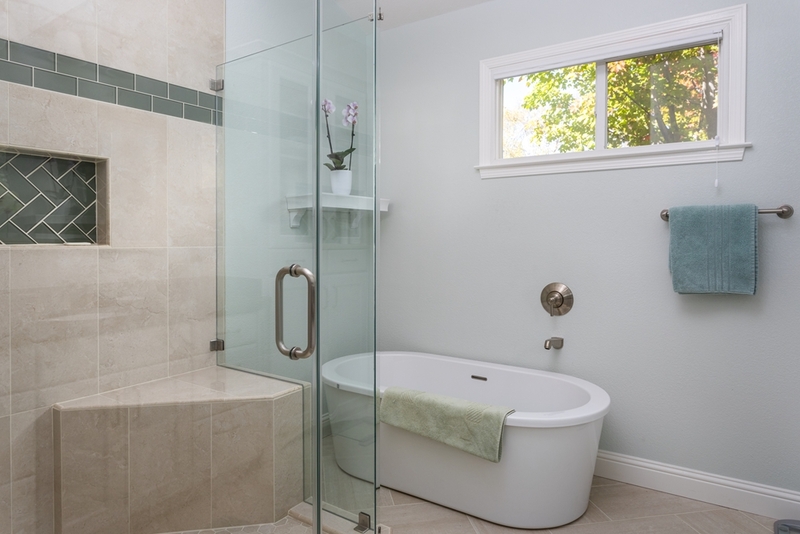 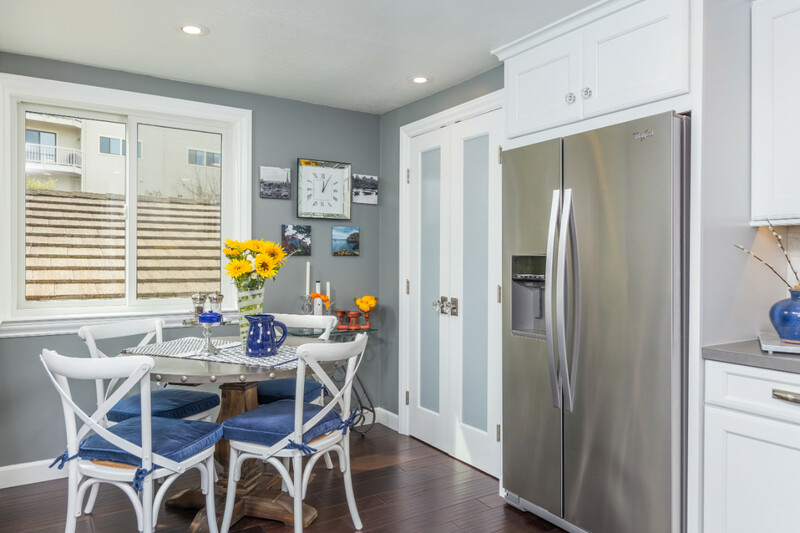 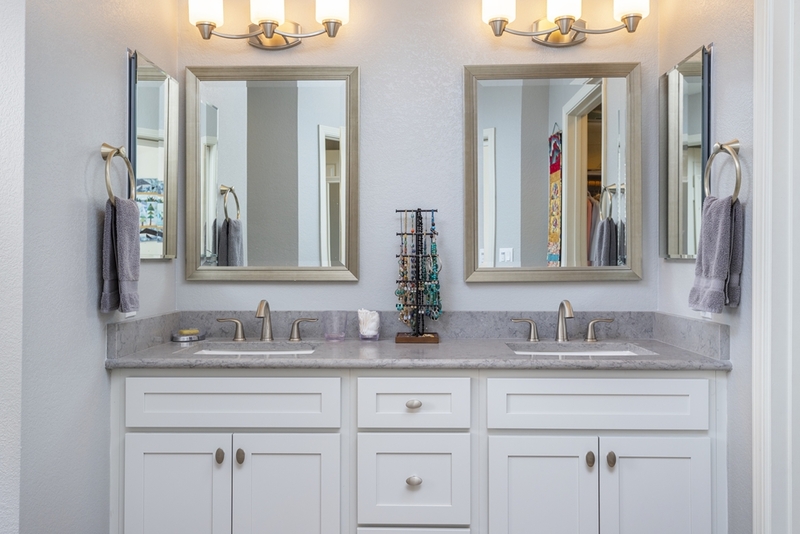 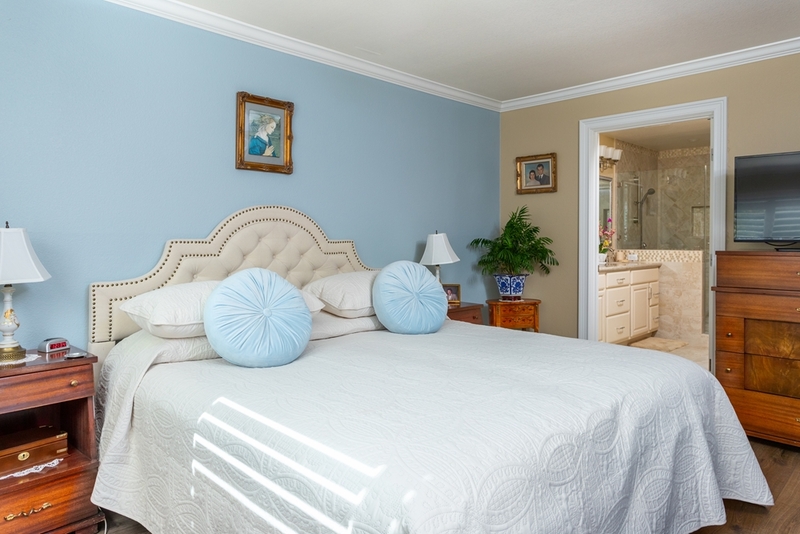 Soft warm gray tones were used throughout the kitchen and master bathroom space which was also updated.